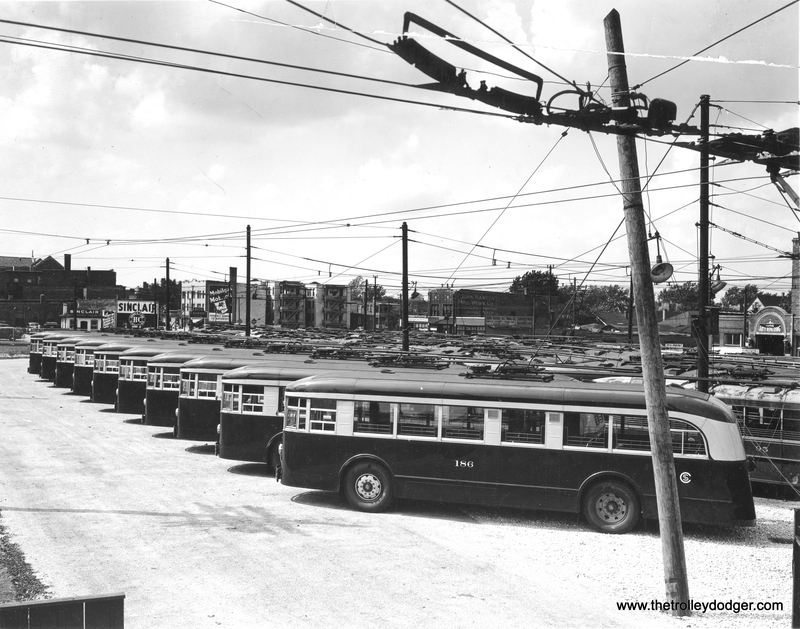 A lineup of CSL trolley buses purchased in 1937 from Brill. 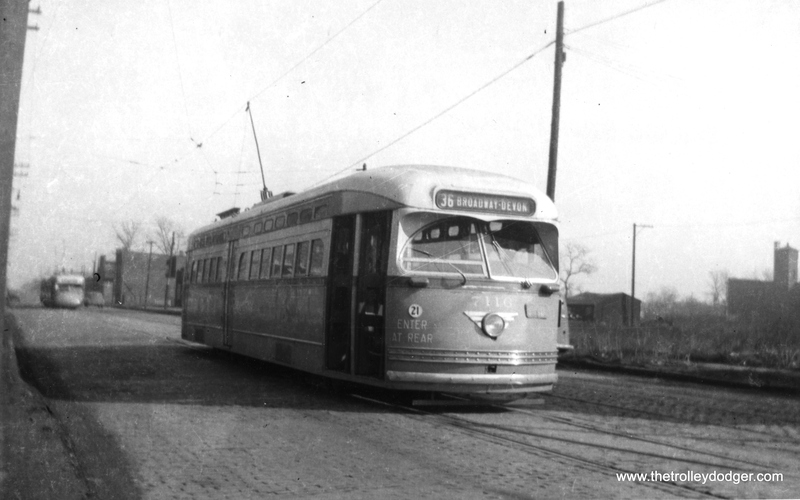 The location probably Central and Avondale, now the site of the Kennedy expressway. 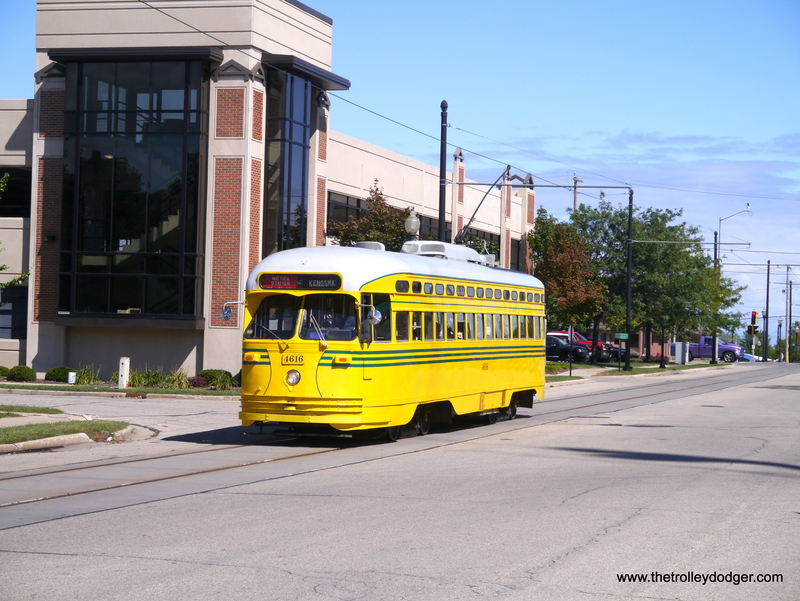 We generally don’t feature buses on this blog, since our main interest is in streetcars, light rail, and electric rail transit. 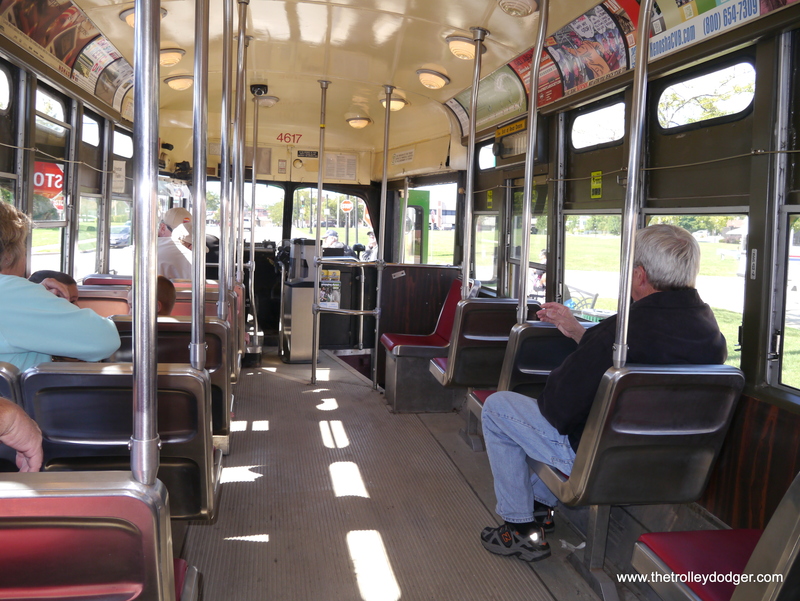 But we do get requests to post more bus photos, and we are fortunate to have some excellent ones to show you today, thanks to the incredible generosity of George Trapp. Mr. Trapp has been collecting these type of pictures for nearly the last 50 years, and we thank him for sharing them with us. 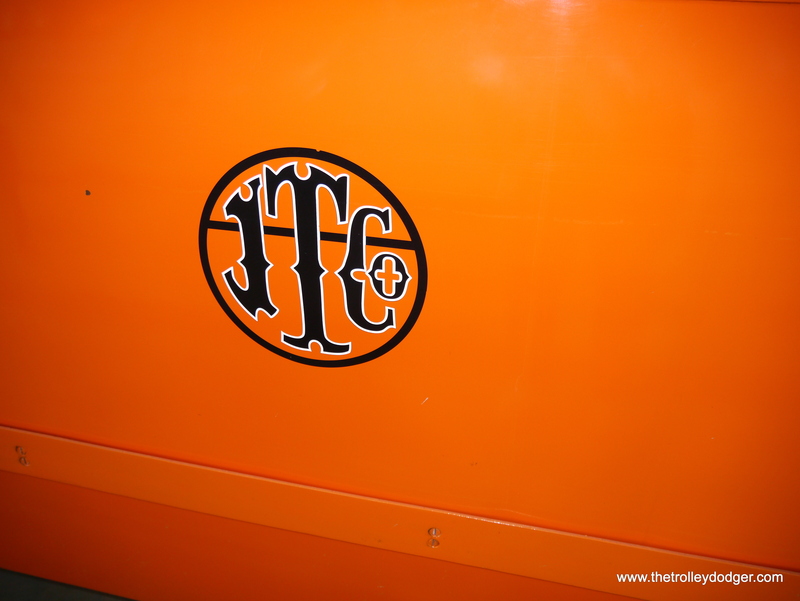 We featured some of Mr. Trapp’s PCC pictures in our last post, and there will be several more such posts to come in the near future. Watch this space for more great Chicago PCC pictures. 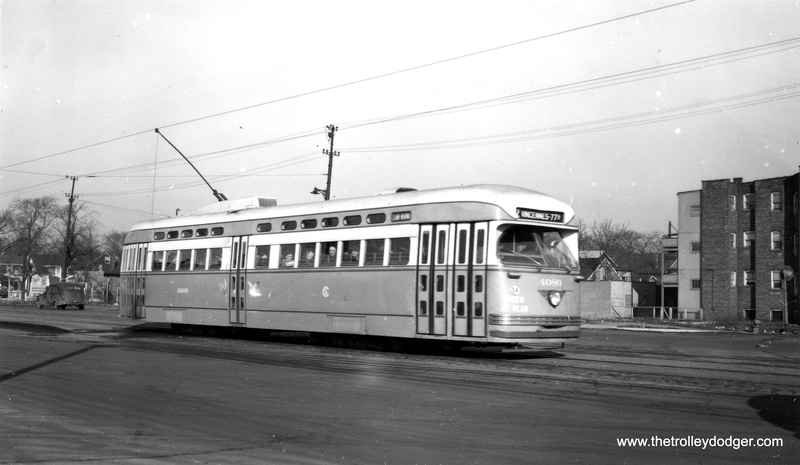 From 1930 to 1947, the Chicago Surface Lines had an operating philosophy called “Balanced Transit,” whereby streetcars were for the ehaviest lines, trolley buses for the medium-sized routes, and gas or diesel buses for the lightest lines. 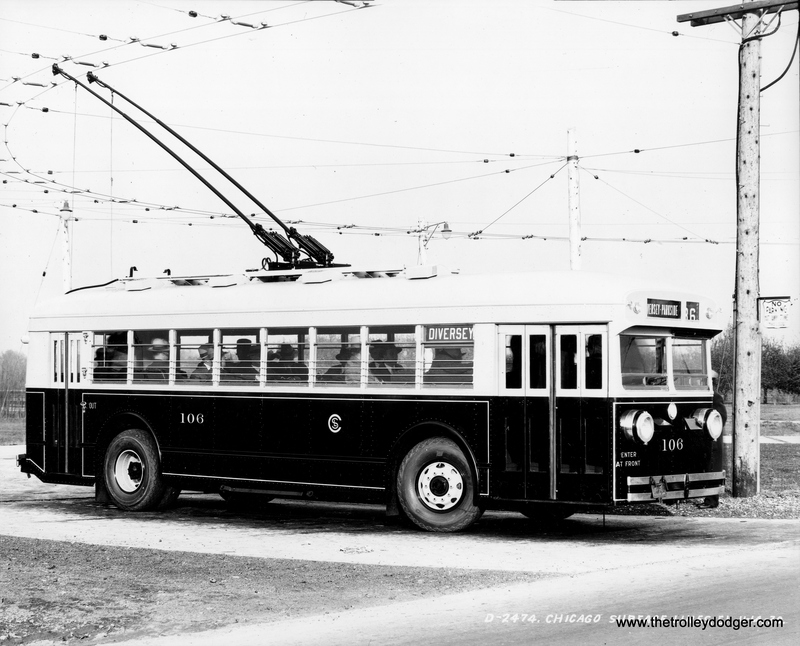 Trolley buses were first used on new routes that went into the northwest side of Chicago, which was then developing rapidly. 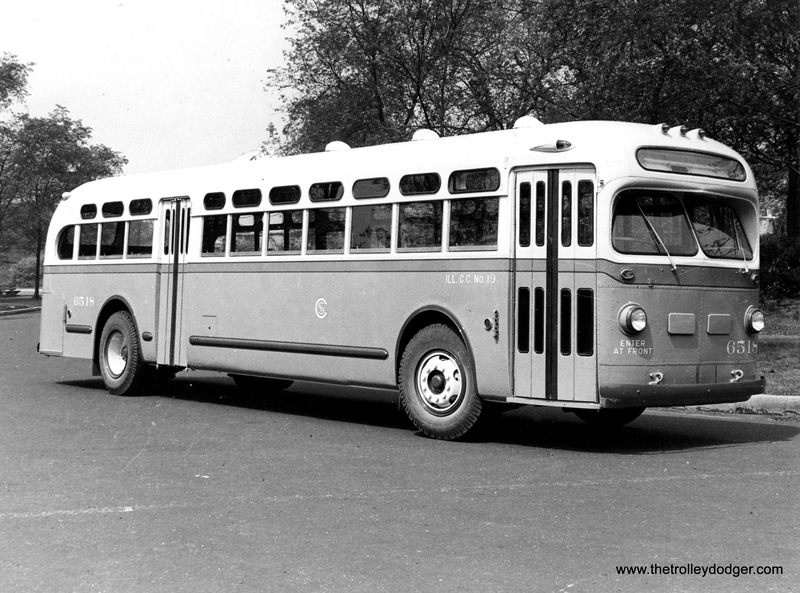 There had been a competition between CSL and the Chicago Motor Coach Company to see which firm would get these routes, and CSL won out. 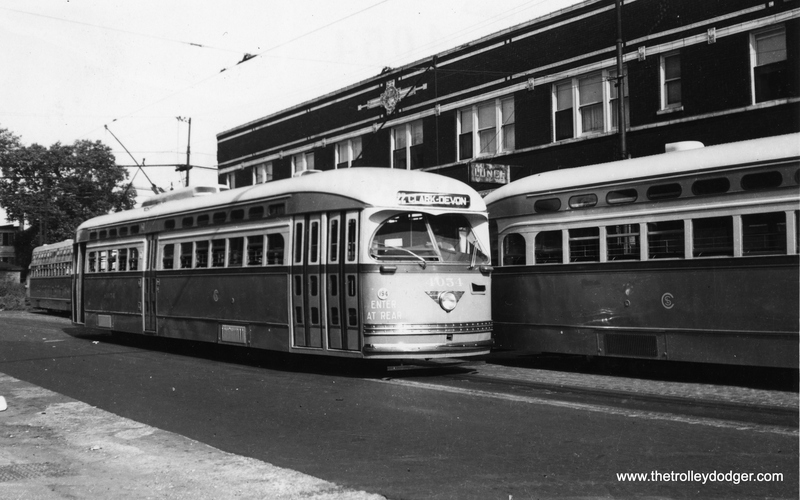 While it may be that their intention was to eventually convert trolley bus lines to streetcar once they had developed sufficient ridership, in actual practice, this never happened. 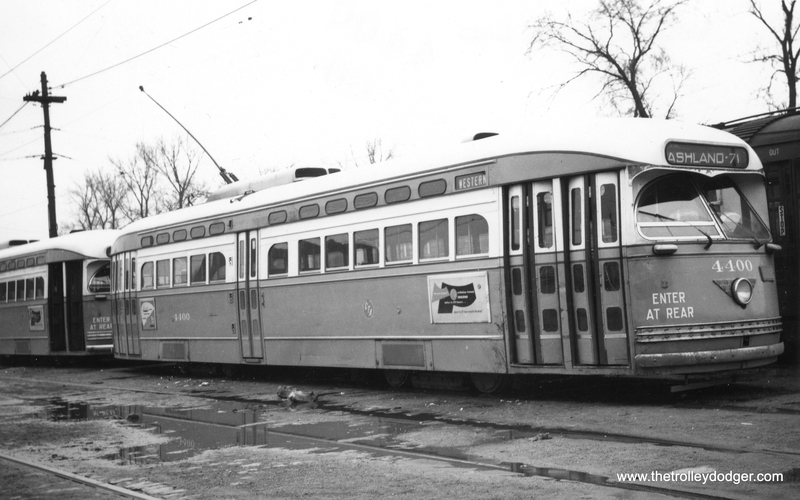 The Chicago Transit Authority took over from CSL on October 1, 1947, and converted some additional streetcar lines to trolley bus. 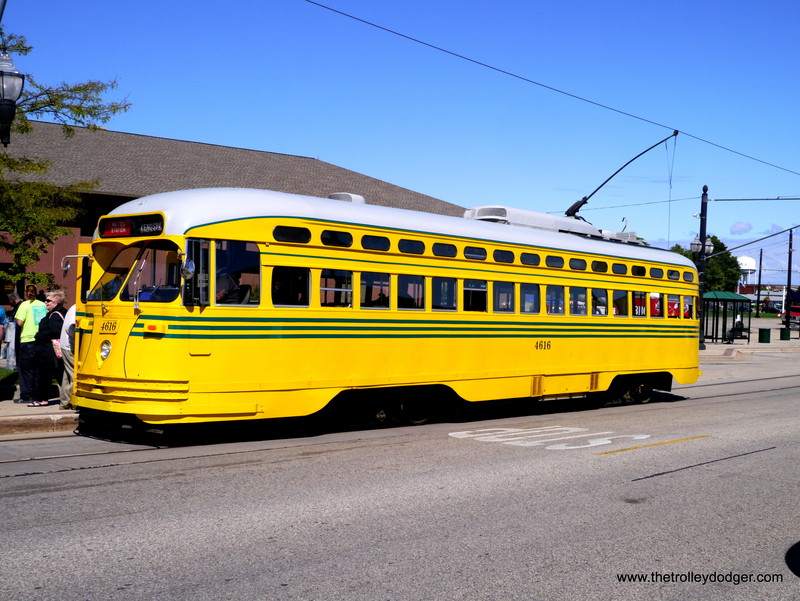 But the last such vehicles were purchased circa 1951 and by 1959, one year after streetcar service ended in Chicago, began a gradual phase-out of trolley buses in Chicago. 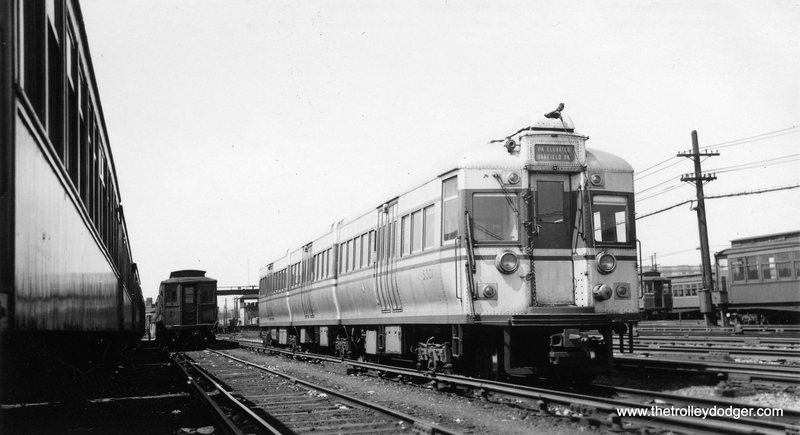 The last one ran in 1973. 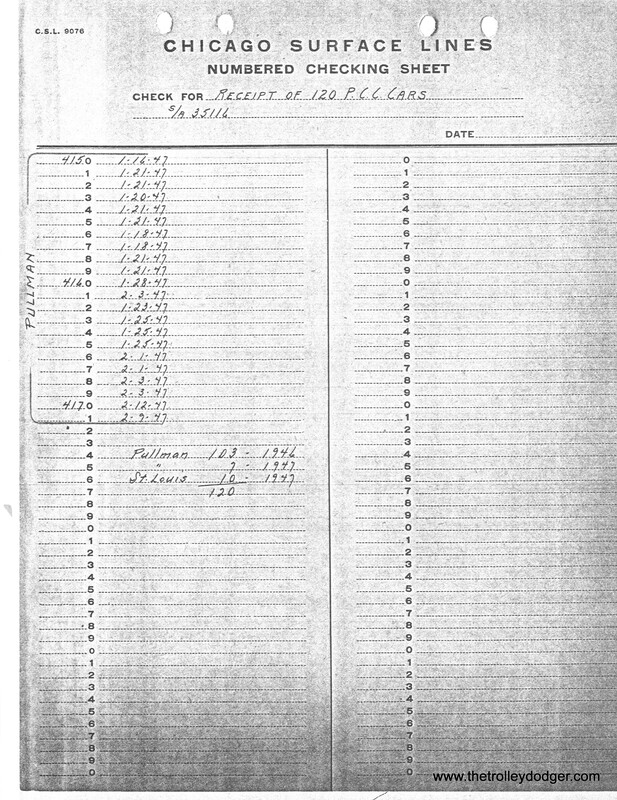 A 1951 CTA consultant’s report, the full text of which is included in out E-book Chicago’s PCC Streetcars: The Rest of the Story (available in our Online Store), recommended that the agency not purchase any more electric vehicles, due to the cost of electric power purchased fro Commonwealth Edison. 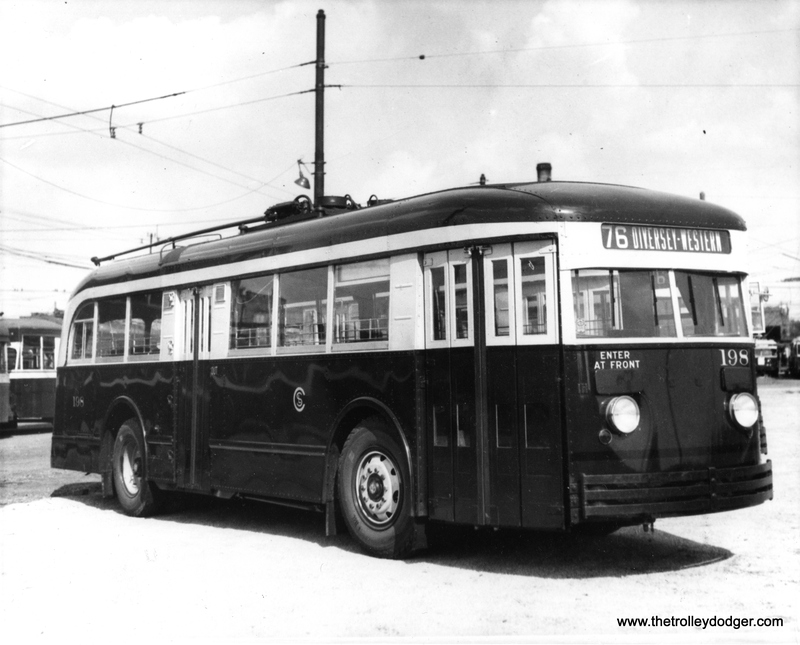 A 1954 study by CTA Board member Werner W. Schroeder (which is also included in our E-book) said that trolley buses were the most profitable vehicles used by the CTA, but explained this away by saying they were being used on the cream of the routes. 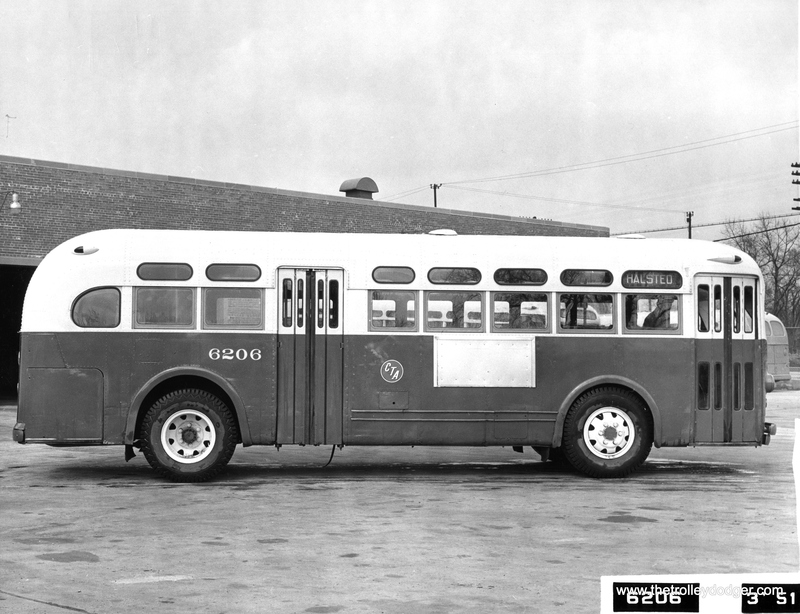 During the 1950s, CTA’s preferred type of surface vehicle was the propane-powered bus. Propane was very cheap for most of the decade, but by 1960 costs had risen to the point where there was no cost advantage over diesels. 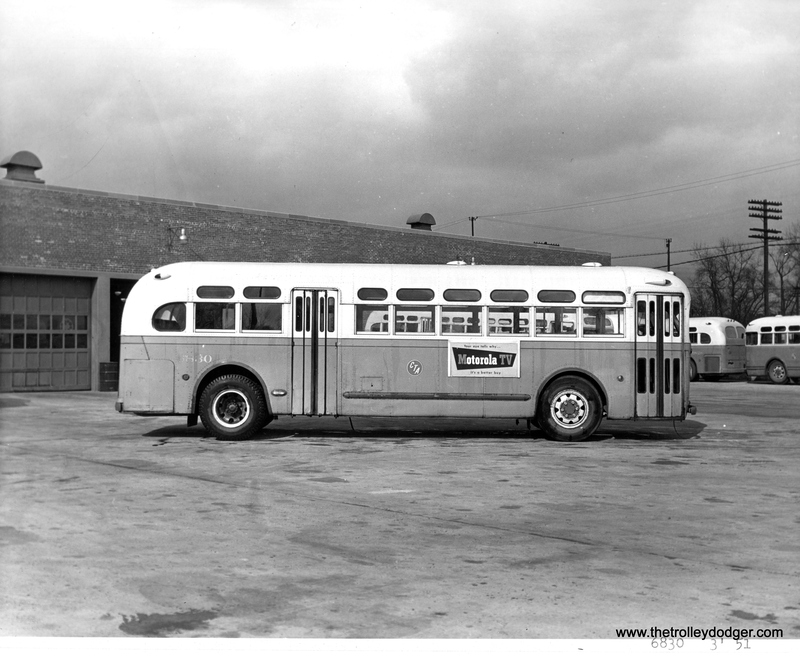 There were many operational problems with propane buses, which were underpowered, sluggish, and had difficulty maintaining schedules. There were also a few spectacular fires and explosions involving propane. 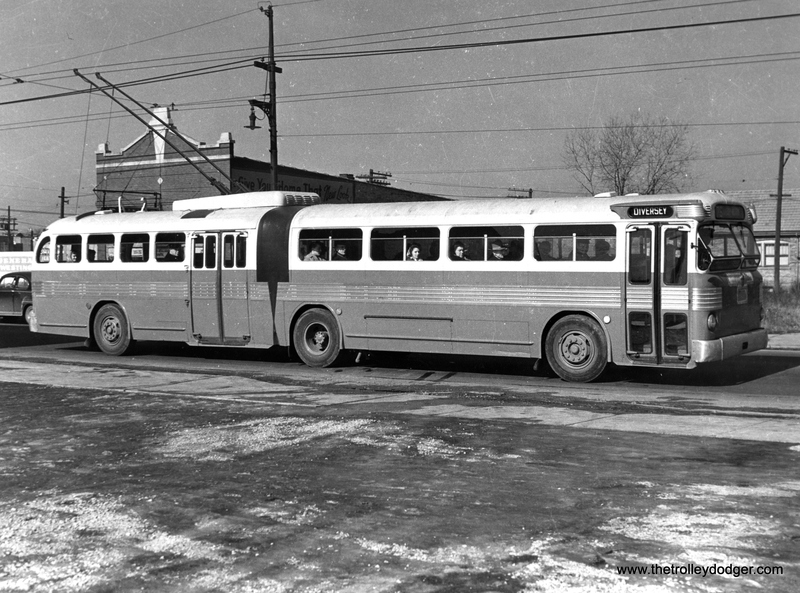 The propane vs. diesel debate prompted a rare public spat between Chicago Transit Board members, which was settled when the CTA began purchasing GM diesel buses in 1961. 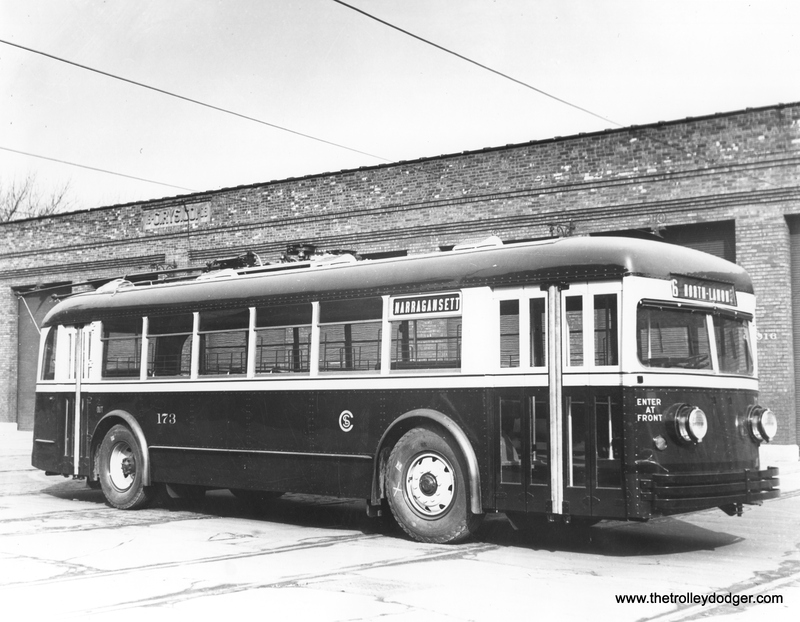 The heyday of the propane bus, once the CTA’s darling, proved to be much shorter and less successful than that of the trolley bus (aka trolley coach or trackless trolley), which was fast, quiet, efficient, and very popular with the riding public. 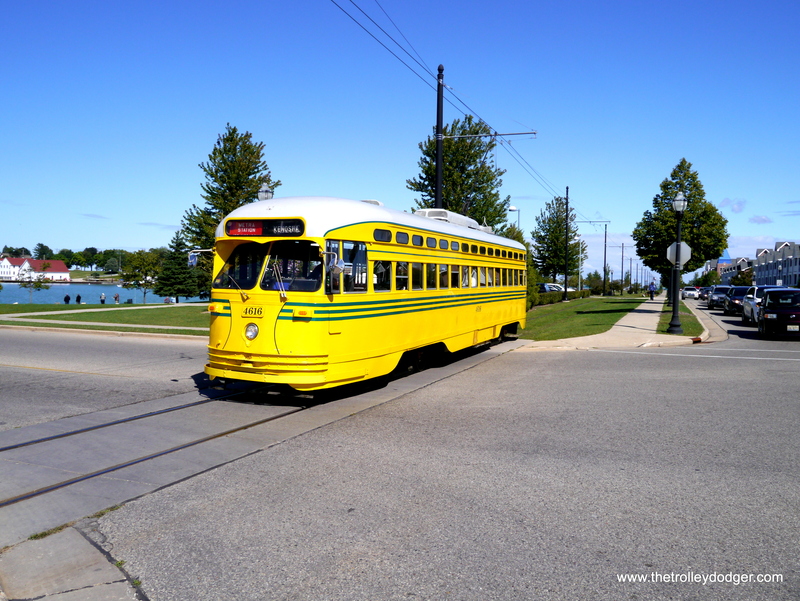 Trolley buses are still being used in a half dozen North American cities, more than 40 years after Chicago stopped using them. 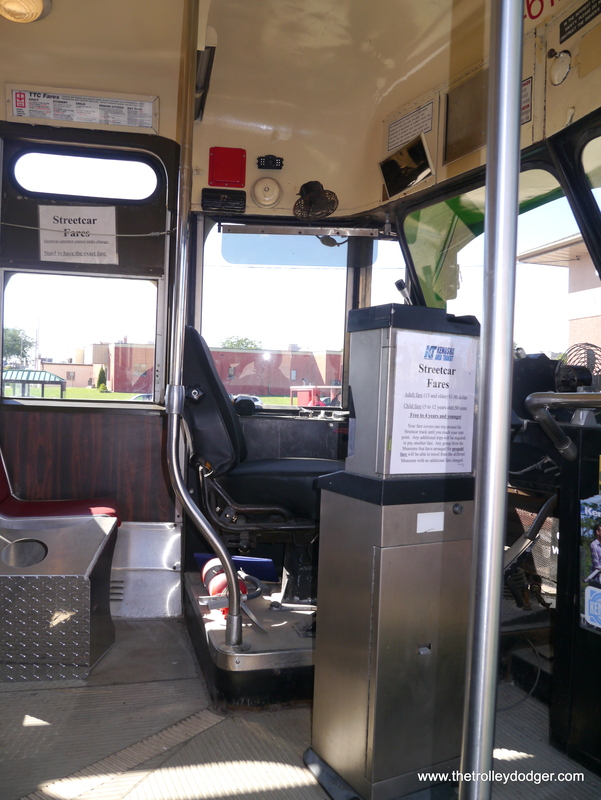 Today, the only electric buses on the CTA system are a couple of battery-powered ones recently put into use. 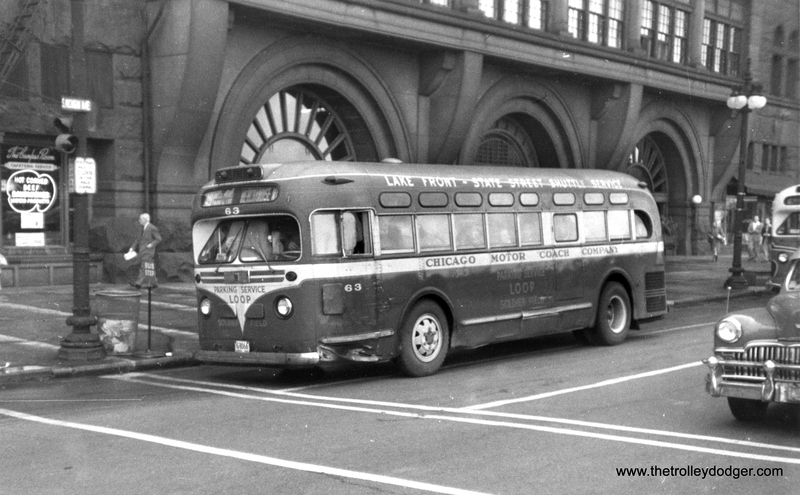 Most of today’s pictures feature buses purchased by the Chicago Surface Lines prior to the 1947 CTA takeover. 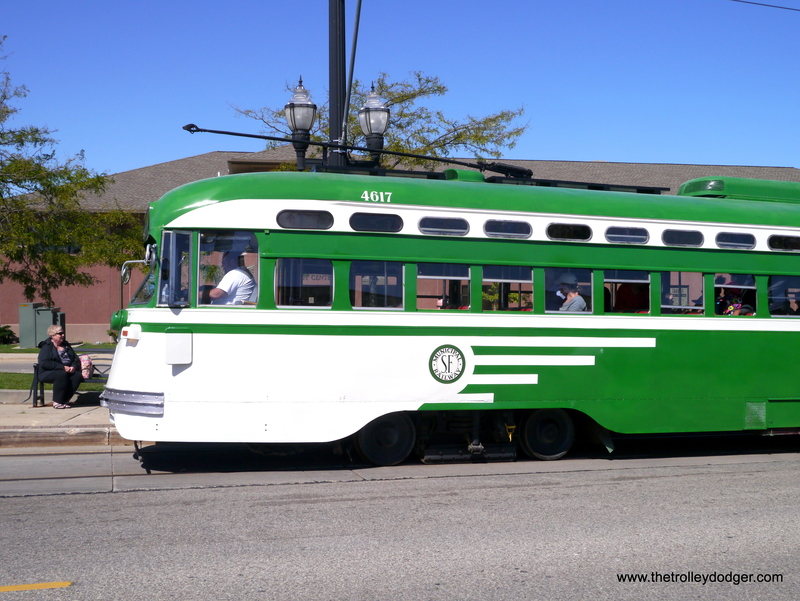 PS- Today (September 30th), The Trolley Dodger blog reaches another milestone with 75,000 page views, and has been read by over 22,000 individuals. We thank you for your continued support. 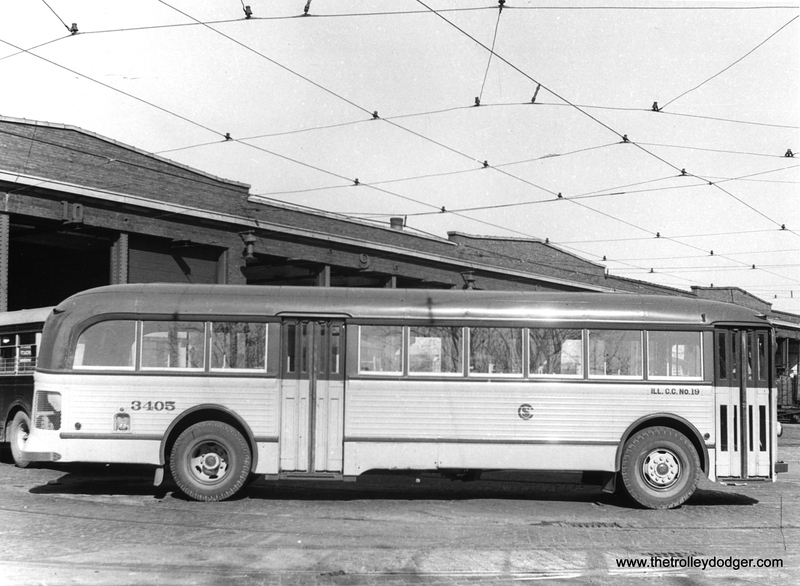 CSL 6410, a General Motors gas bus from the 6401-6410 series, on March 5, 1944. 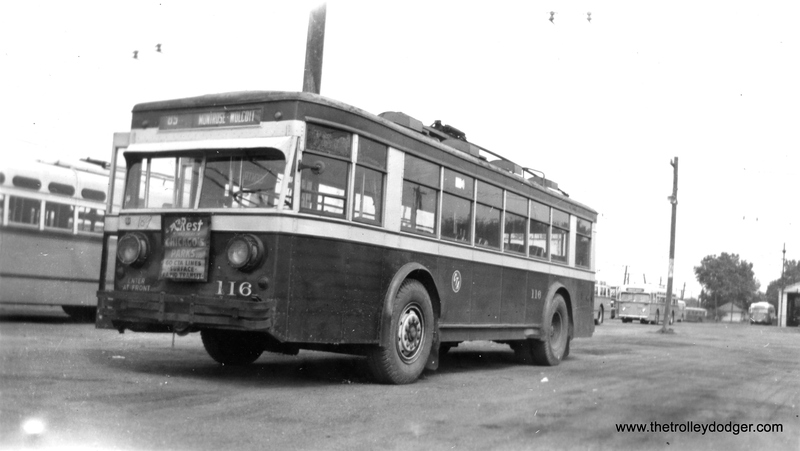 CSL 506, an ACF gas bus, in 1935. 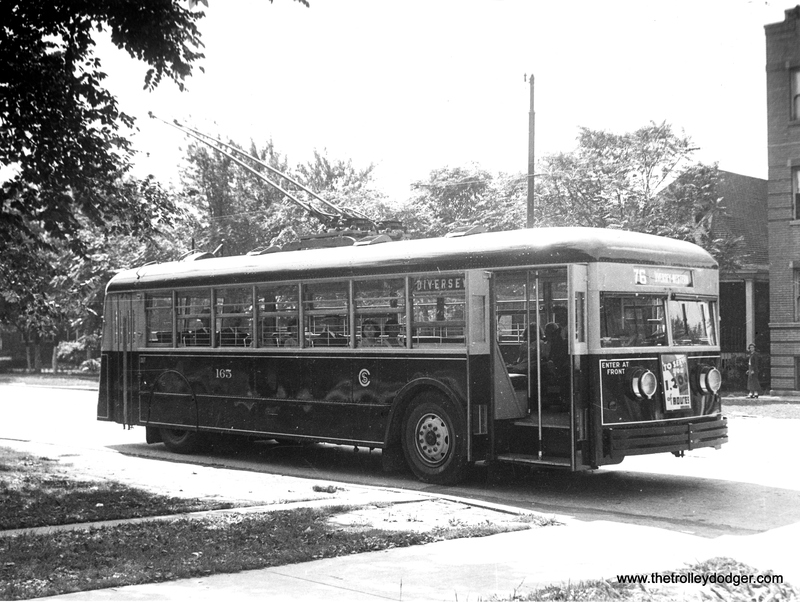 A CTA trolley bus used on route 80 – Irving Park. 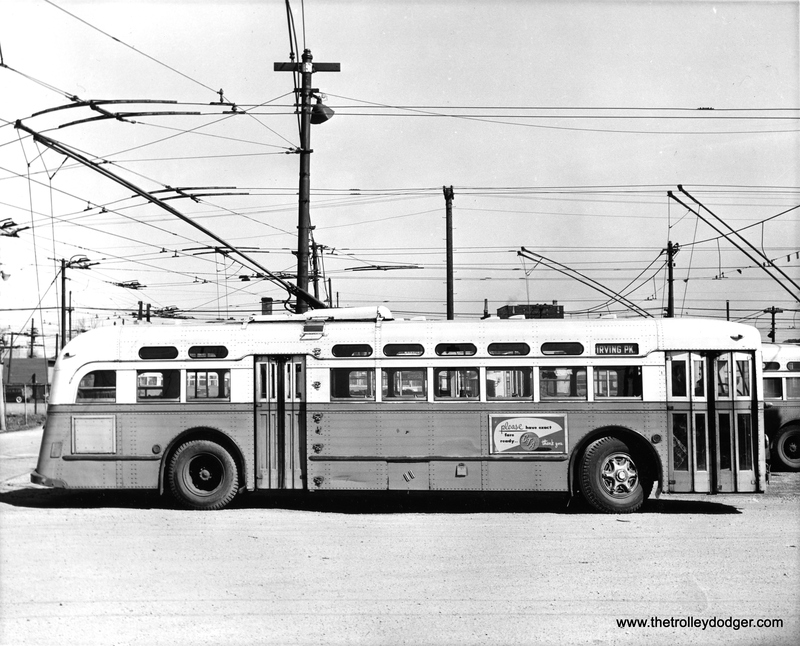 CTA trolley bus 192, signed for route 72 – North Avenue. 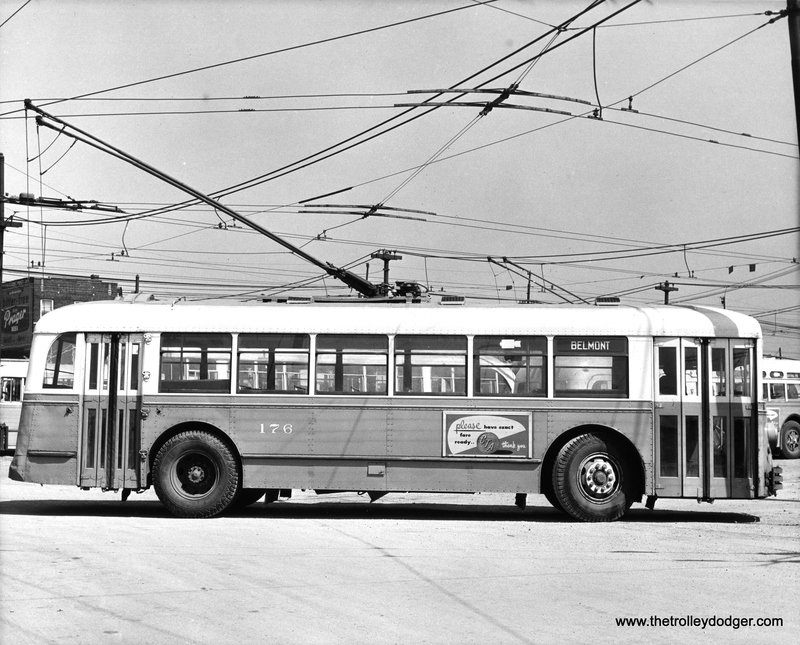 CTA trolley bus 176, signed for route 77 – Belmont. 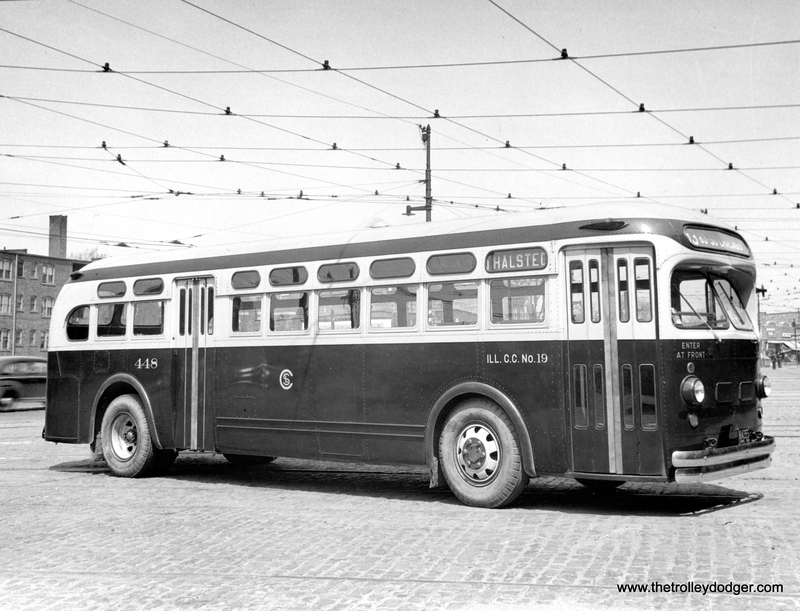 CSL trolley bus 116, signed for route 85 – Central Avenue. I like to think of this web site as a collaborative effort with our readers. Since we started this enterprise at the beginning of this year, I believe I have learned as much from you as vice versa, and today’s post is but the latest example of how that can work to everyone’s benefit. If people are willing to share their material with us, and this seems to be happening with increasing frequency, it is probably because our previous 80 posts have shown that we are serious about the original research we are engaged in, and sharing it with you. 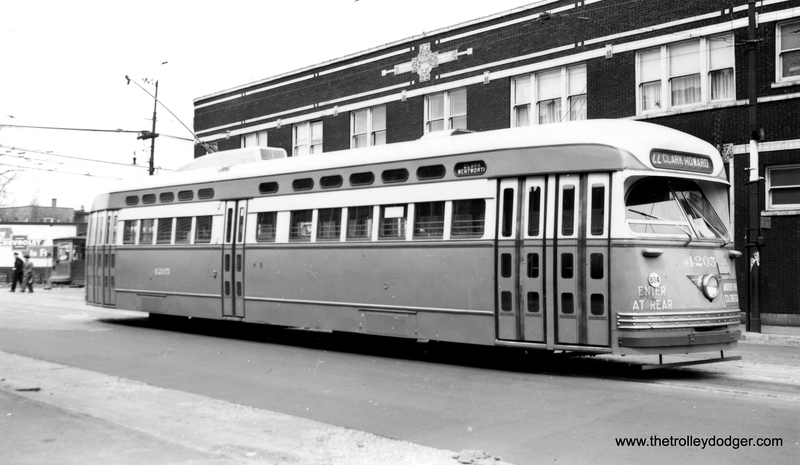 Thanks to the incredible generosity of George Trapp, we now have close to another 150 images of Chicago PCC streetcars that we can post. Nearly all of these are previously unknown to me. 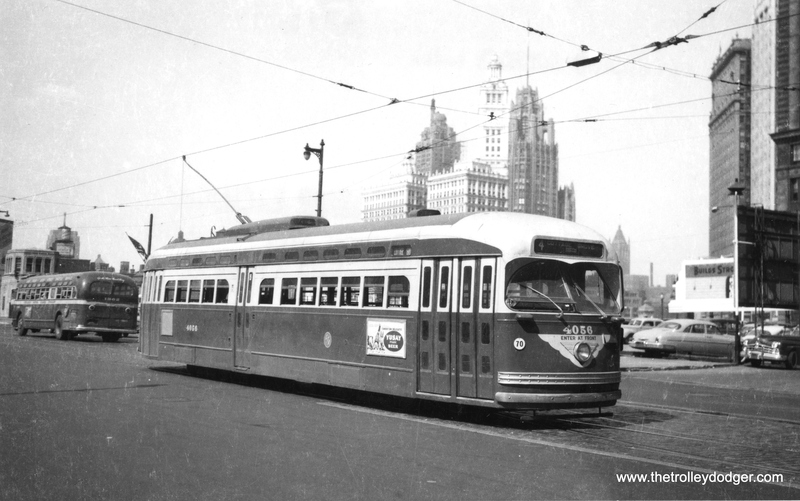 Mr. Trapp has been collecting these type of pictures for nearly the last 50 years, and has let us borrow some of them so that we might feature them here and add them to our electronic book Chicago’s PCC Streetcars: The Rest of the Story, which is available through our Online Store. 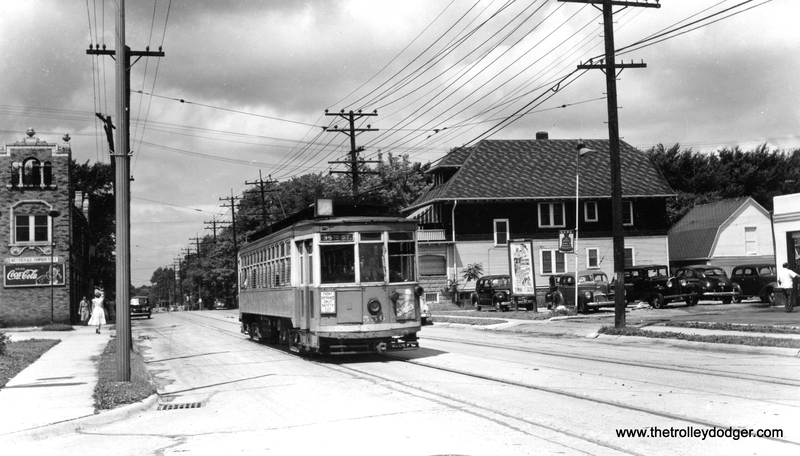 This being our 81st post, perhaps it is fitting that several of the pictures here were taken at 81st and Halsted. 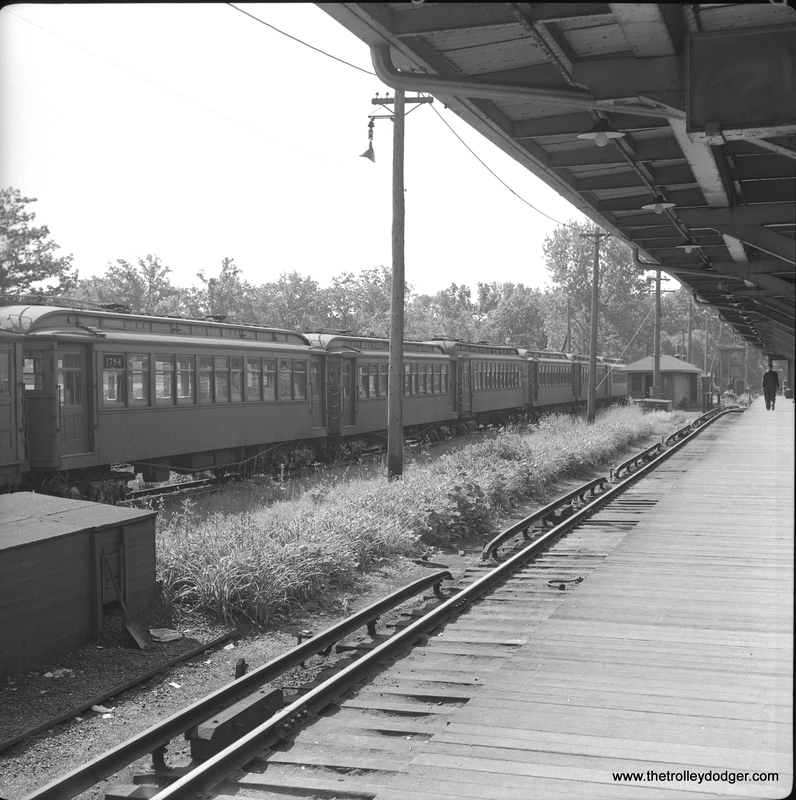 PS- I did some checking on the Railway Negative Exchange, the source for many of the photos in today’s post. It was started by Warren Miller (1923-1989) who operated out of California. Upon Mr. Miller’s passing, his collection went to his nephew, Bob Hall, who I understand was still continuing these efforts as of 1996. I do not know whether they are still in business today. 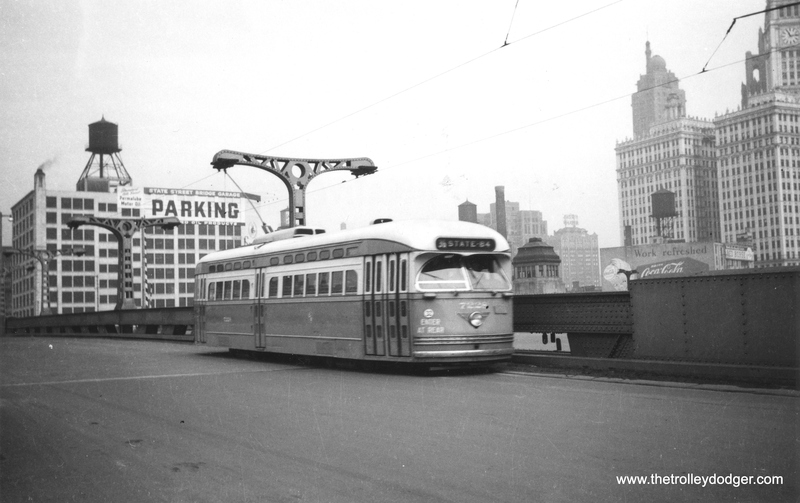 All the photos from today’s post, and many more courtesy of Mr. George Trapp, are being added to our E-book this week, along with a section covering Chicago’s rapid transit system early in the CTA era. 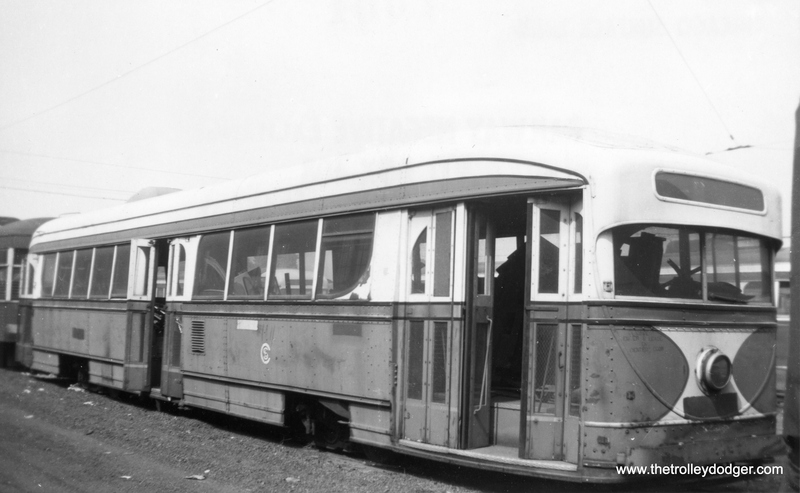 Experimental 1934 pre-PCC car 4001, built by Pullman. 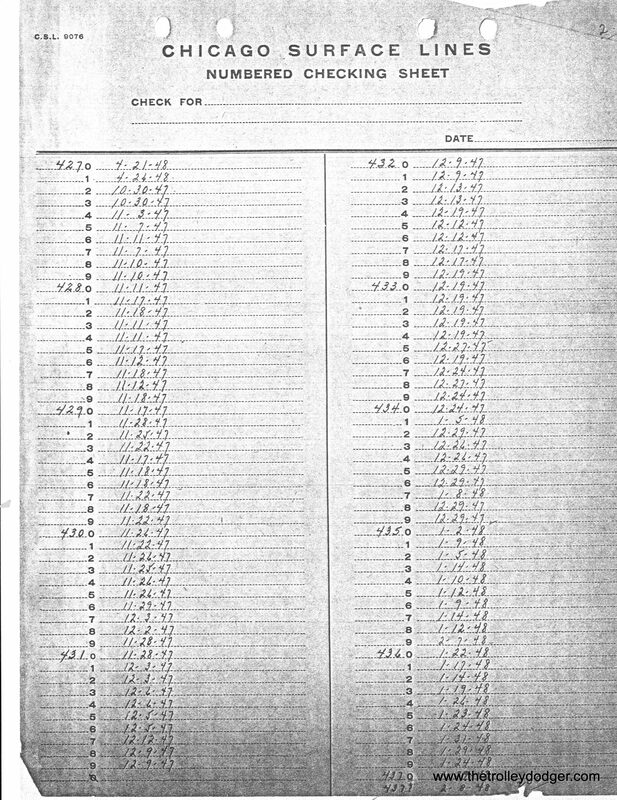 This is similar to a photo on page 5 of CERA Bulletin 146, although it is a different photo. They may have been taken at the same time, however, and if so, the date would be July 1936. 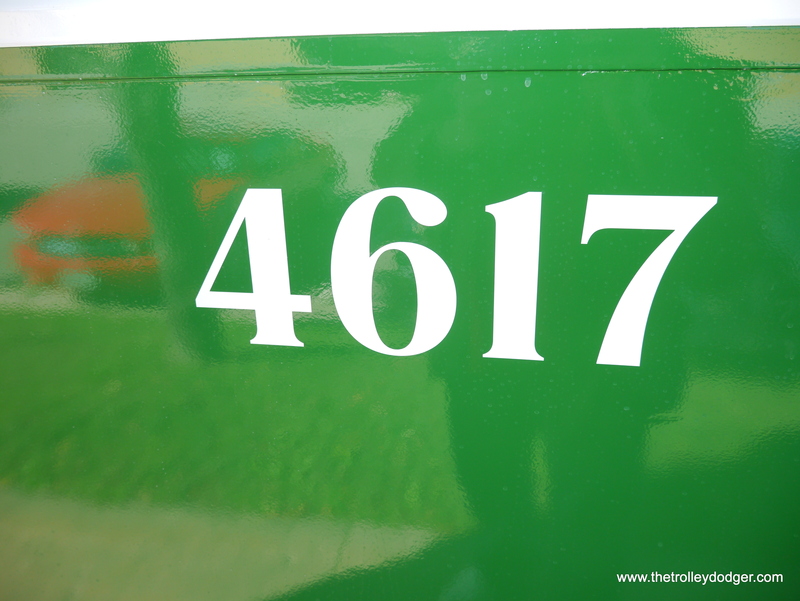 The location is 78th and Vincennes. 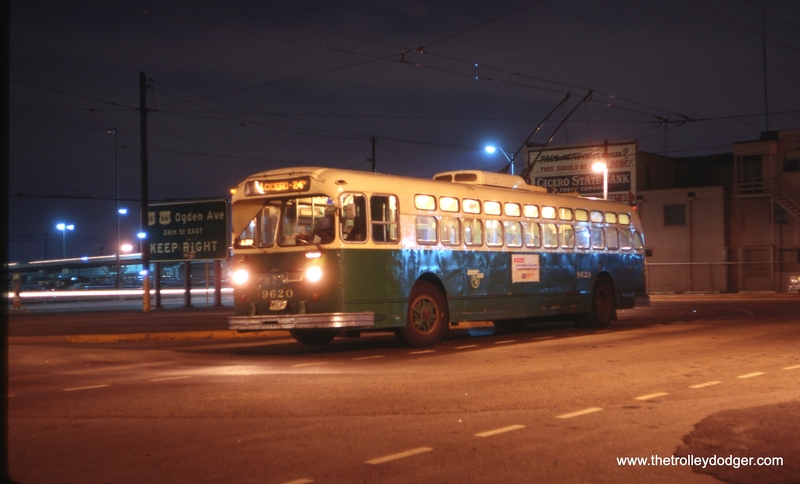 It’s definitely early, since the trolley is still painted like a barber pole. Some PCCs are visible at rear in this view of the barn at 77th and Vincennes. 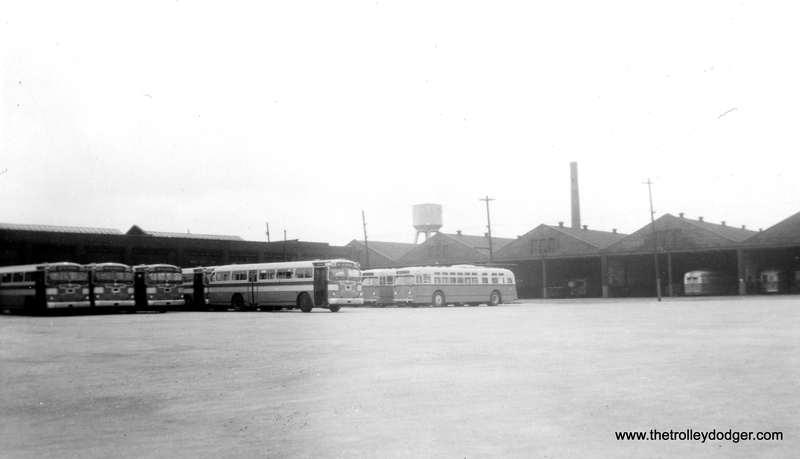 But the foreground shows both Twin Coach buses and trolley coaches. 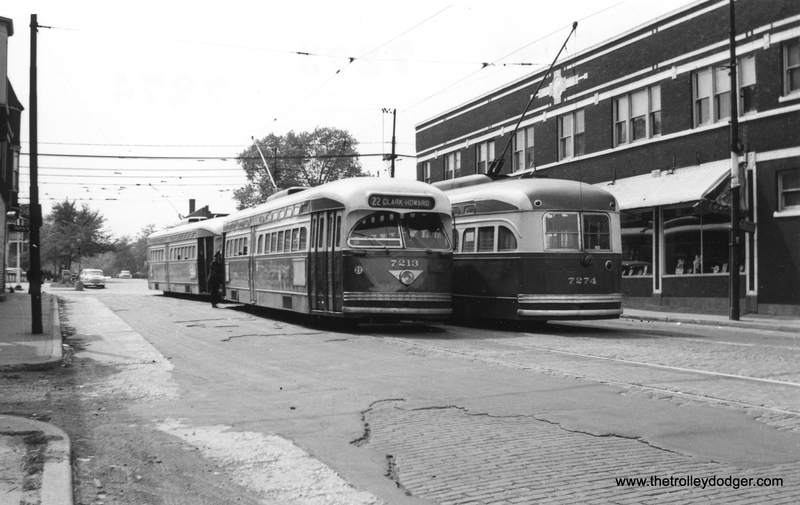 George Trapp says, “The trolley buses in the photo with the new Twin Coach gas buses are St. Louis Car products, also new in early spring of 1948 and mainly used on 78 Montrose line.” Jeff Wien adds that they were also used on route 80 – Irving Park. 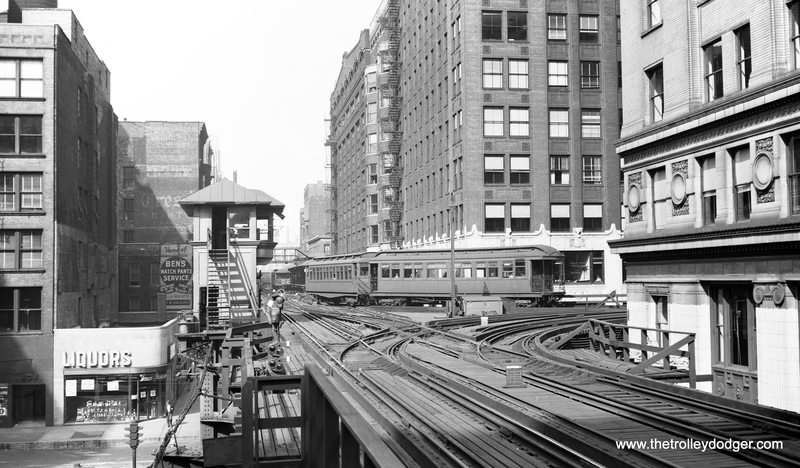 Our last major post on Chicago’s rapid transit lines was on April 28, so we figure it’s time for another look. 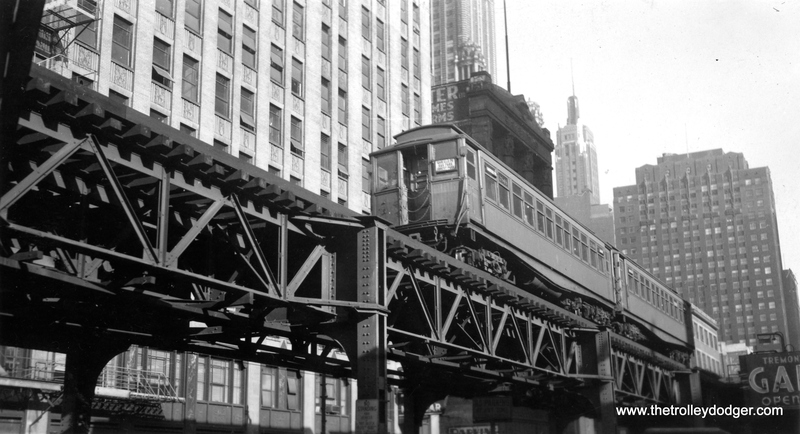 In newspaper parlance, -30- means “the end,” (there was even a 1959 film by that title directed by Jack Webb) but here, we present 30 classic Chicago “L” photos that we think are the living end. 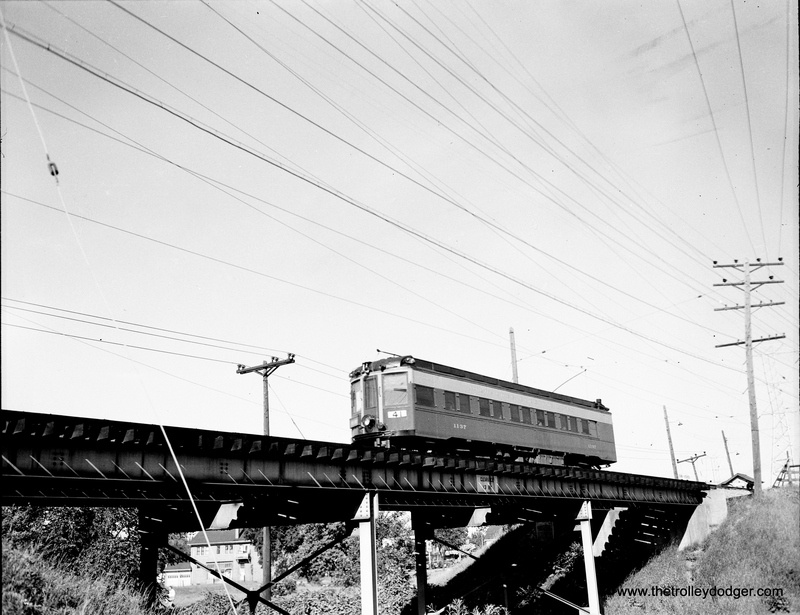 The location of this photo would be hard to identify, if not for the presence of overhead wire instead of third rail. That makes it Isabella on the Evanston line. 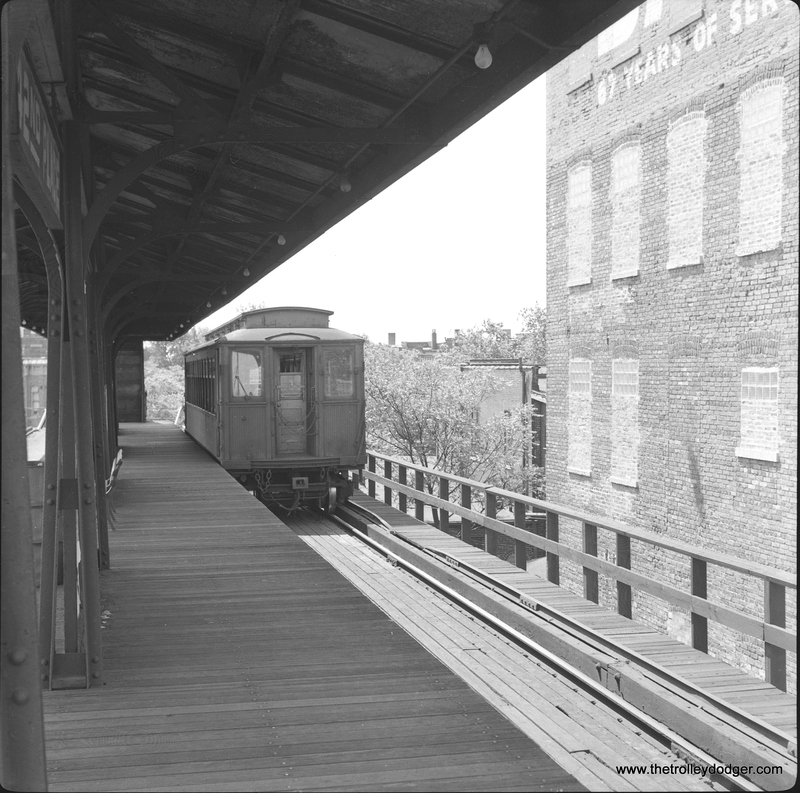 This station closed on July 16, 1973. 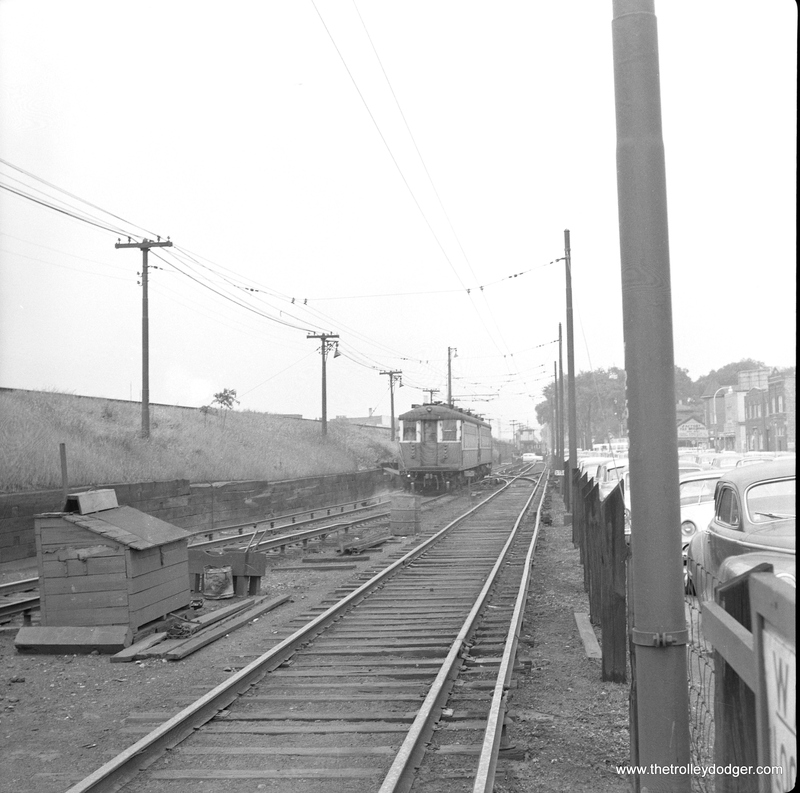 Niles Center train 1045 in the pocket at the Dempster station, with North Shore Line track in the foreground. 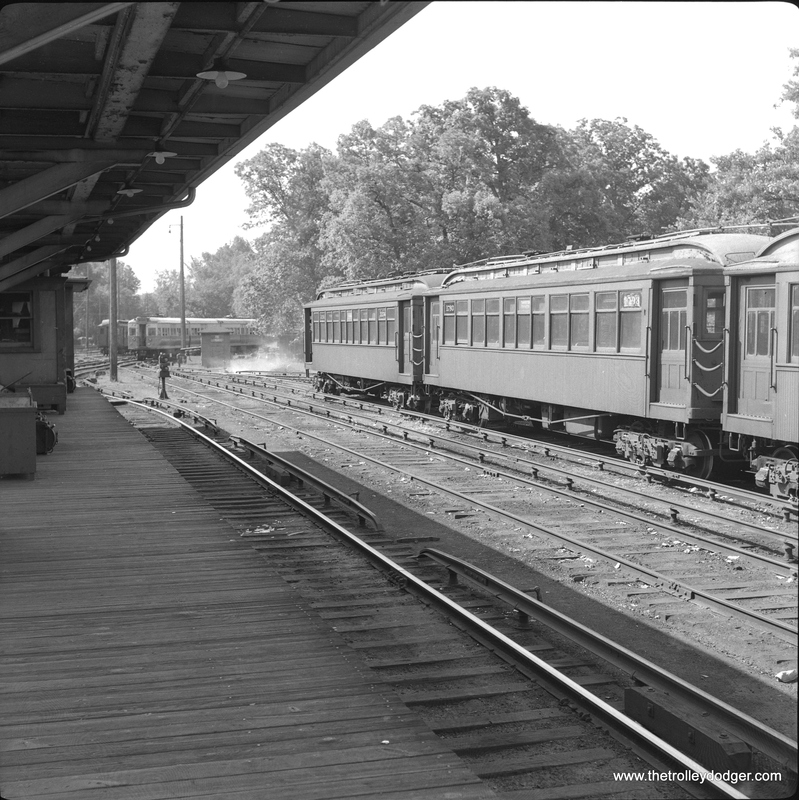 The Skokie Swift never used this terminal arrangement. 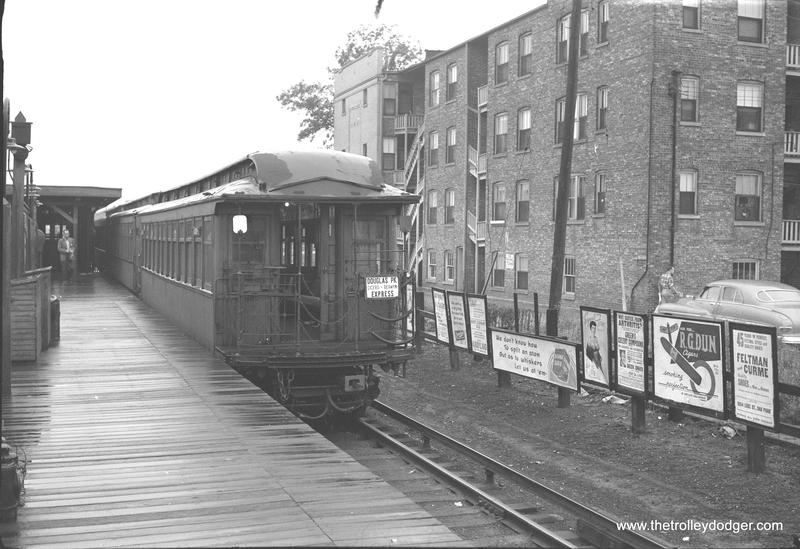 A rare shot of the lower Wilson Avenue station on the north side “L”. 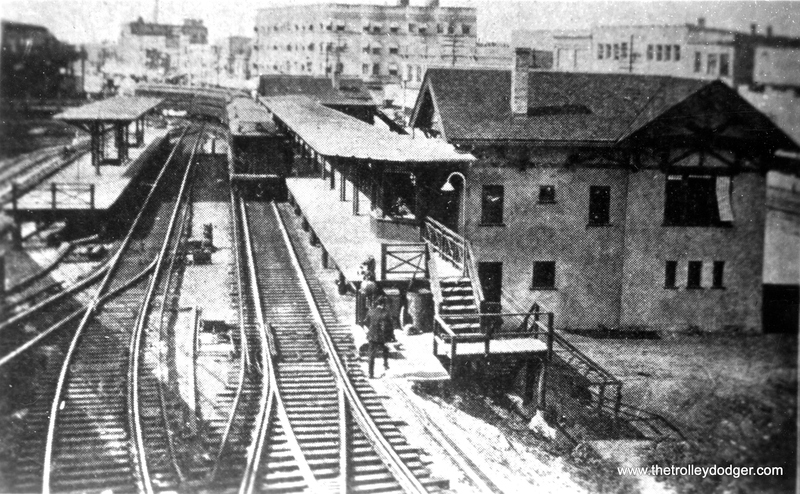 This was once the terminal before the “L” was extended north. 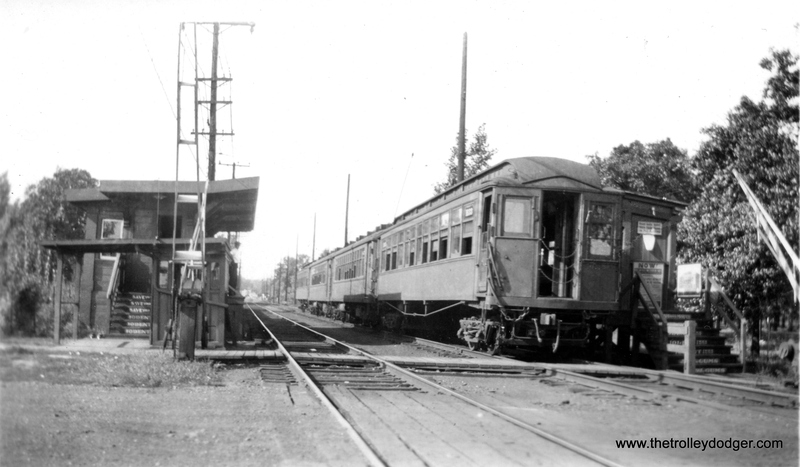 This station opened on March 5, 1907. The intent was to alleviate crowding at the upper Wilson station, already in use. 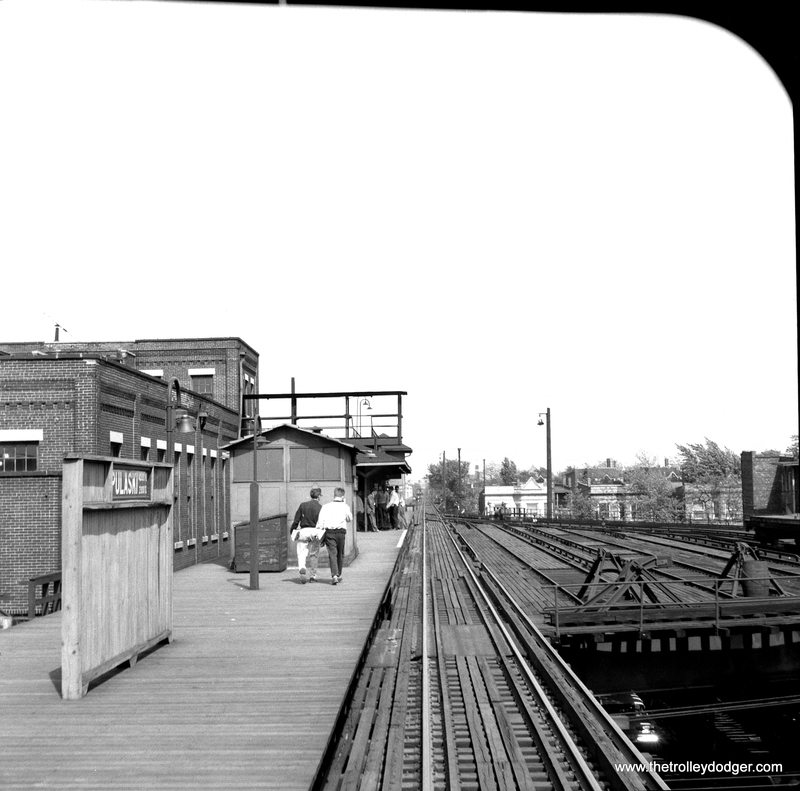 Lower Wilson closed on August 1, 1949, early in the CTA era. 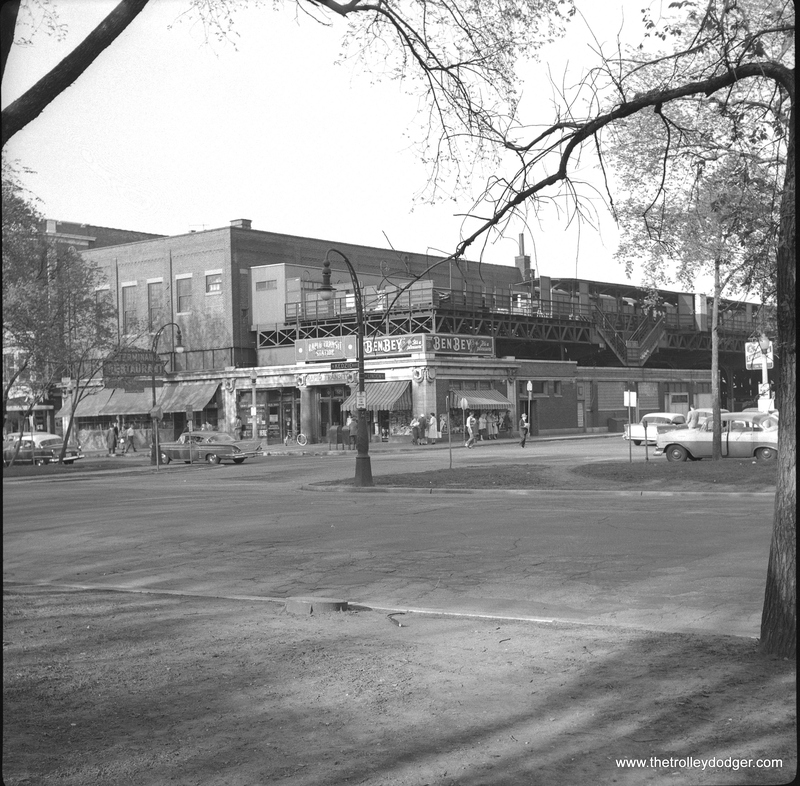 Skokie Shops, date unknown. 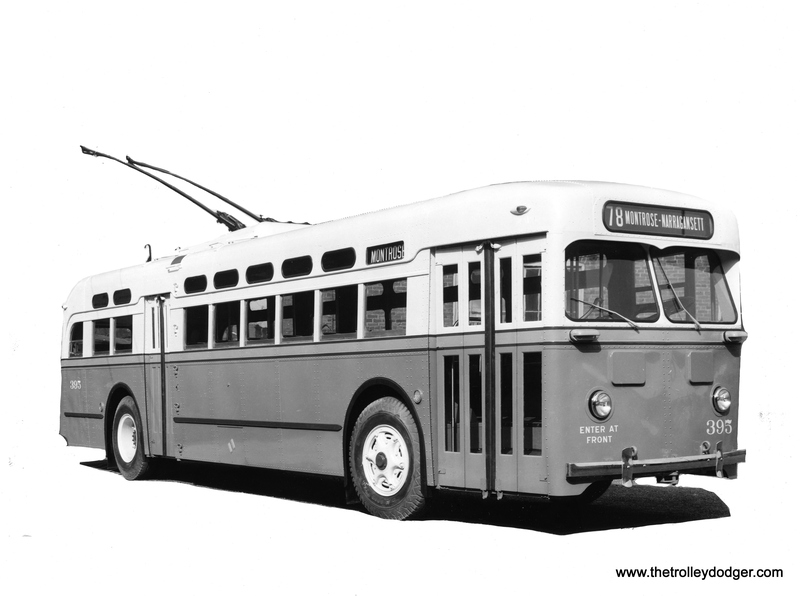 Probably early in the CTA era. 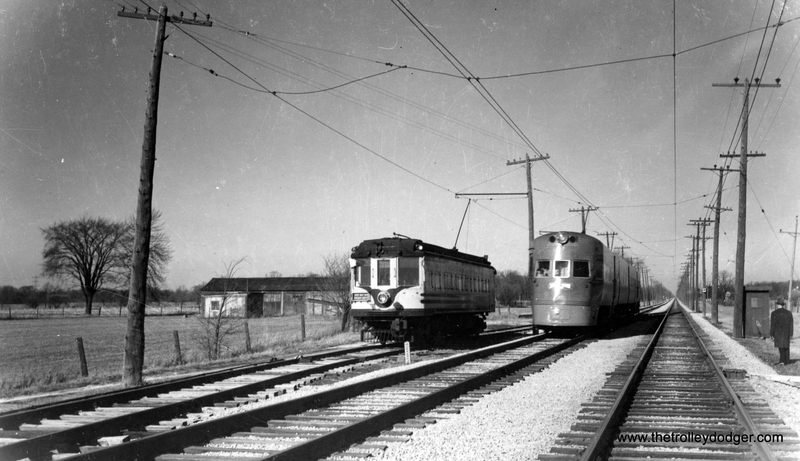 A single car Niles Center train in the open cut in Evanston. 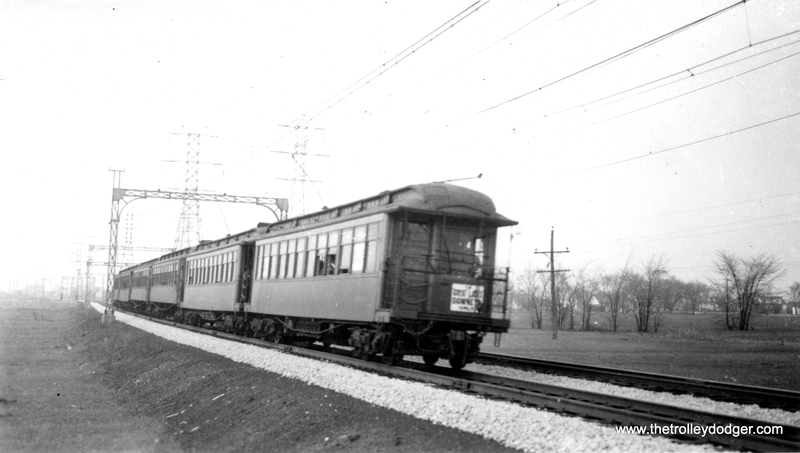 A six-car CRT “L” train on the Niles Center branch. 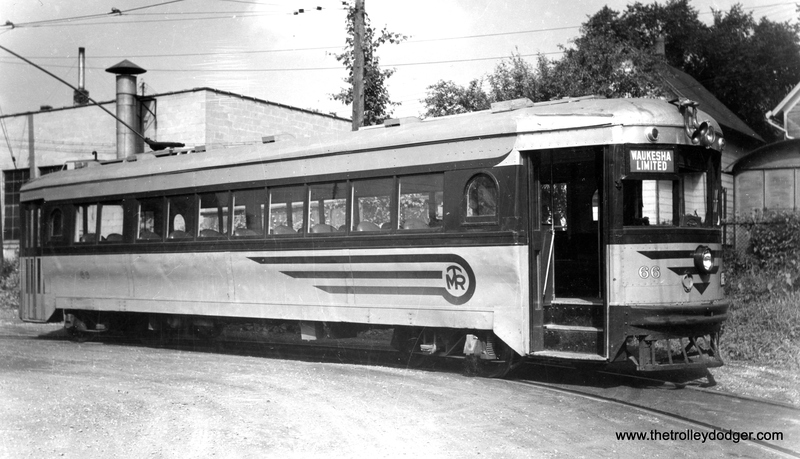 Service on this line quit on March 26, 1948. 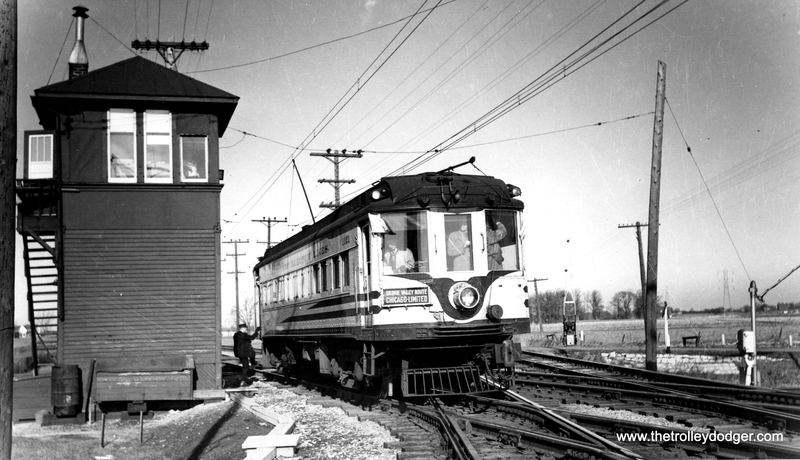 This was part of the North Shore Line’s Skokie Valley Route. 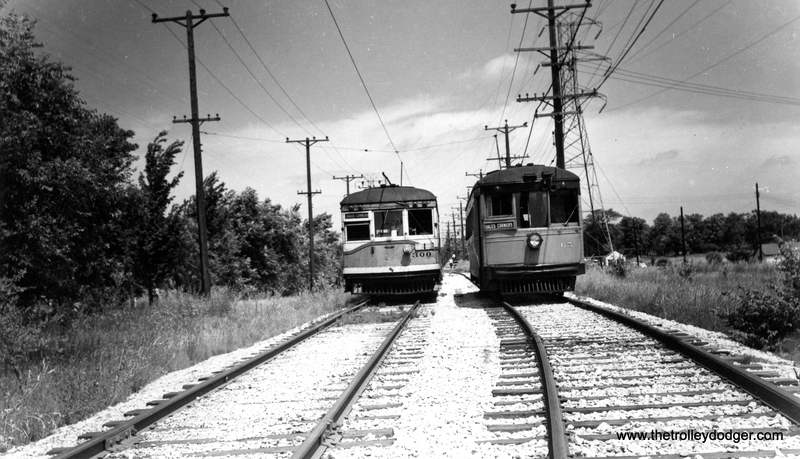 After the interurban quit in 1963, the CTA bought the line to Dempster and the Skokie Swift (today’s Yellow Line) was born. 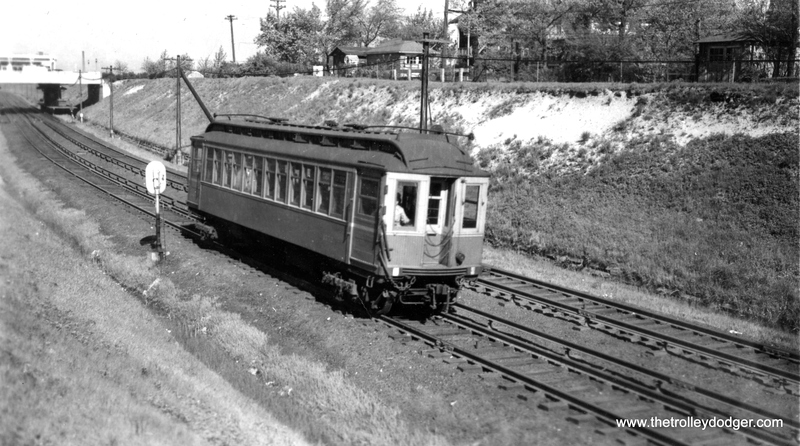 Service did not generally warrant the use of a six-car train in the 1940s when this picture was taken, but sometimes CRT trains were used on the North Shore Line to haul the military. 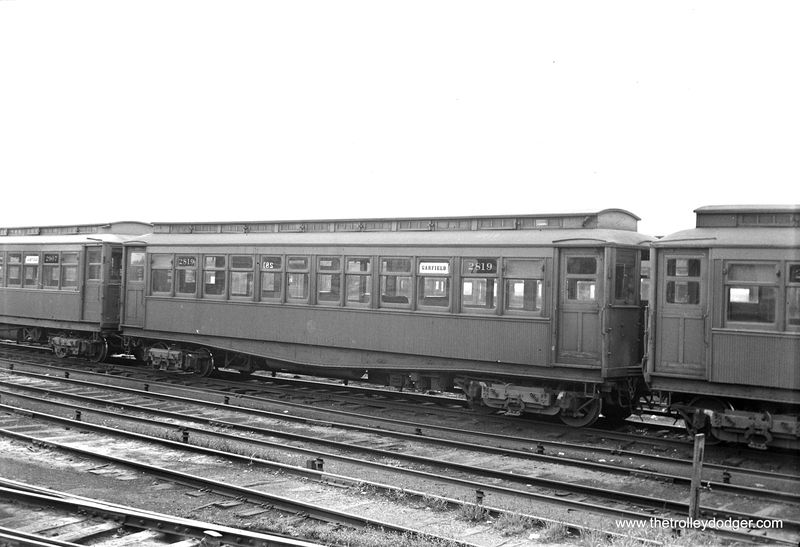 A two car CRT “L” train in December 1935. The location is given as Austin, but the photo does not indicate whether this is the Douglas Park branch or Garfield. 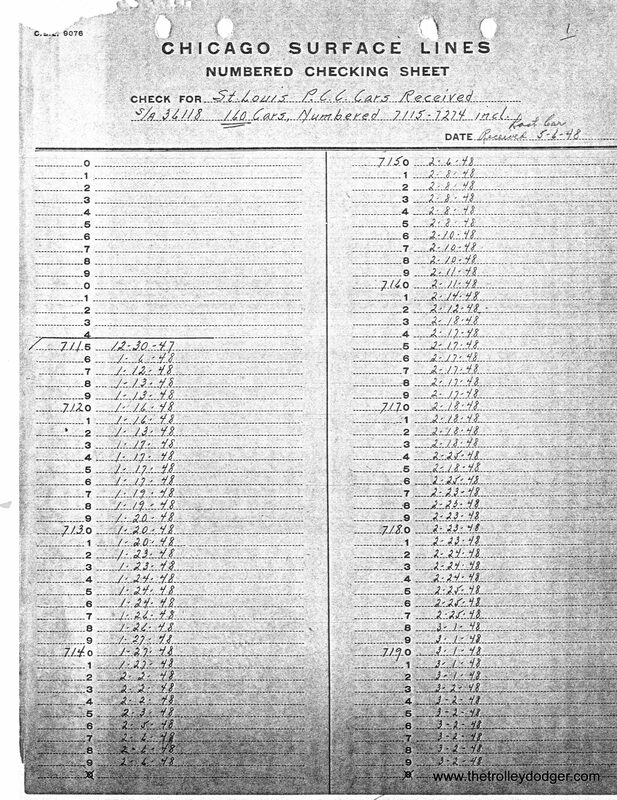 Bill Shapotkin writes: “I can’t tell you where this pic was actually taken, but I can tell you where is was NOT taken. This photo is NOT on Garfield Pk/Westchester. 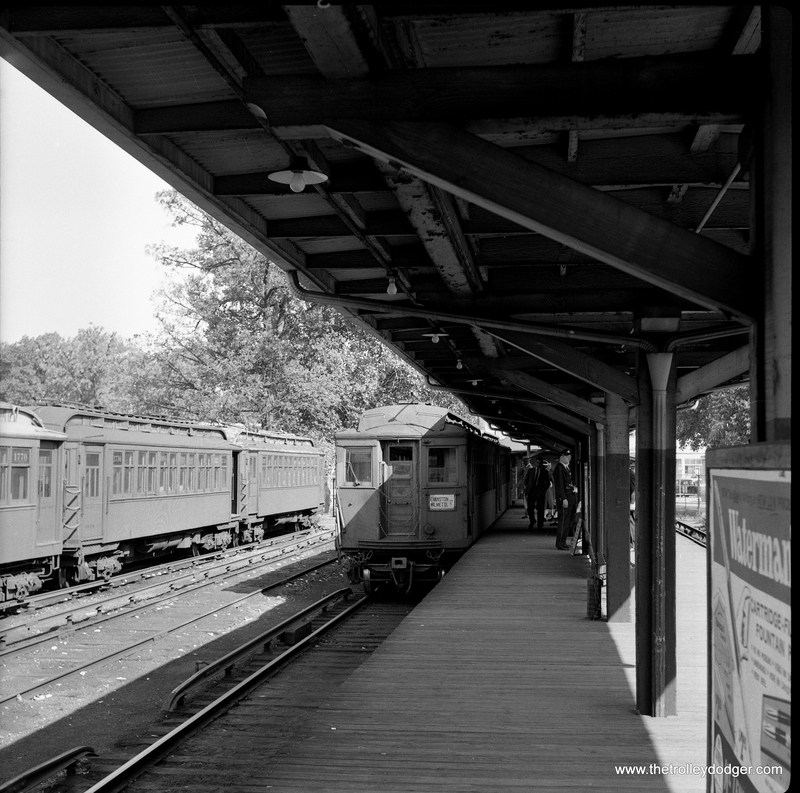 If it were anywhere on that line, the third rail chairs would be the CA&E’s wooden third rail chairs — the chairs shown in this photo are rapid transit third rail chairs. Additionally, if it were “Austin” (on Garfield Pk), we should see the B&OCT next door (and it is not). 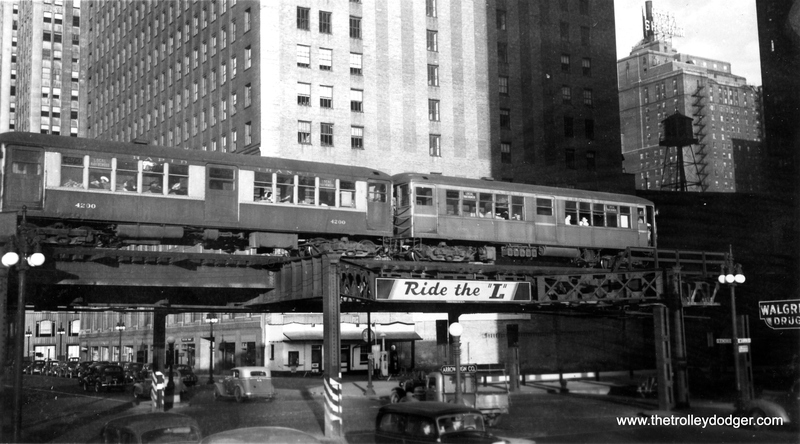 The east end of the CTA’s Jackson Park “L” in July 1959. 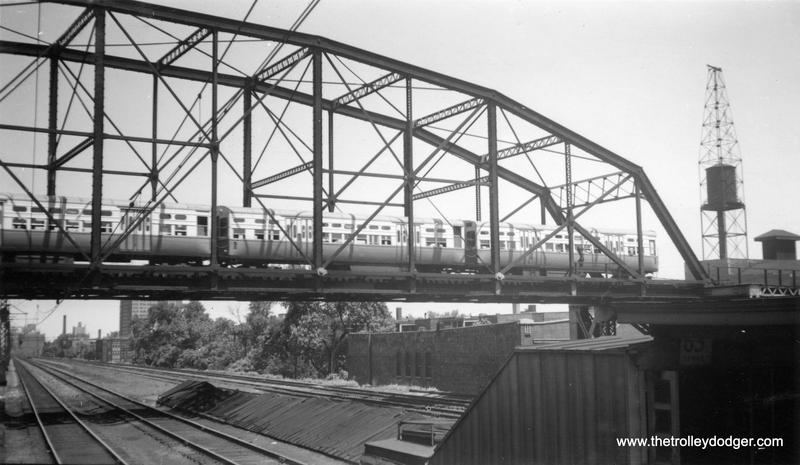 The “L” has been truncated west of here since and no longer crosses the Illinois Central (now Metra) Electric. 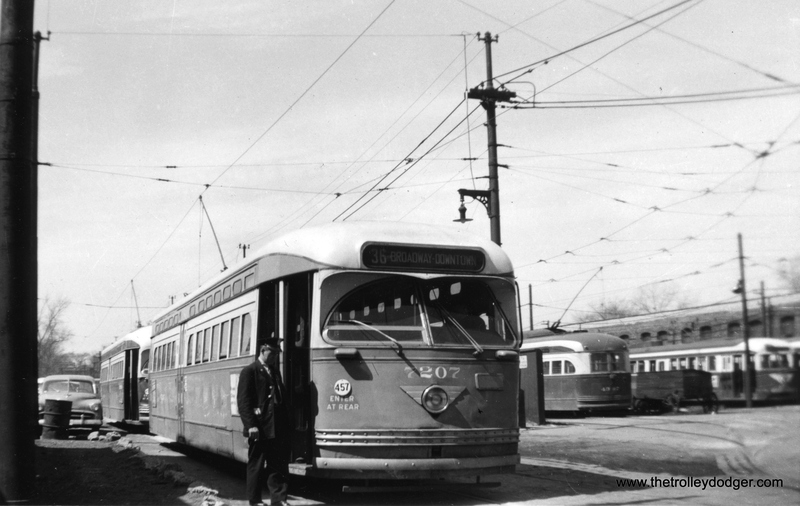 The DesPlaines Avenue terminal at the west end of the CTA Congress line in November 1959. 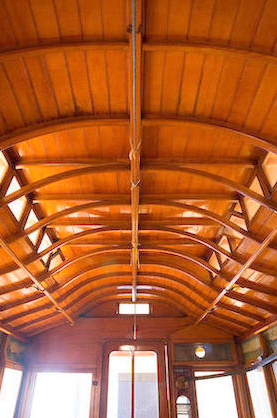 Wooden “L” cars were no longer being used for passenger service by time, and the three cars were probably being used here for offices as the station was being somewhat reconfigured. Note the lack of a canopy. 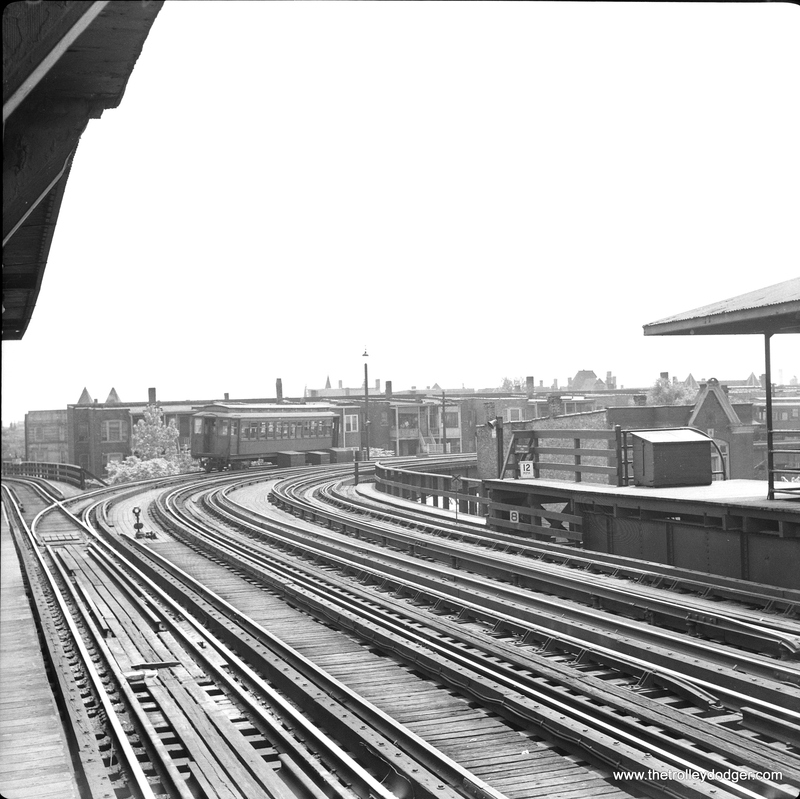 This picture was taken at the Oak Park Avenue terminal along the outer end of the Douglas Park “L”, looking west. The apartment building at right is still standing. 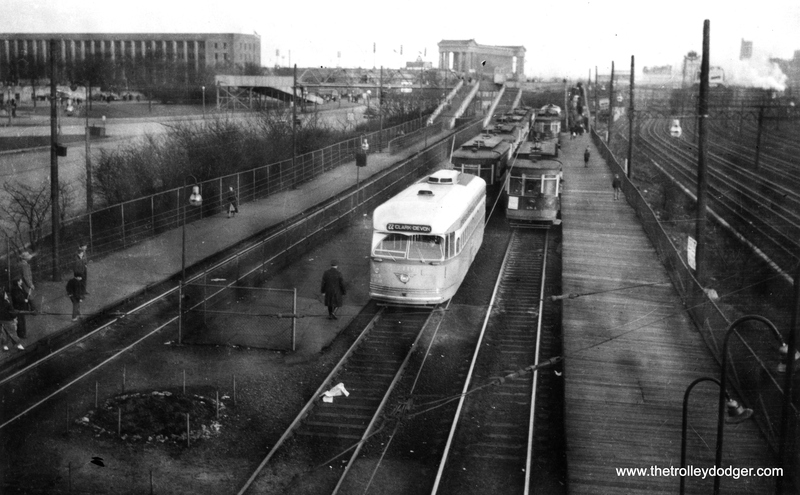 The line was cut back to 54th Avenue 1952. 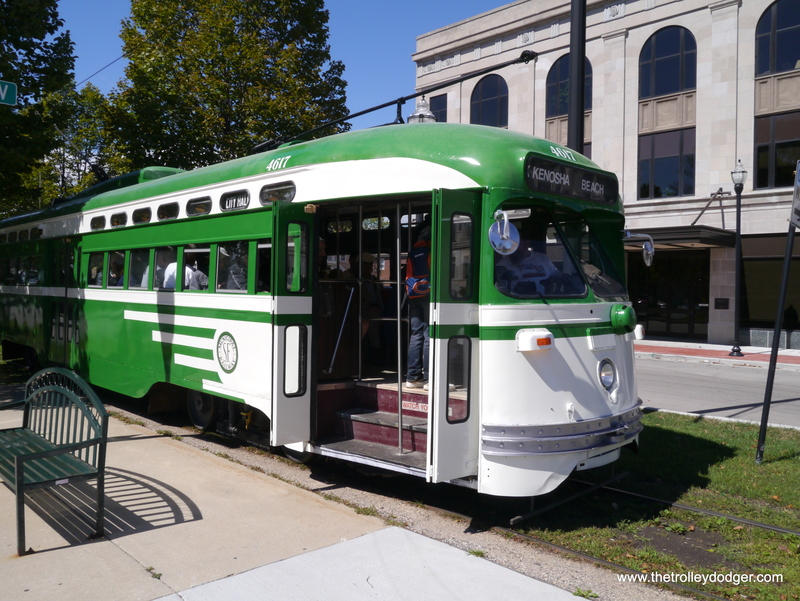 The train is a Cicero-Berwyn Express, ready to head downtown. 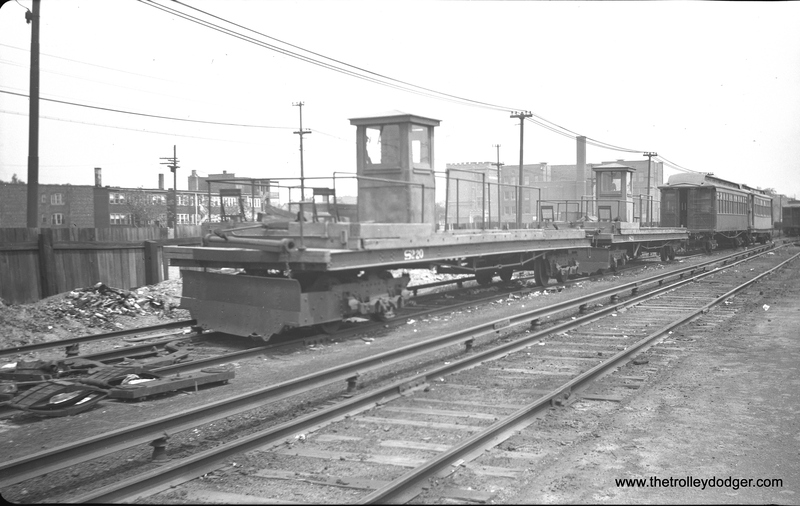 It must be before December 9, 1951, when A/B skip-stop service was instituted. Note the Burma Shave sign at right. 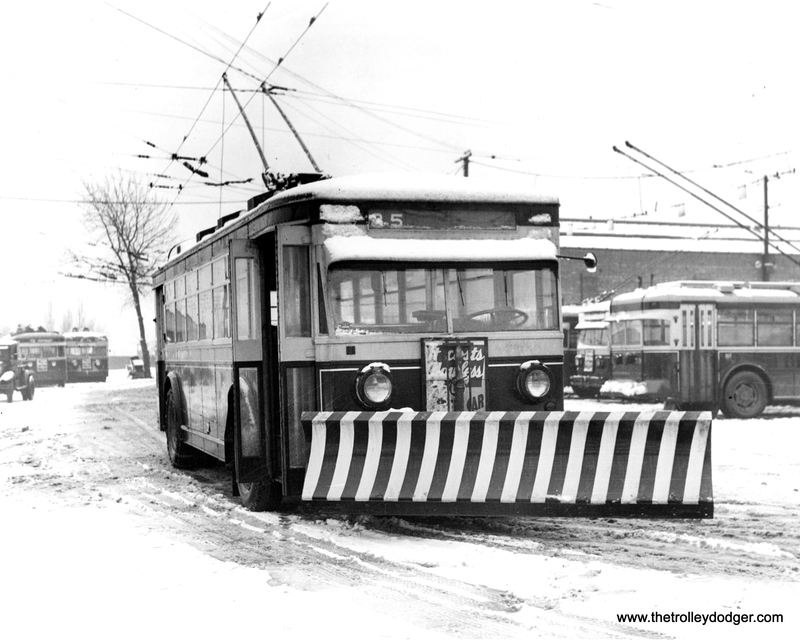 CRT/CTA snow plow S220 at Laramie on the Garfield Park “L” in 1948. 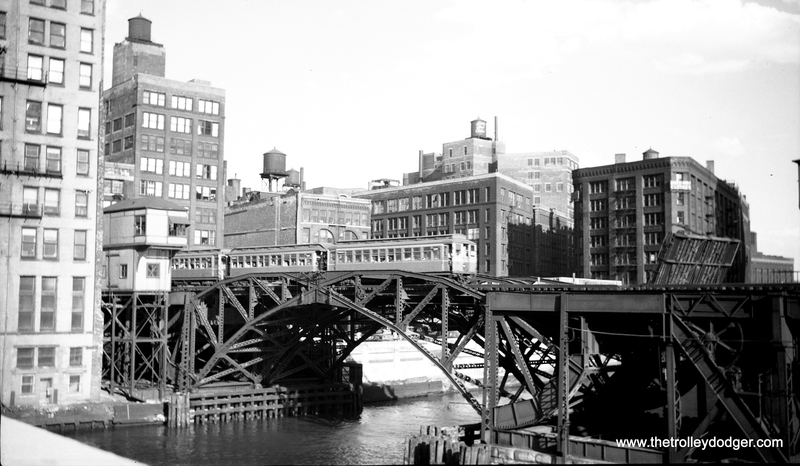 A CTA Met “L” train crosses the Chicago River in 1950, on the double Scherzer rolling lift bridge that was there at the time. 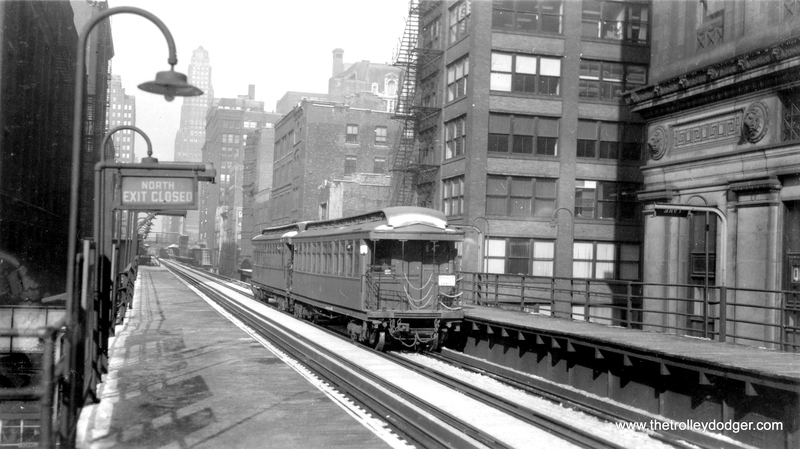 Now, just south of here, the CTA Blue Line passes underneath the river. 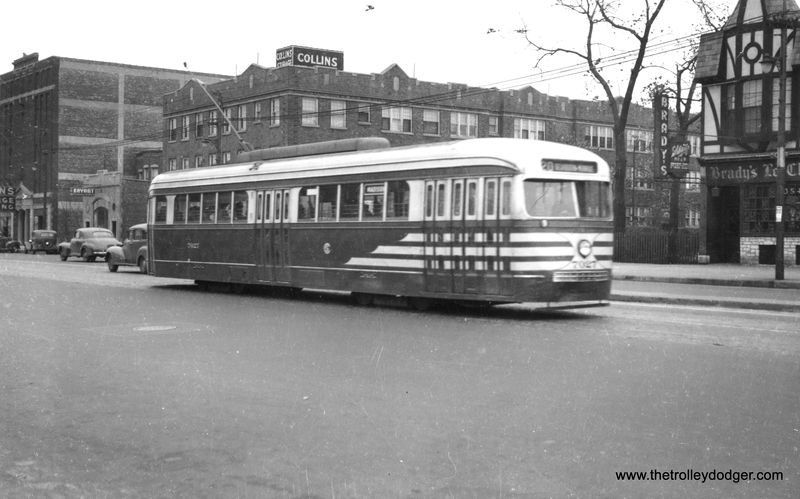 CTA 2703-2753 at the east side of Skokie Shops on May 1, 1955. 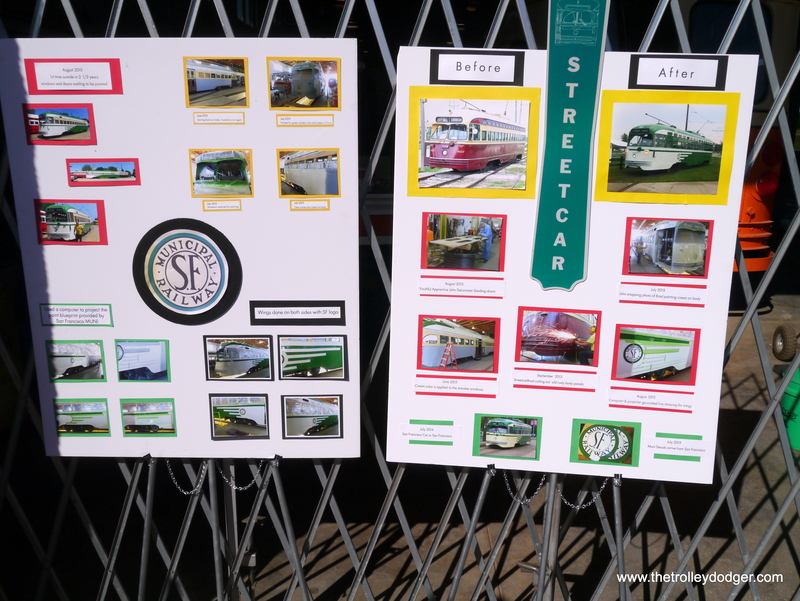 This was a Central Electric Railfans’ Association fantrip that included a shops tour. 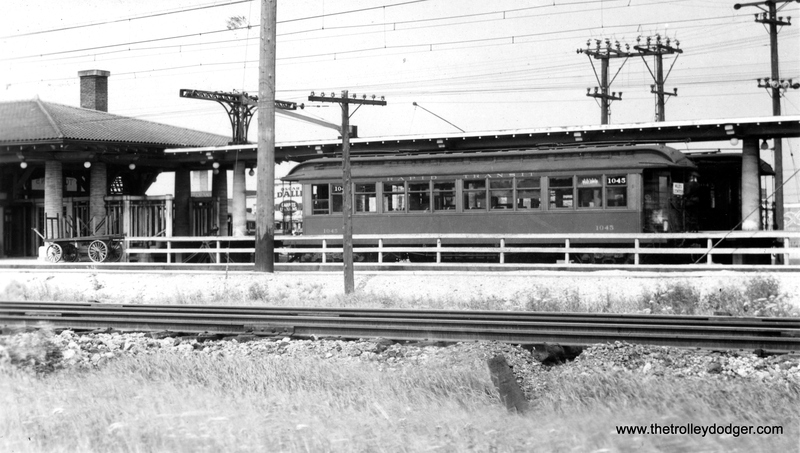 An open platform/vestibule two-car Douglas Park train at Van Buren and Wells in September 1949. One of the cars is 2775. 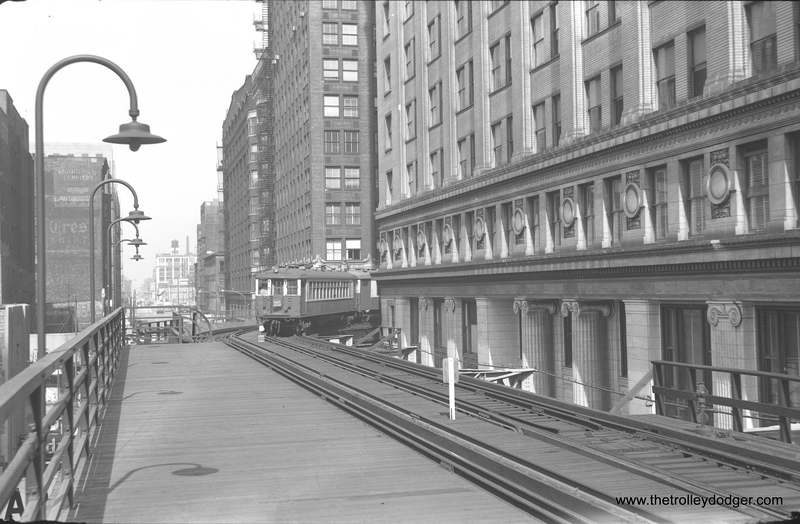 Contrast this with the later photo taken at this same location, after the removal of the “L” structure west of here for the construction of Lower Wacker Drive. 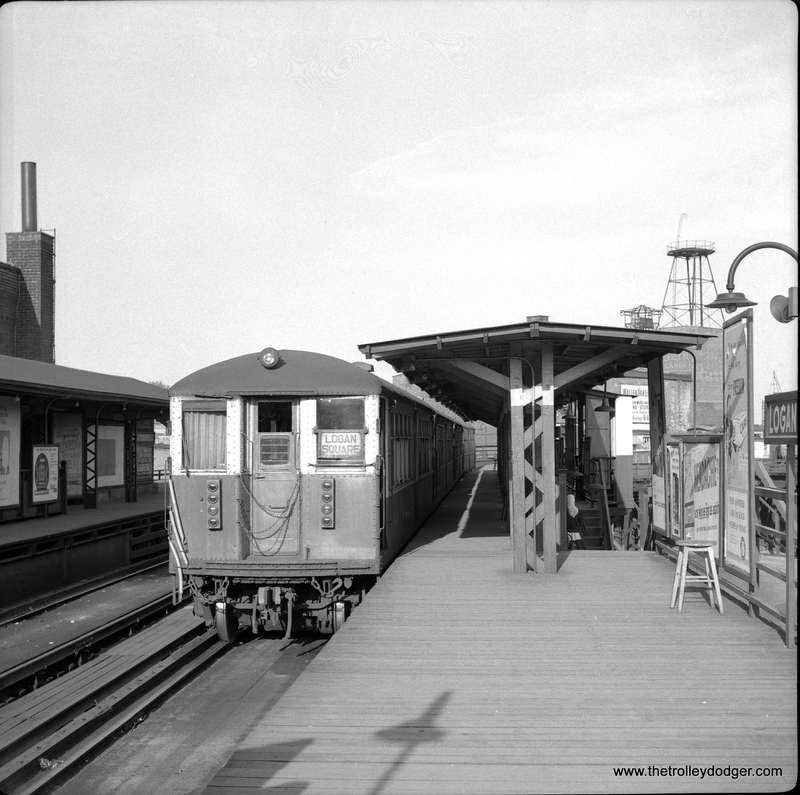 The same location as the last photo, but no earlier than 1955. 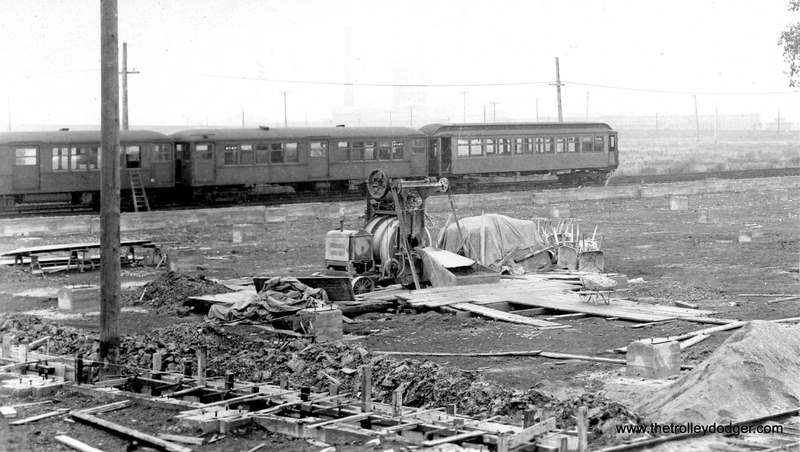 The “L” structure and tower west of here have been removed. 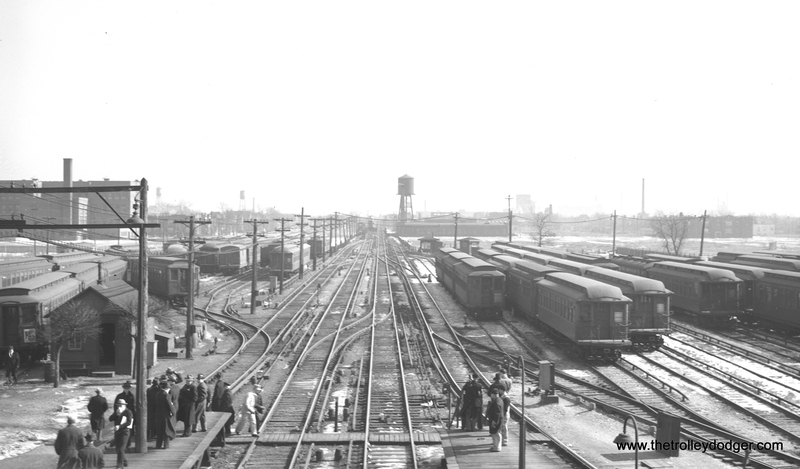 The Garfield Park “L’ connection to the Loop was moved slightly north of here via a new connection through the old Wells Street Terminal. The sign on the train says that the last stop is Clinton. The Insurance Exchange building is at right. Laramie Yard on the Garfield Park “L”, looking east. 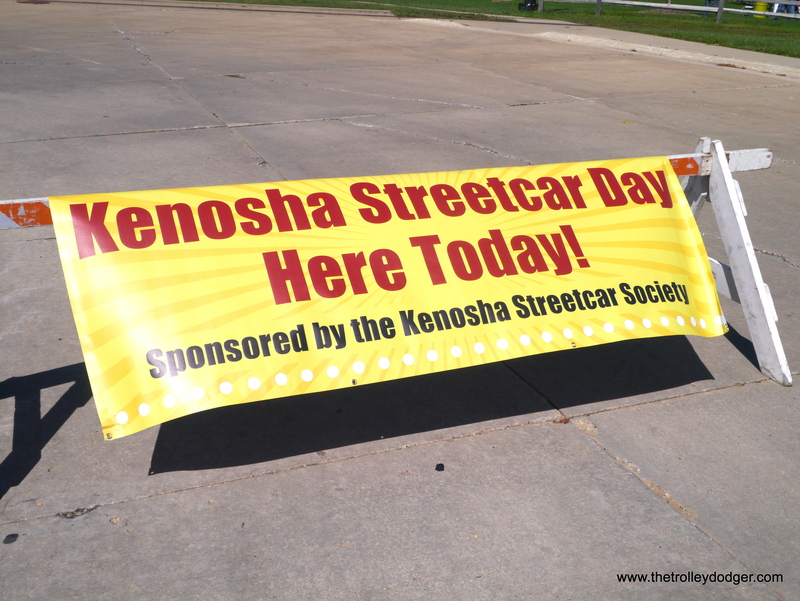 A few blocks back, the “L” went up a ramp onto steel structure. 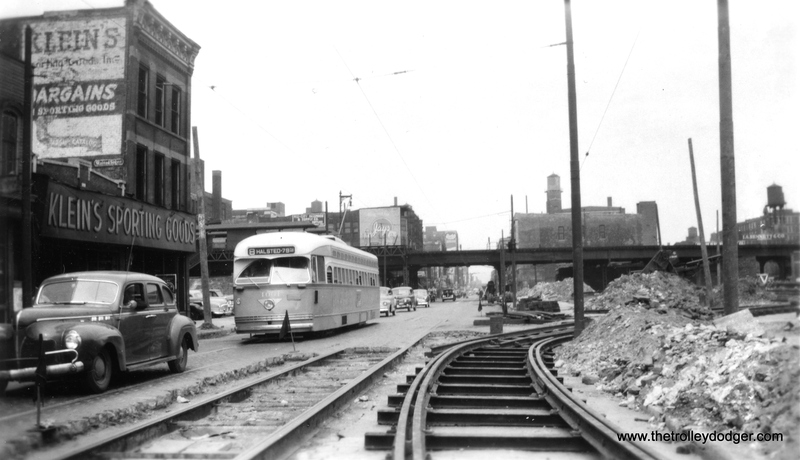 Today, the Eisenhower expressway would be somewhere off to the right. 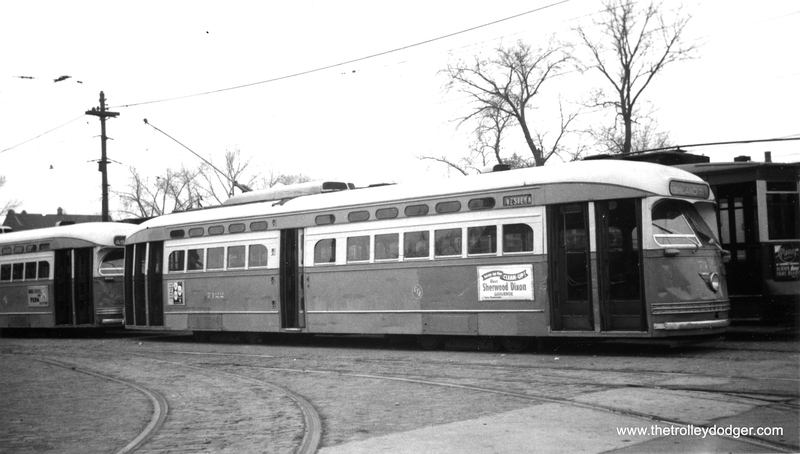 CTA Met car 2819, signed for Garfield Park, at Laramie Yard in August, 1954. This is our 80th post, and we are gradually creating a body of work and an online resource for the benefit of all railfans, everywhere. 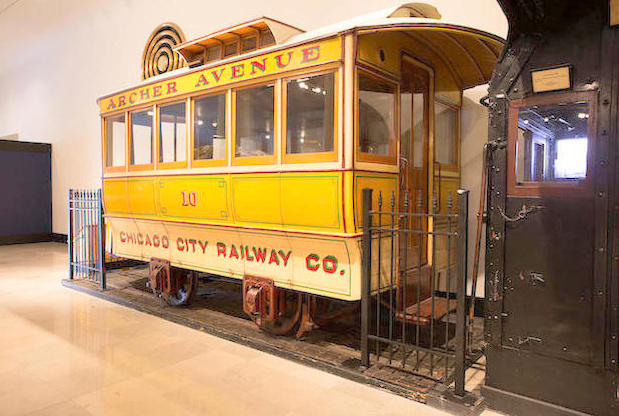 Bonham’s auction house recently announced that they will be selling some historic railroad items from the collections of Chicago’s Museum of Science and Industry. 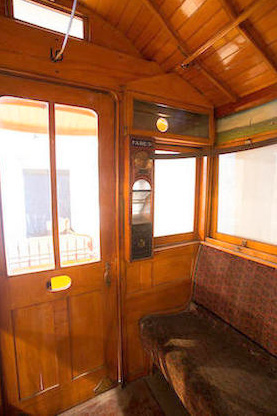 While we, of course, have no connection with either institution, we thought our readers would enjoy reading about the replica cable car that is being offered. There are links just in case anyone is interested in pursuing this further. 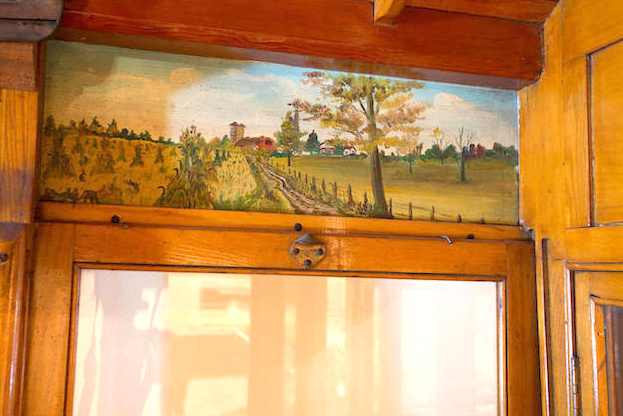 There is an authentic horse car at the Illinois Railway Museum, built in 1859. 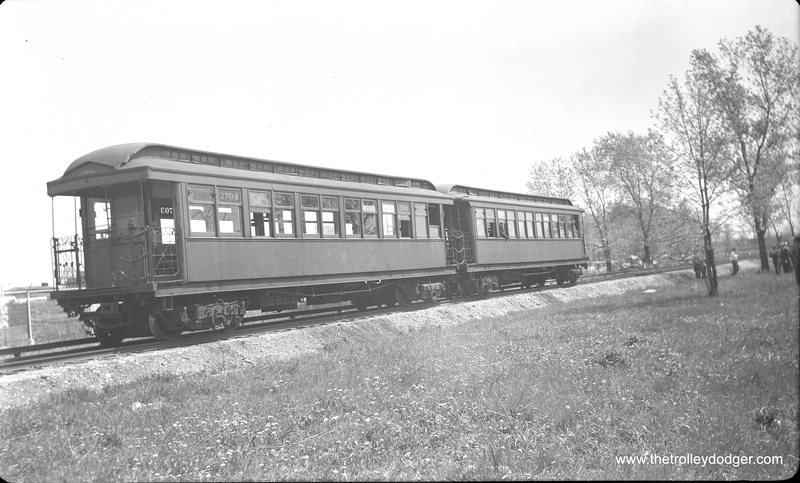 We have published a couple pictures of this car being used by the Chicago Surface Lines in 1925 and 1936, celebrating streetcar line extensions. 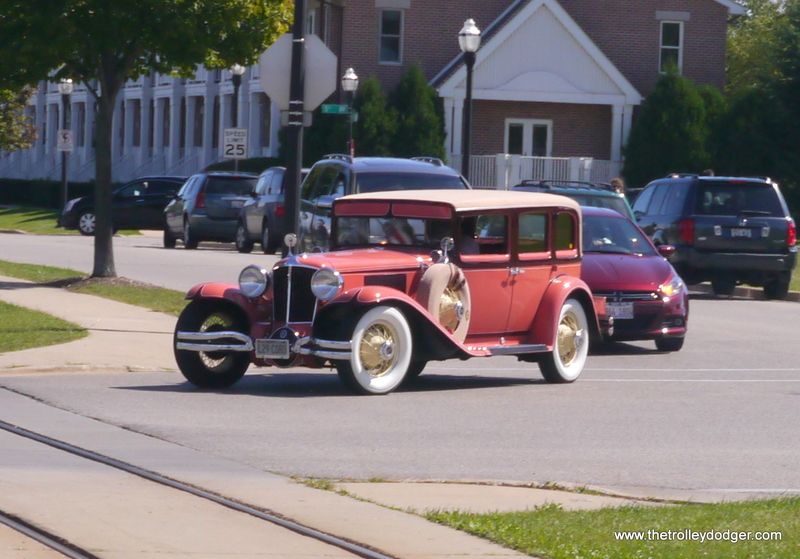 Let’s hope that this car, although a replica, stays in the Chicago area. 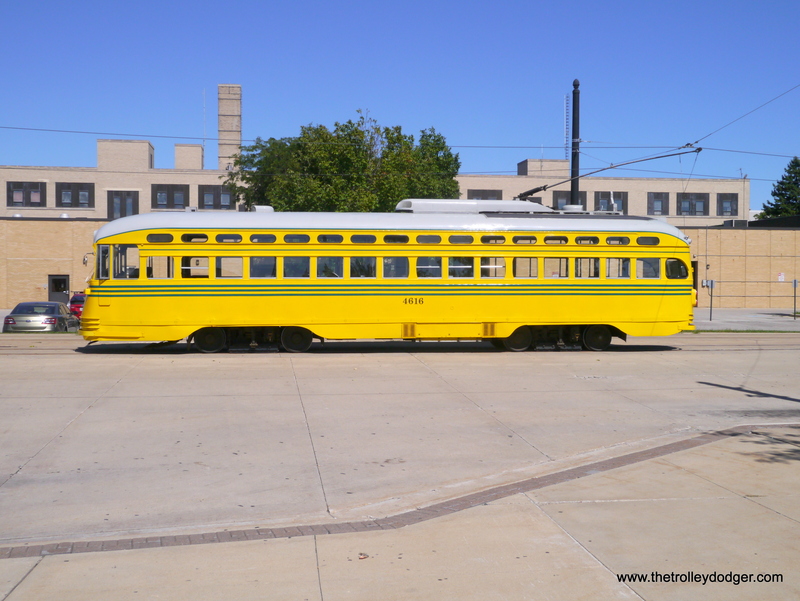 It was actually used at both the Century of Progress 1933-34 World’s Fair and the 1948-49 Chicago Railroad Fair. Bonhams is honored to present five significant pieces of transportation history from the Museum of Science and Industry, Chicago. These wonderful artifacts have been housed at the museum on full-time display for over 80 years and will now be sold at Bonhams’ “Preserving the Automobile” auction at the Simeone Foundation Automotive Museum in Philadelphia on October 5th. 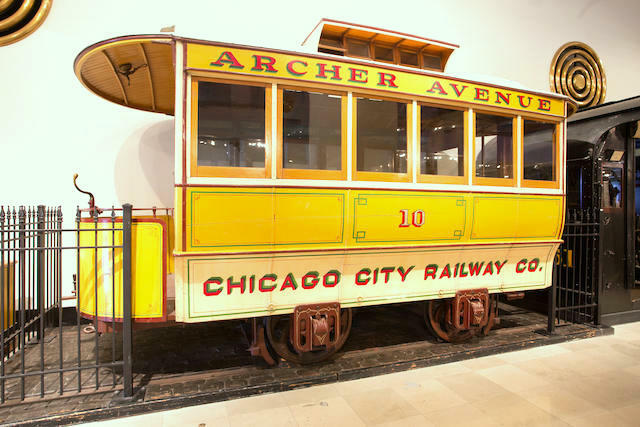 …Other artifacts from the museum include the exact replica 1859 horse car “Archer Avenue No. 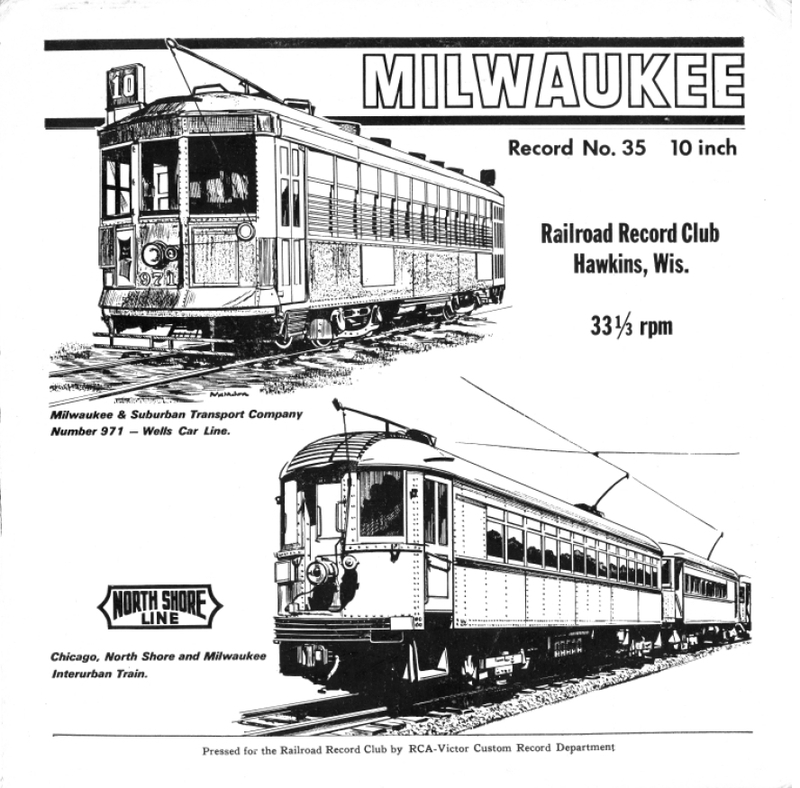 10” that was donated to the museum by the Chicago City Railway Company in 1930. 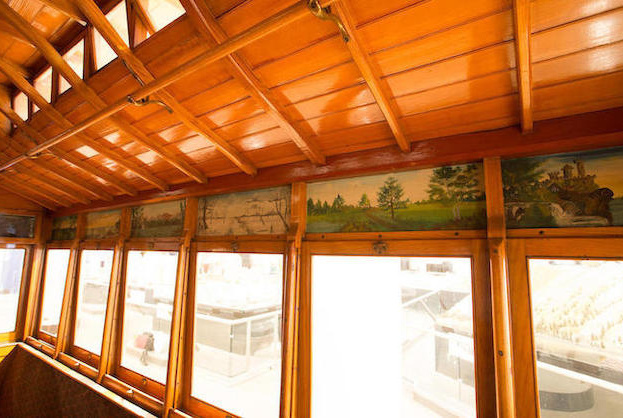 These beautiful, craftsman-built, horse-drawn rail cars were operated in congested urban areas, such as Chicago, Philadelphia and New York, where steam locomotive transportation was impractical. 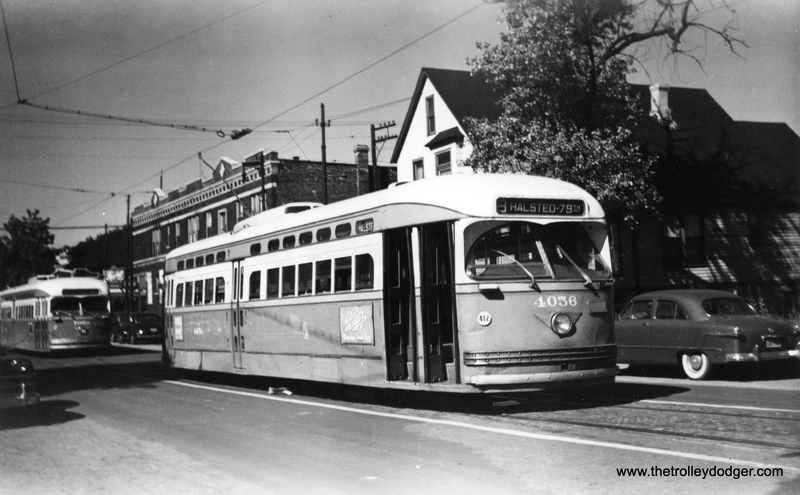 They were the antecedent of the electric streetcar that later dominated urban public transport. 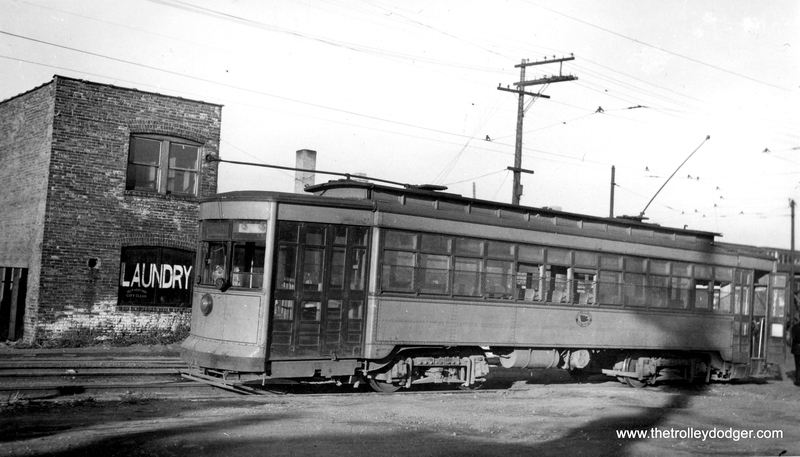 The horse drawn streetcar, typically contracted as ‘horsecar,’ was a significant early step in the evolution of urban transport. In this context, the term ‘car’ refers specifically to a railway vehicle and does not imply an internal combustion engine automobile (now commonly known as a ‘car’). 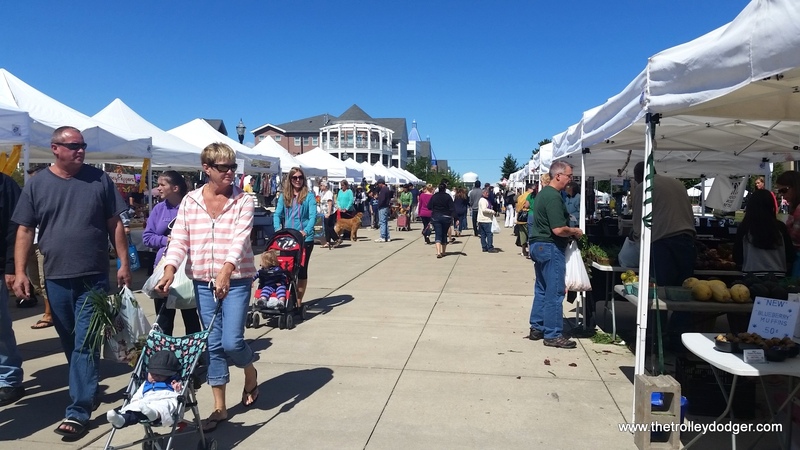 As cities in America grew during the first half of the 19th century, the working population began to live ever further from their places of employment, shopping and entertainment. 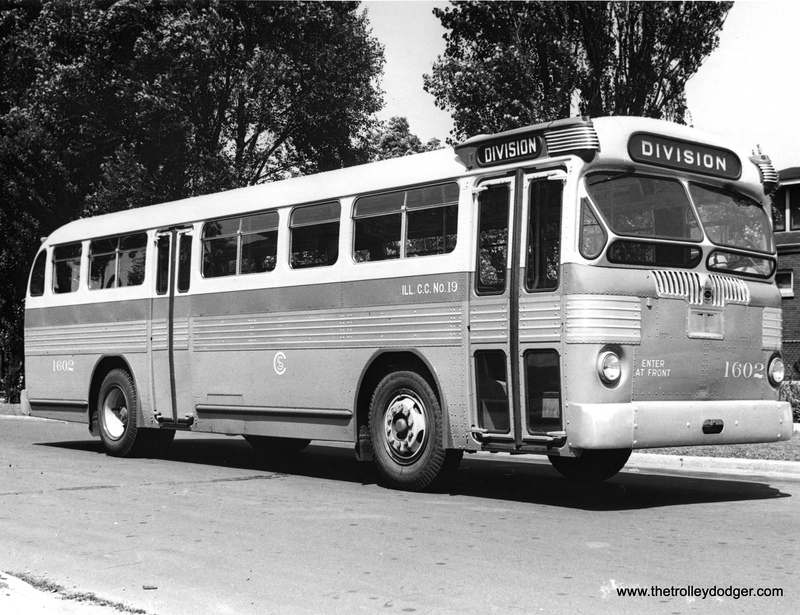 Greater distances and larger numbers of people on the move increased the need for pay as you go urban transport, and so private companies emerged to supply transport using omnibuses on fixed routes and schedules. 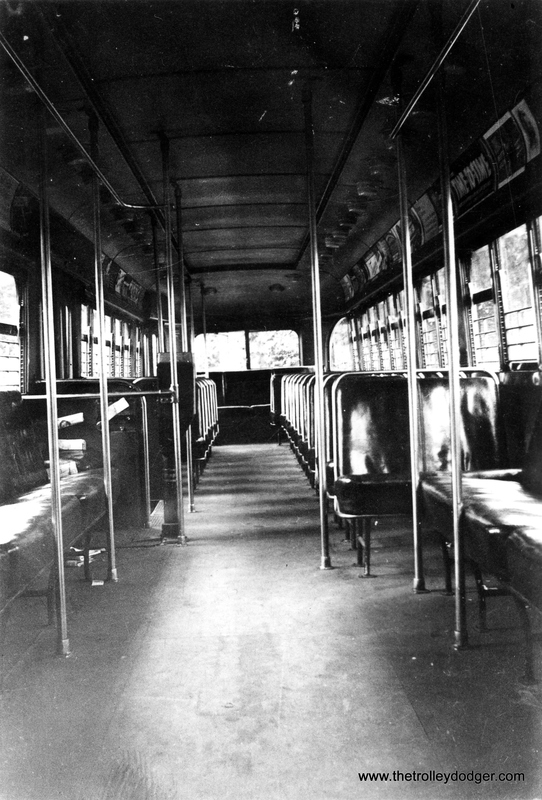 An omnibus was a compact horse-drawn coach. 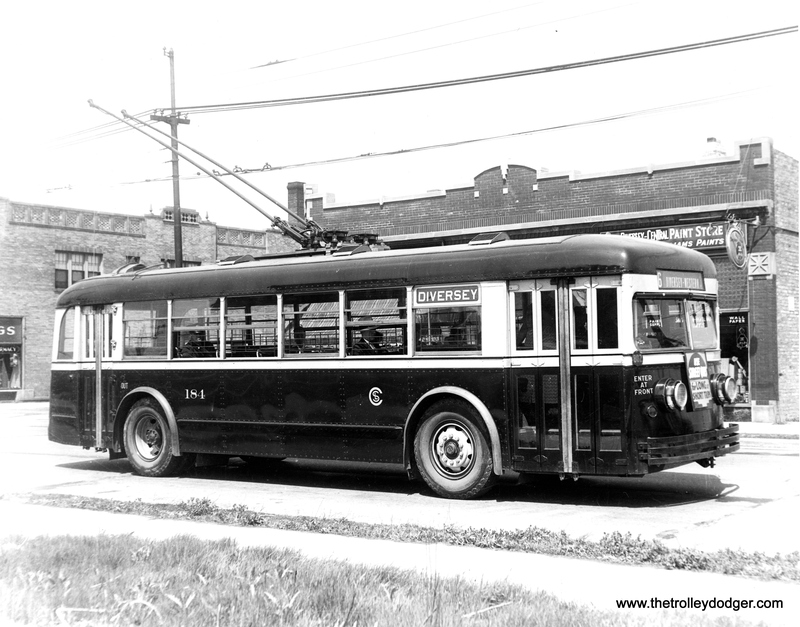 Chicago’s first commercial omnibus service was operated by Frank Parmelee beginning in 1853. 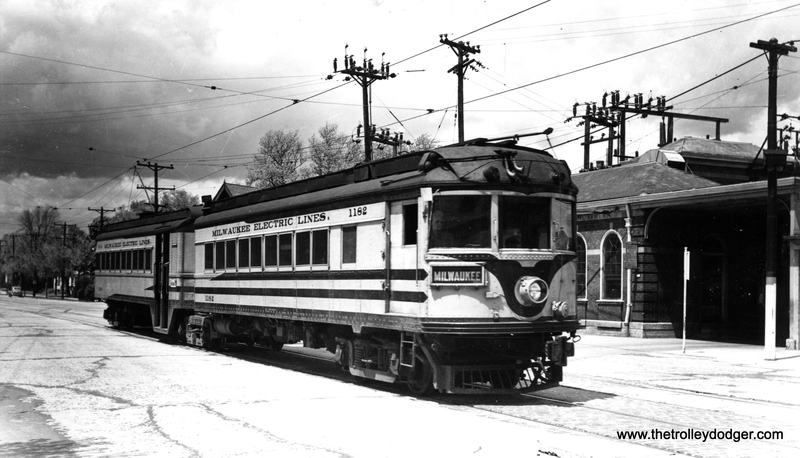 (Parmelee’s business evolved and in later years his name was associated with Parmelee Transfer service that provided over-the-road connections between all of the City’s six primary railroad passenger terminals. 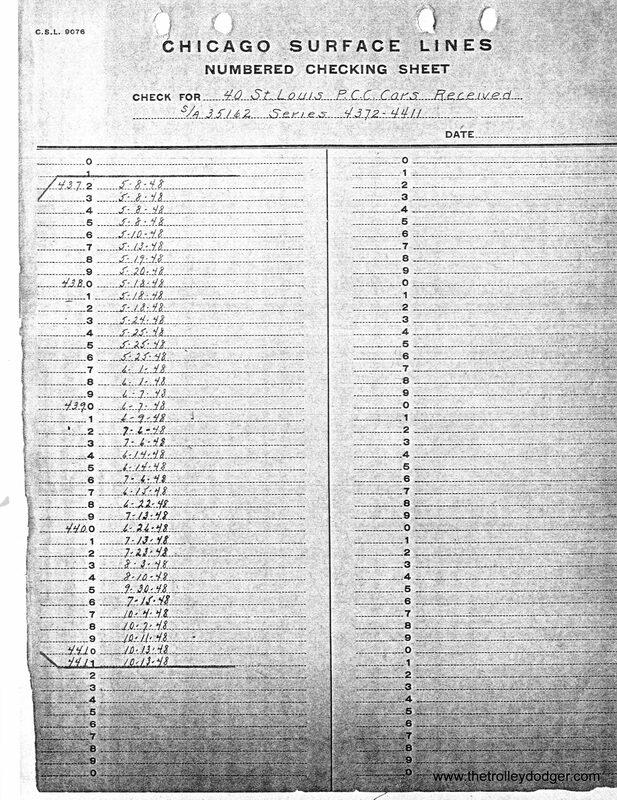 By World War I, Parmelee had begun to use motor vehicles). 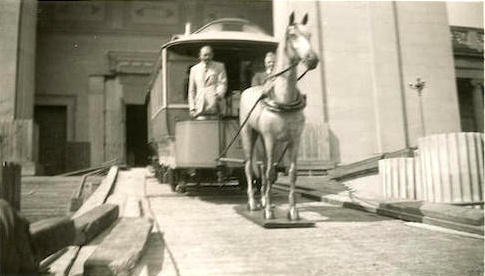 The horsecar was an important advancement to the omnibus. This innovation allowed a single horse to draw a heavier vehicle while providing a smoother and more comfortable ride. 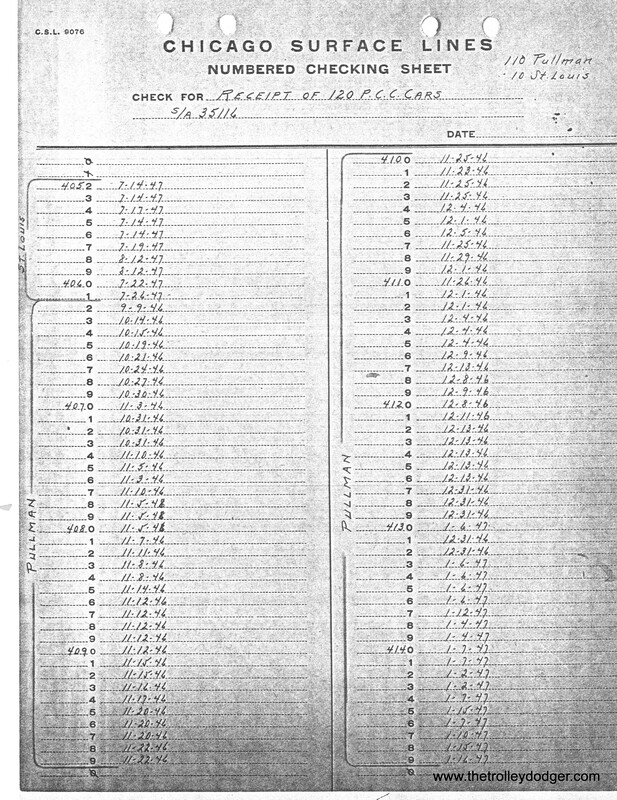 Among the drawbacks of the horsecar operation were that the mode was severely limited where cars encountered ascending grades, while busy lines required many more horses than cars because it was only possible to work horses for a few hours a day. In some instances mules were preferred over horses because of their greater stamina. 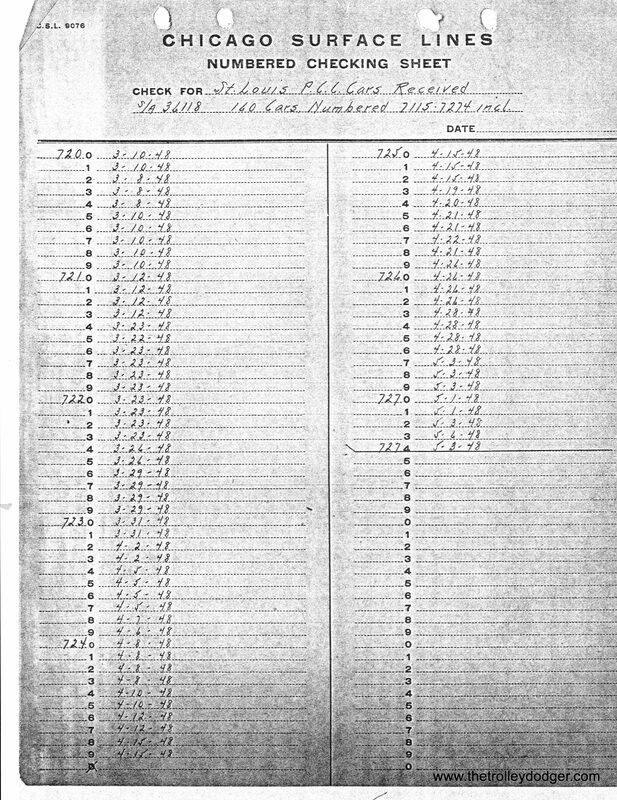 By one estimate, Chicago street railways employed 8,400 horses in 1893. 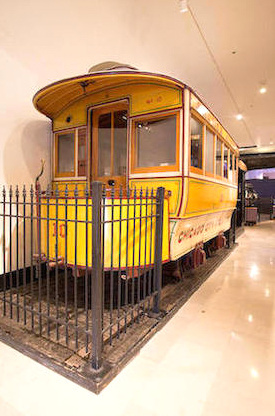 The horsecar led to development of the steam-dummy (a small streetcar powered by an on-board steam engine) and later to the cable car, which was drawn by an underground cable. 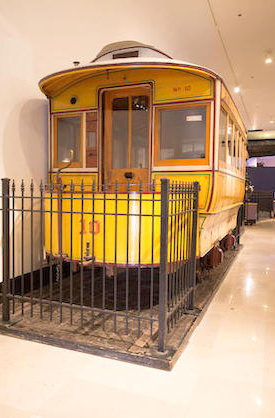 British-born Andrew Smith Hallidie was the San Francisco cable manufacturer credited with melding key cable innovations and establishing the city’s Clay Street Hill Railroad in 1873, the world’s first urban cable hauled street railway. 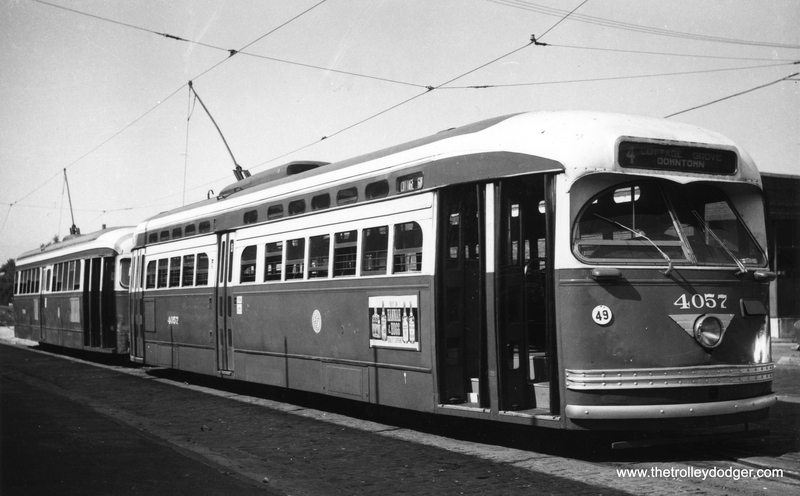 This set important precedents that resulted in an urban transit revolution emulated across San Francisco and in approximately 30 cities across the United States and around the world. 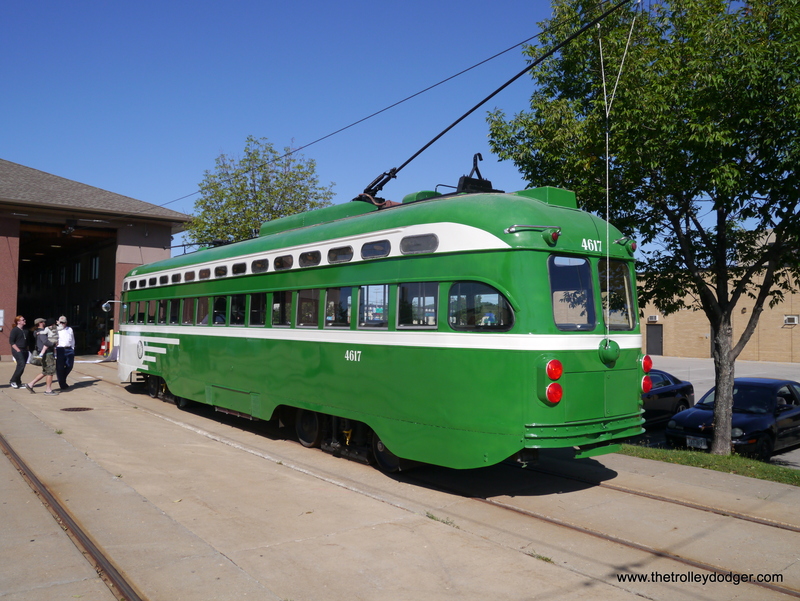 More significant was the development of the electrically powered streetcar, commonly known in America as trolley car or trolley, which describes the wheel at the end of the pole, used to run along the overhead wire to draw electricity for propulsion. 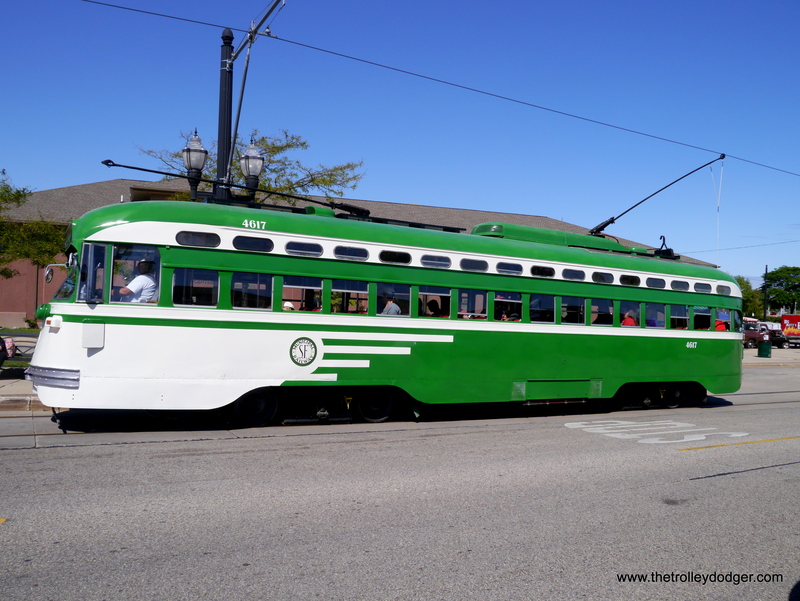 While ‘trolley’ is occasionally used as a synonym for a streetcar in the United States, the term should only be correctly applied to electric cars with trolley poles. 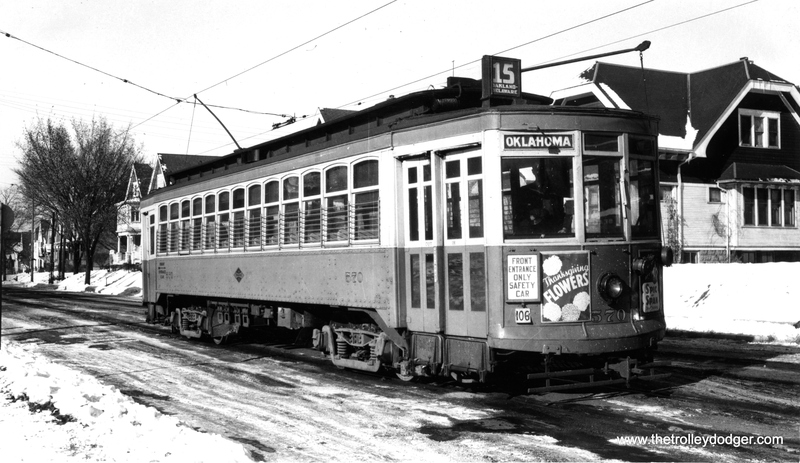 Various inventors had dabbled with electric streetcars in the mid-1880s, but it was in 1887-1888 that electrical genius Frank Julian Sprague successfully demonstrated a practical electric street railway in Richmond, Virginia. 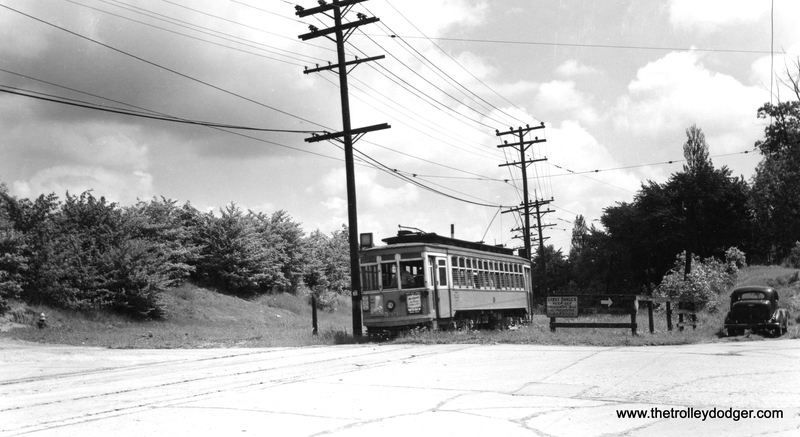 Electric operation was cheaper and simpler than cable hauled lines, and allowed streetcar lines to practically cover much greater distances than possible with horses. 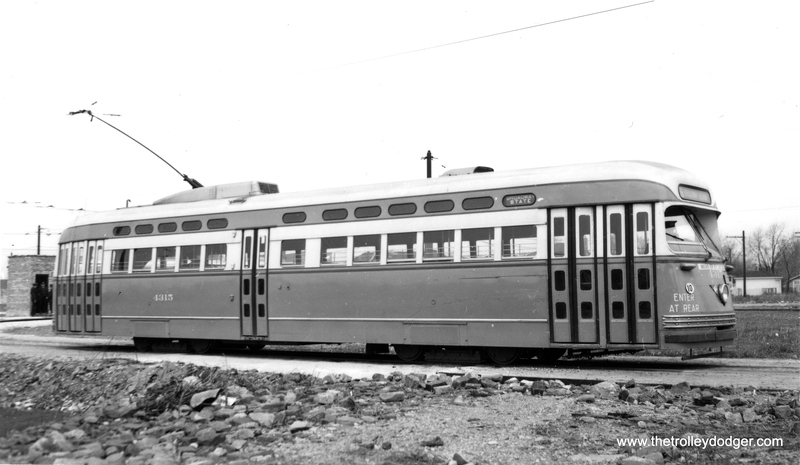 Within a year of Sprague’s demonstration, hundreds of new electric streetcar schemes were being considered and by 1900 most American cities and many small towns were connected by electric railways. 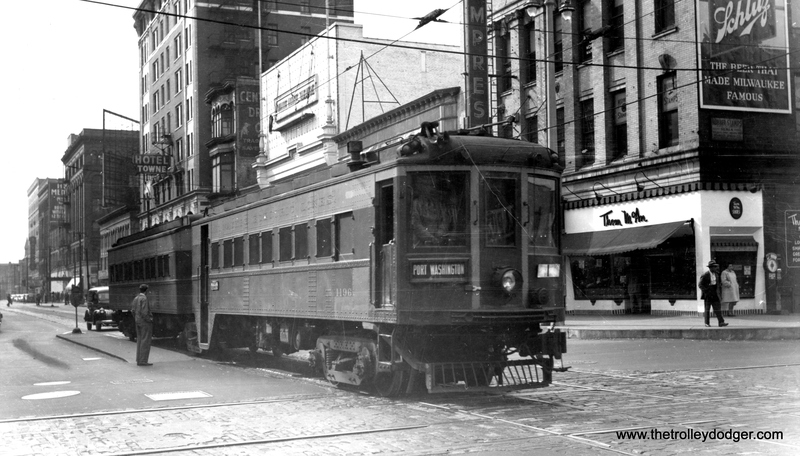 Since horsecar street railways they already had an established route structure and track infrastructure, often they upgraded existing lines with electrification. 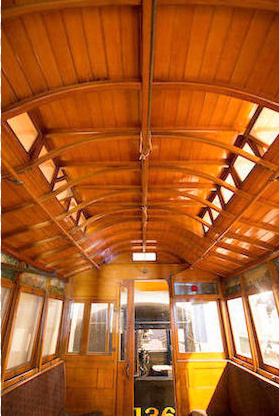 Often, companies that began as horsecar lines upgraded their operations. 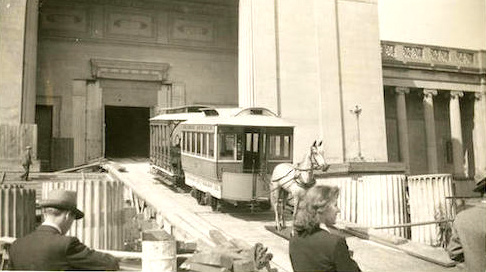 The overwhelming cost and operating advantages of electric operation rapidly displayed horsecars on city streets. 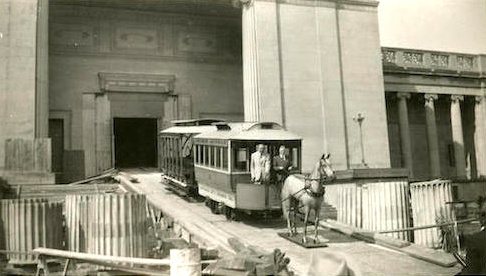 By 1900, the horsecar had vanished from most cities. 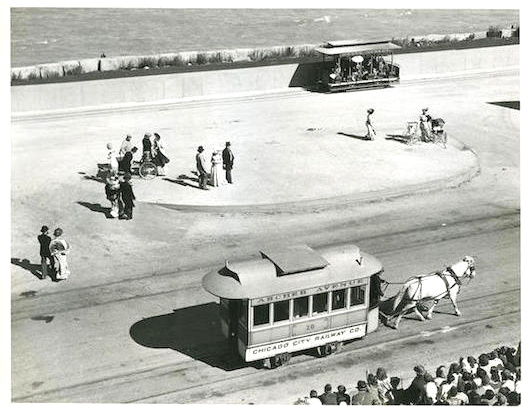 In Chicago, some horsecar and cable car routes survived until 1906 owing to a regulation or law that prohibited the erection of overhead wires in downtown areas. 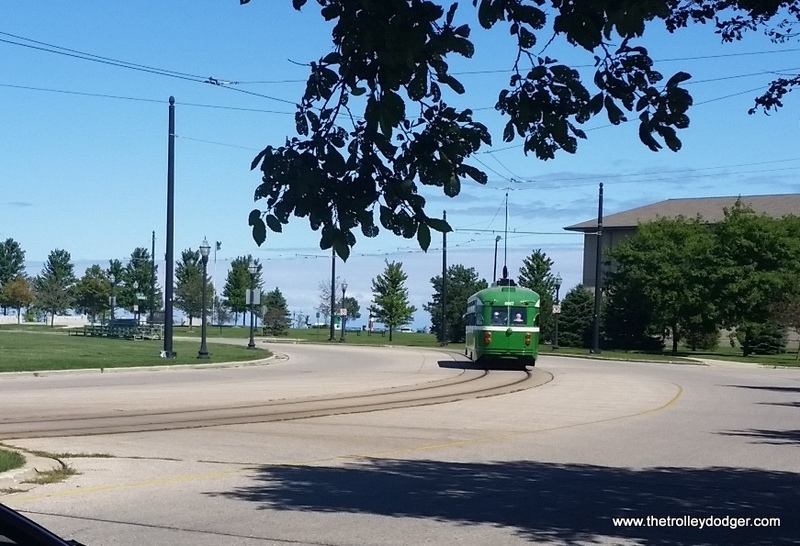 Once this obstacle was overcome the electric streetcar prevailed. 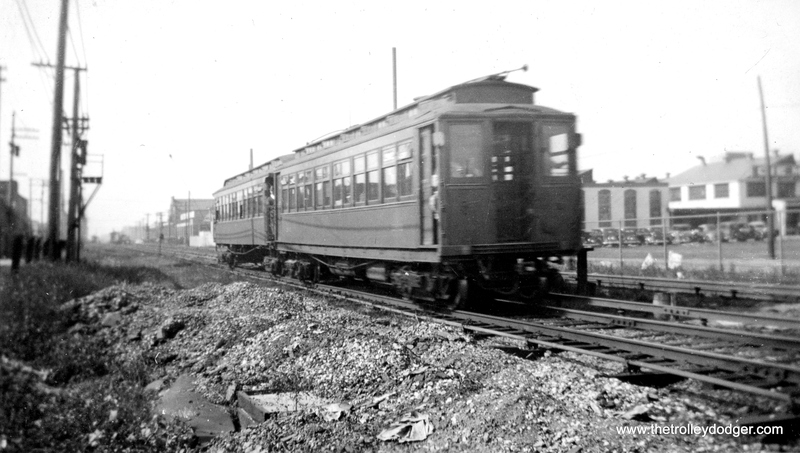 Nationally, horsecars disappeared very quickly from the scene and despite their early prevalence very few were preserved for posterity. 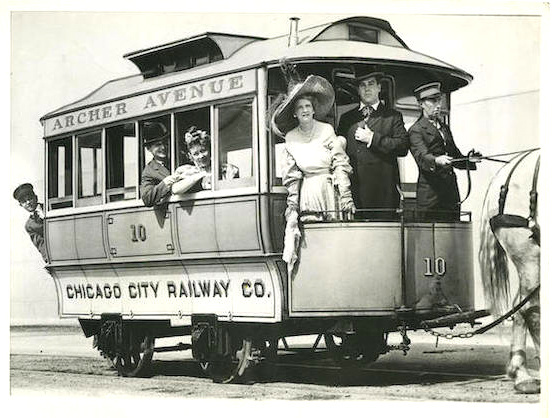 Chicago Horse Car No. 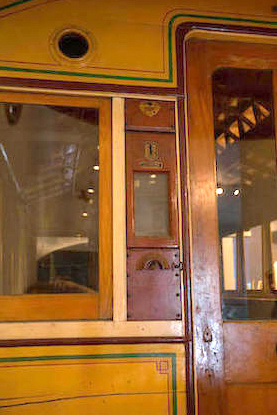 10 is a replica constructed by the Chicago City Railway at its South Shops for the Chicago Museum of Science & Industry during 1929 and 1930 and is believed to be the second object donated to the museum. 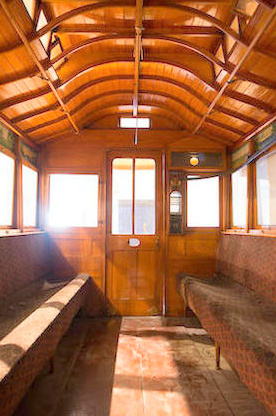 Although a replica, the car is an accurate rendition of a period street railway vehicle. 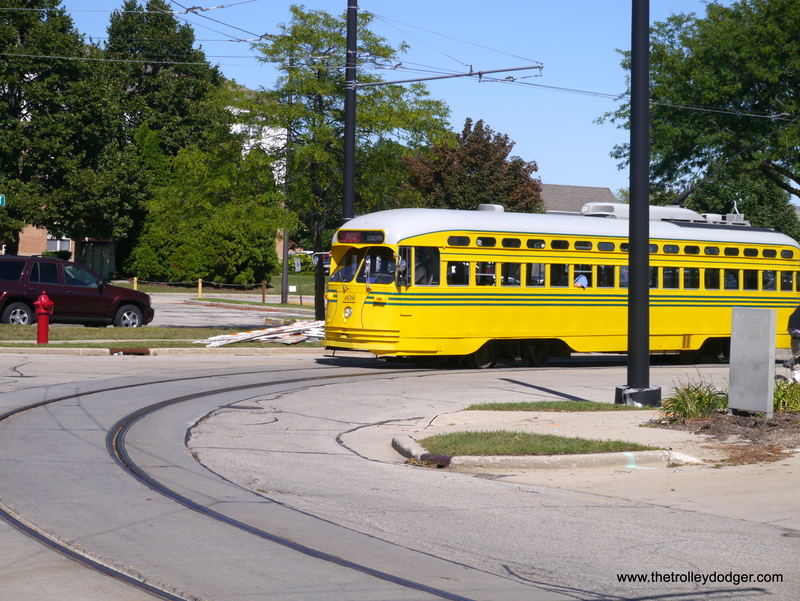 At the time of construction, it had been less than 25 years since similar horse cars had worked Chicago streets and thus the cars were still in the living memory of men working for the company. 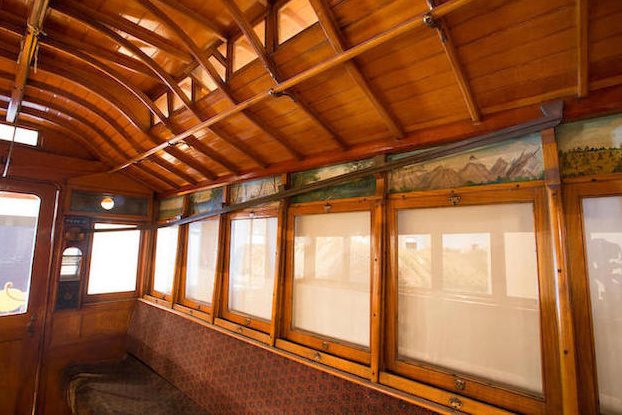 The replica was intended to represent one of Chicago’s first horse cars built in 1859. This is a comparatively small car, measuring about 9 feet 9 inches tall, 7 feet ½ inches wide,16 feet and 1 ½ inches long. It weighs 4,560 lbs. The car was designed for one-man operation with a single horse drawing it. Average speed would have been between 3-5 mph. It had space for 18 seated passengers. Passengers are believed to have entered via a door at the back of the car and paid their fare by dropping a coin into a slot that delivered it by gravity to the driver. This clever system was intended to avoid unnecessarily distracting the driver while the car was in motion. The car uses a ‘Bob-tail’ design, so-called because it only has a platform at the drivers’ end. The driver rode on the small exterior platform at the front of the car that was covered by a roof extension. Other than horse reins, his only other control was a hand brake consisting of a metal arm used to slow and stop the car and prevent it from colliding with the horse, or rolling backward when on an upgrade. 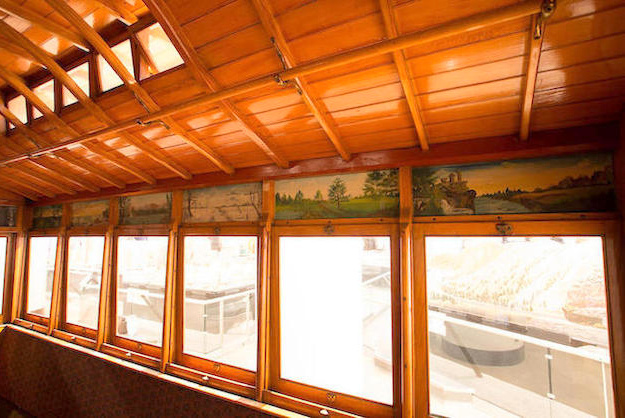 Other equipment includes a stovepipe exhaust stack from the passenger compartment, although there doesn’t appear to have been a stove installed in this replica. 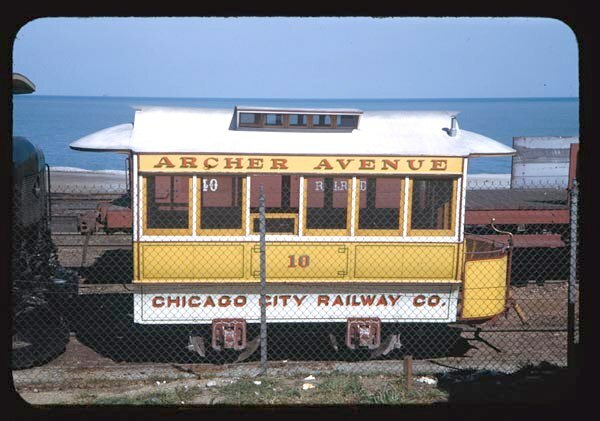 In its early years the replica was displayed as Archer Avenue No. 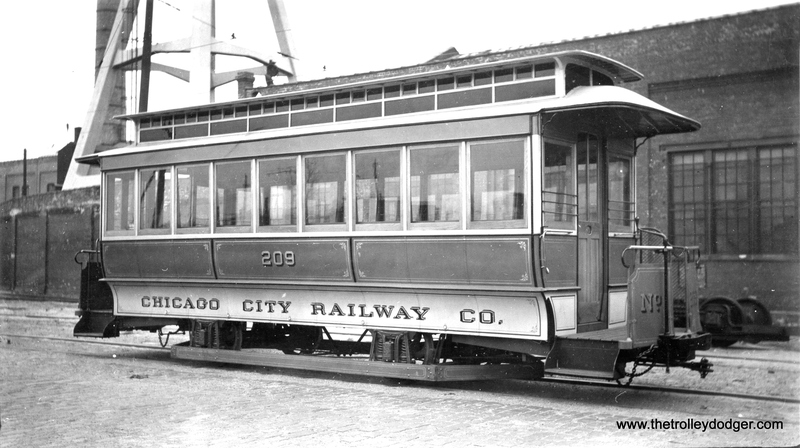 10 of the Chicago City Railway Company. 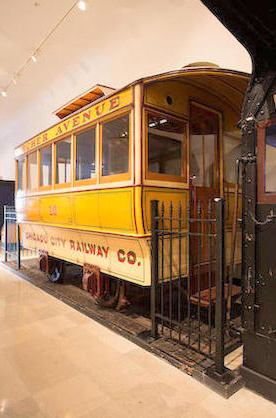 It was one of three replica streetcars used as part of a larger exhibit to demonstrate the evolution of urban transport in Chicago. 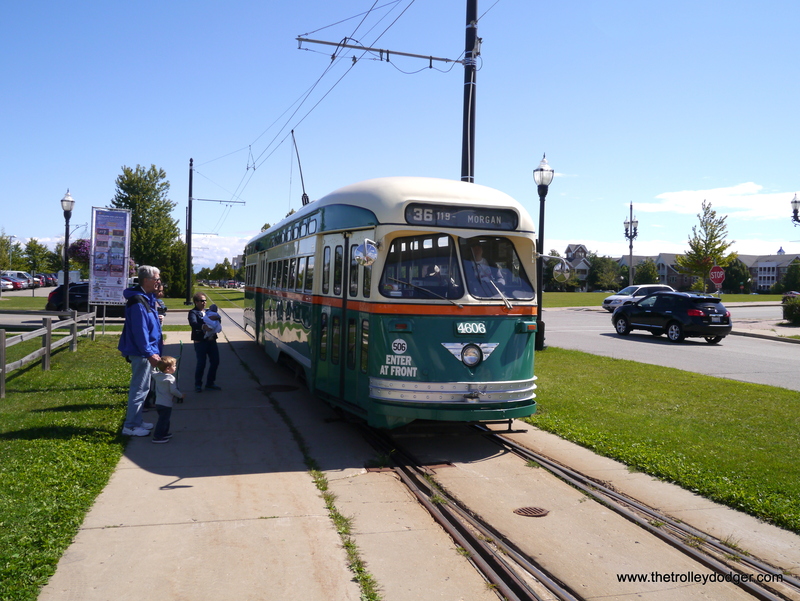 The other two cars were replicas of the cable-hauled grip car and its trailer. 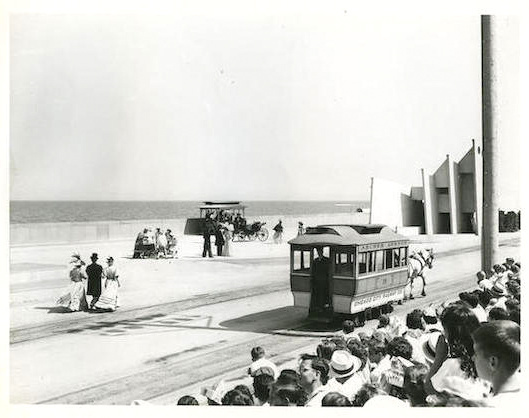 (Between 1892 and 1906 Chicago had a cable car system, similar to that still in use in San Francisco, that was the most extensive of its kind in the world). Horsecar No. 10 was among the exhibits at the ‘Wings of a Century’ pageant for the Chicago Century of Progress Exposition held during 1933 and 1934. 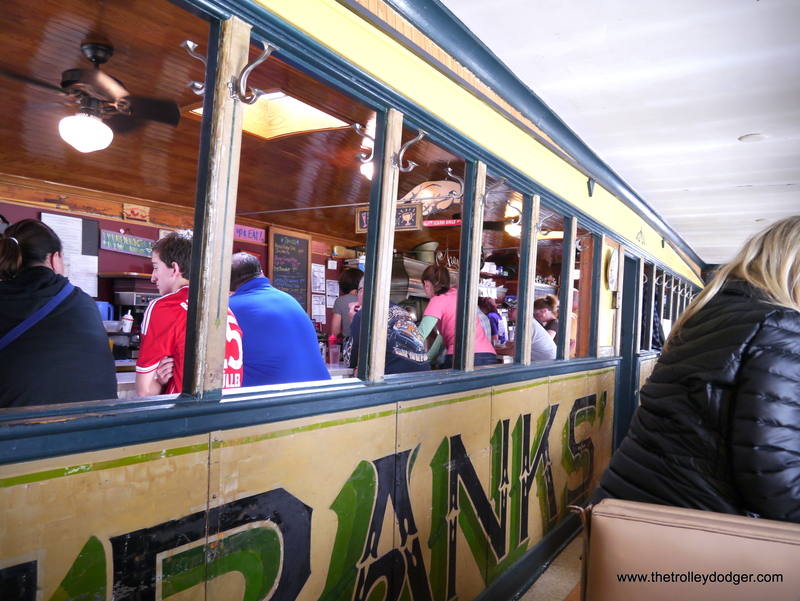 As an authentic replica, Chicago Horsecar No. 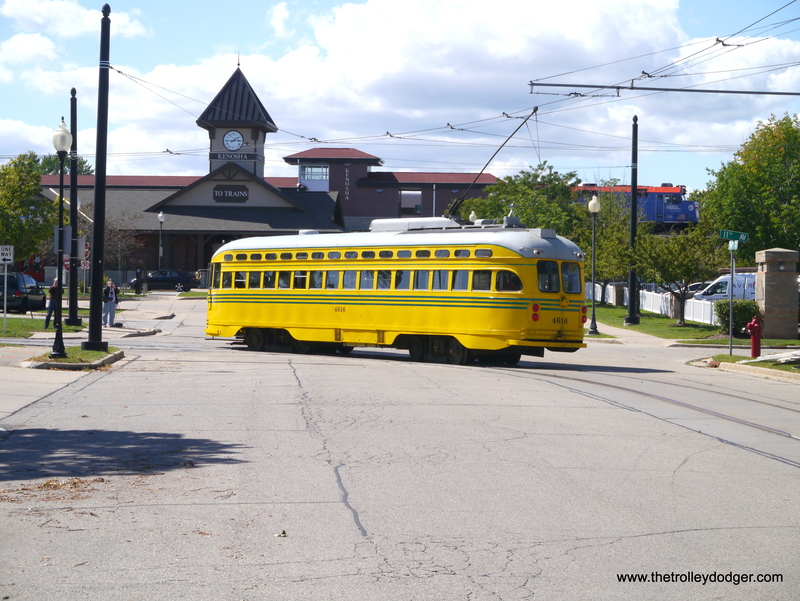 10 can provide a key element to any urban transport exhibit since it bridges the gap between the horse-drawn omnibus and the electric streetcar. 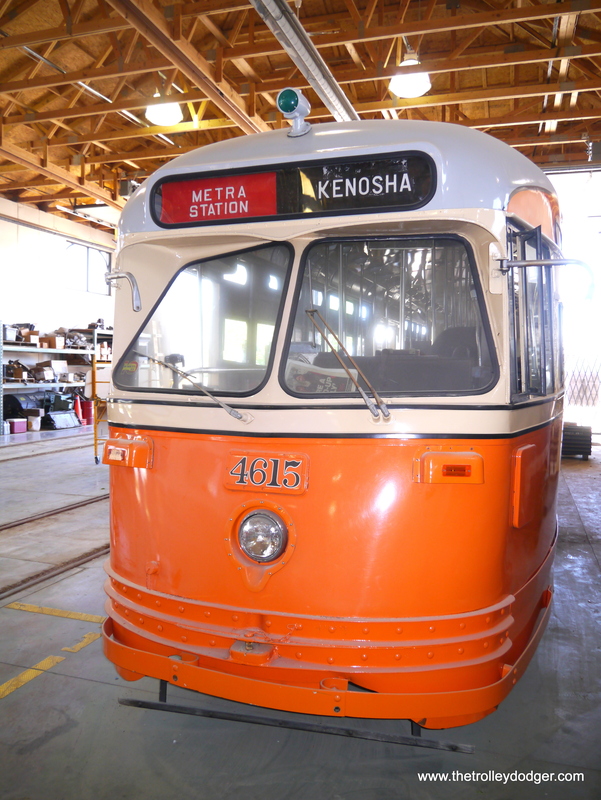 This piece is significant to both Chicago history and to the greater story of urban transportation in North America. 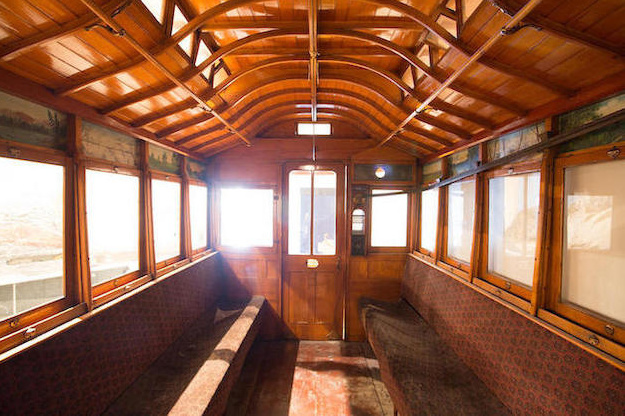 It also demonstrates the comparatively primitive expectations of the traveling public at the time of the American Civil War. Comfort levels and travel speeds were much lower than today. Imagine riding to work every morning and home every evening squashed into a vehicle like this one? As indicated in the special notice above, this lot will require special arrangements for viewing and collection. Please contact Samantha Hamill in the NY Motorcars department (+1 212 461 6514, samantha.hamill@bonhams.com) to arrange a viewing and for further information. Please note that this lot may not come with its original base. 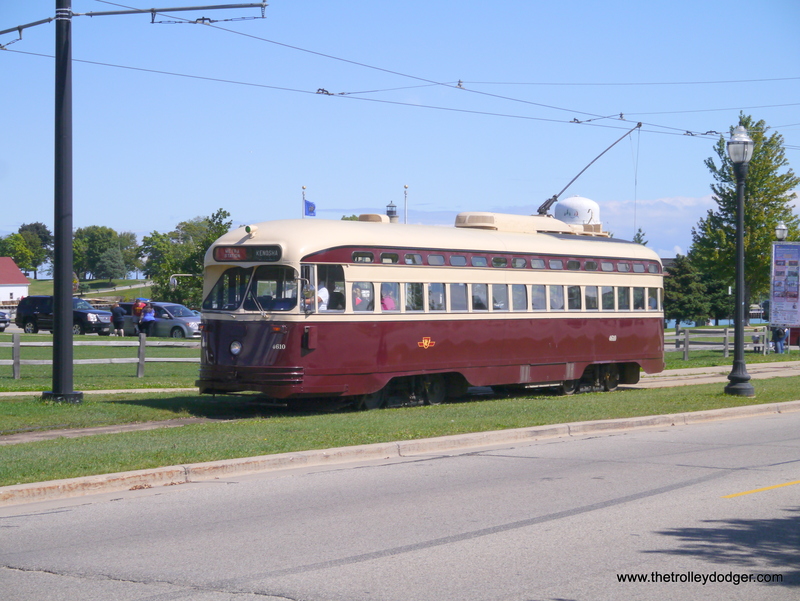 The car, which looks beautiful both inside and out, took a long road to get there, starting in Toronto in 1951, with a stint at the East Troy Electric Railroad. 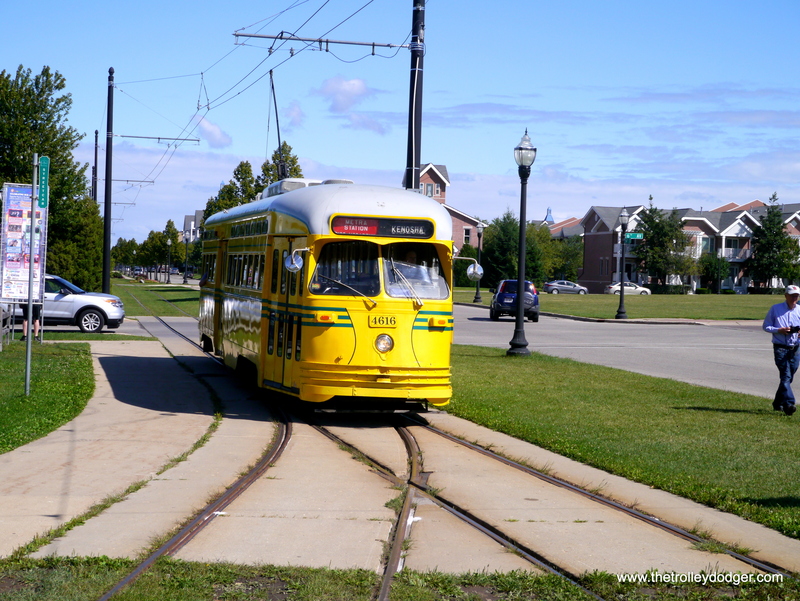 Being a single-ended car, it was not a good fit for the museum, which lacks turning loops at its ends. 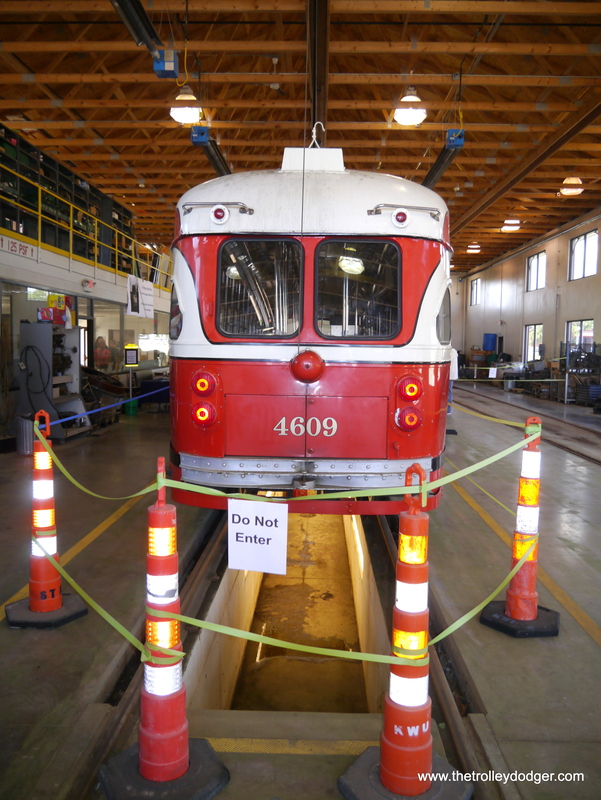 To operate 4617 on that line would involve backing up the car 50% of the time. We can be thankful that it has found a good home elsewhere in Wisconsin. We got there just in time for the ceremonial breaking of a banner as the car backed out of the barn. 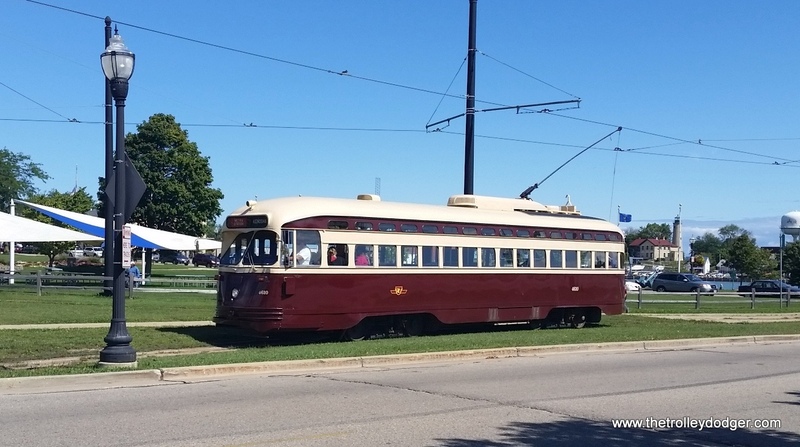 They put the car on display for a while and then began running it on the two mile long trolley loop that goes between the local Metra station and the lakefront. 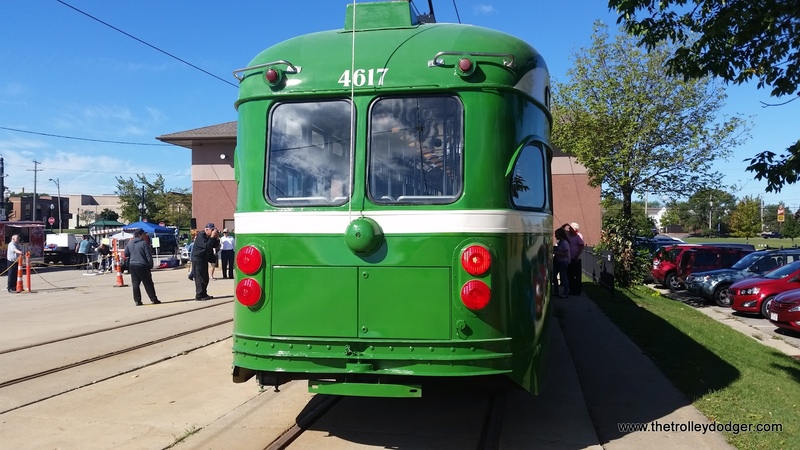 The San Francisco car joins a fleet that already pays tribute to such cities as Chicago, Pittsburgh, Johnstown PA, Philadelphia, Toronto and Cincinnati. 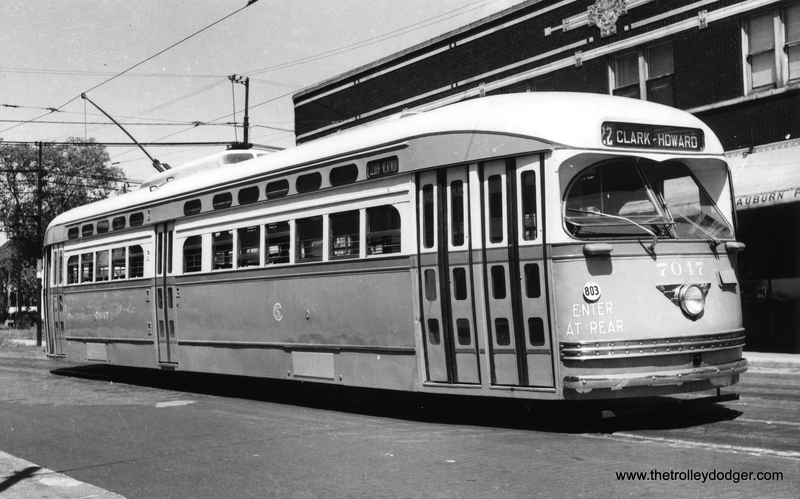 All of these (except for the Philadelphia car) were built in Canada and originally ran in Toronto. 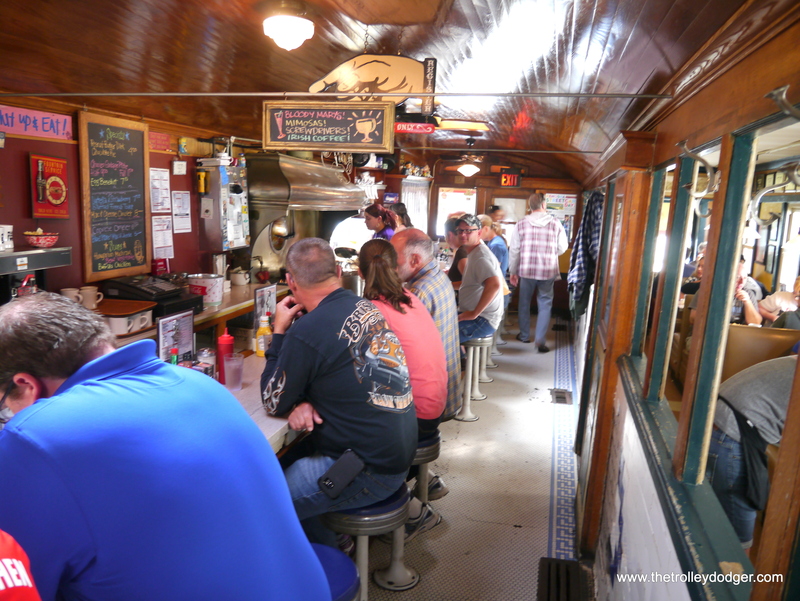 After stopping for lunch at the historic Franks Diner, where they serve up a kind of organized chaos along with their signature “garbage plate” of eggs, cheese, meats, onions, green peppers and hash browns, we rode the 4617 and took many pictures and videos of it and the other cars that were being shuffled in and out of service. 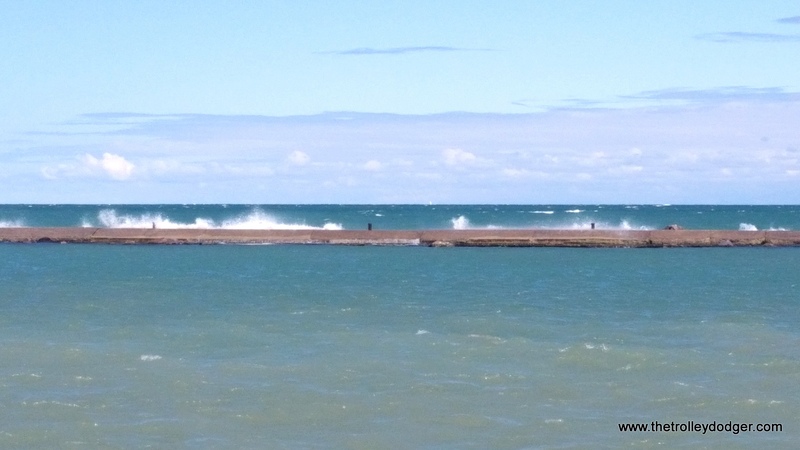 With the wind and all the clouds out over Lake Michigan, we could have had some foggy San Francisco weather, but the day was mostly sunny instead. 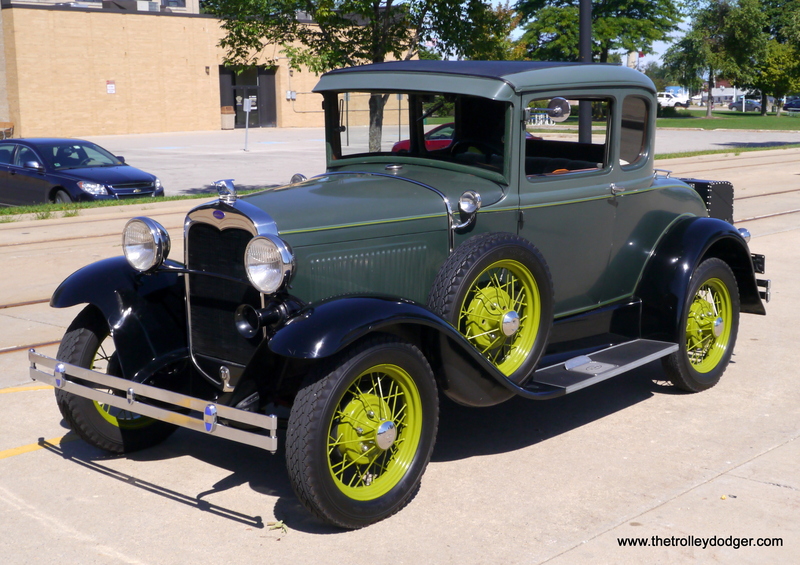 Besides the streetcars, we also spotted a couple of classic autos– a rare 1929-32 Cord L-29, the first production car in the US with front-wheel drive, and a 1927-31 Ford Model A. 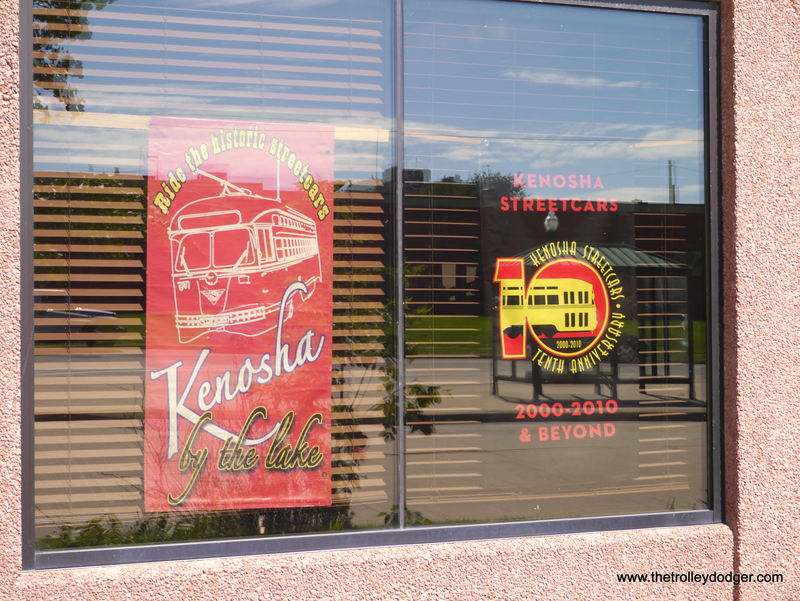 If you have not yet visited Kenosha’s streetcar loop, it is well worth a trip. 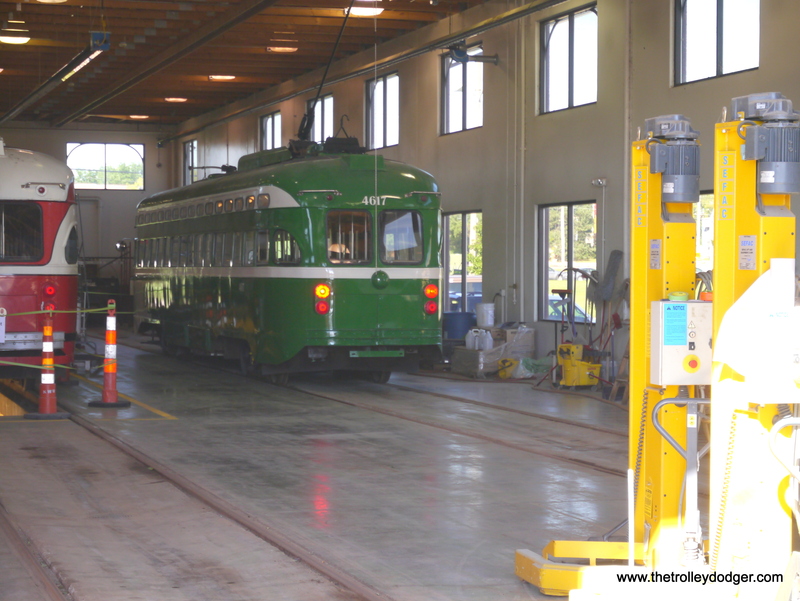 And while plans to expand the system have been shelved for the moment, they run a first-class operation, in large part due to the hard work of streetcar technician Brad Preston. 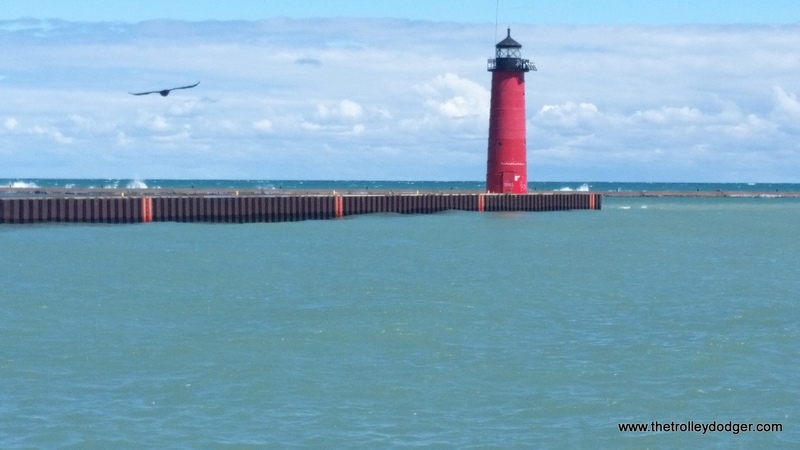 PS- Today’s photos and videos are by David Sadowski and Diana Koester. 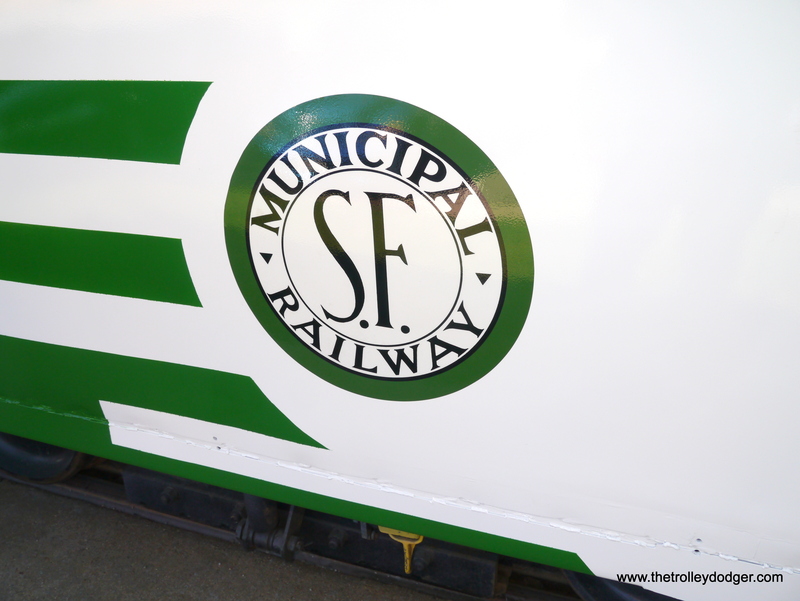 You can read another article about the SF tribute car on the Market Street Railway blog. We have reached another milestone now, with more than 70,000 page views from nearly 21,000 individuals since this blog started in January. 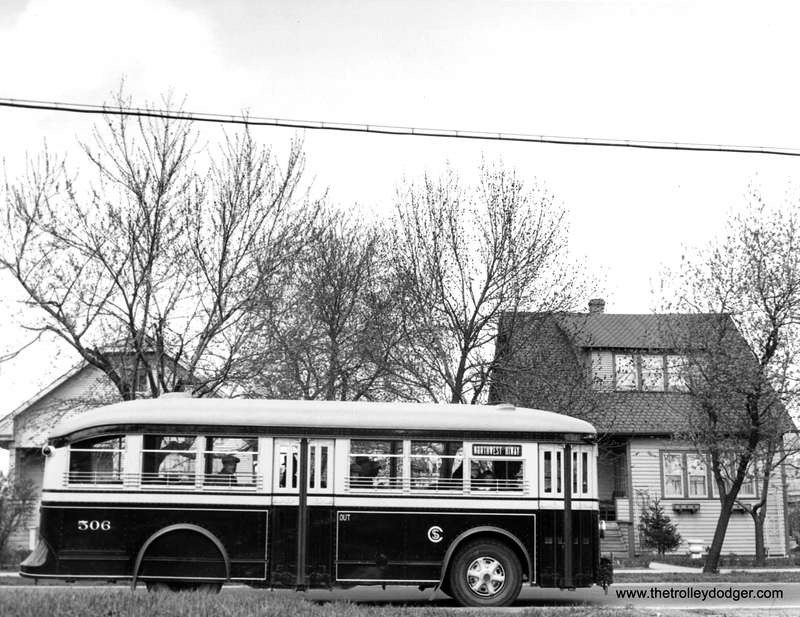 While our main interest is in electric transit (streetcars, light rail, rapid transit and interurbans), from time to time we get requests to show bus pictures. We don’t have many, but we figure it’s time to make good on our promise to show what we do have. 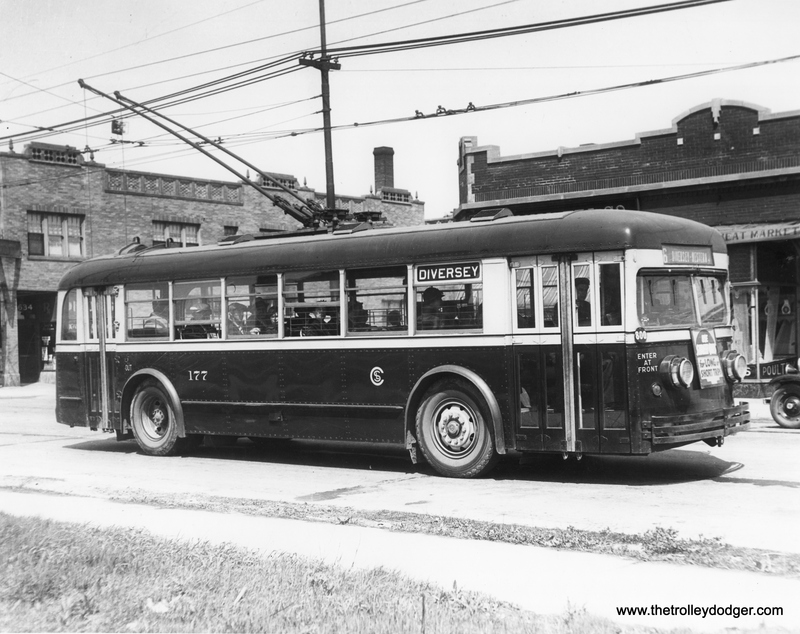 Buses have been an important part of Chicago’s transit scene since the 1920s, when the Chicago Motor Coach Company began using them. 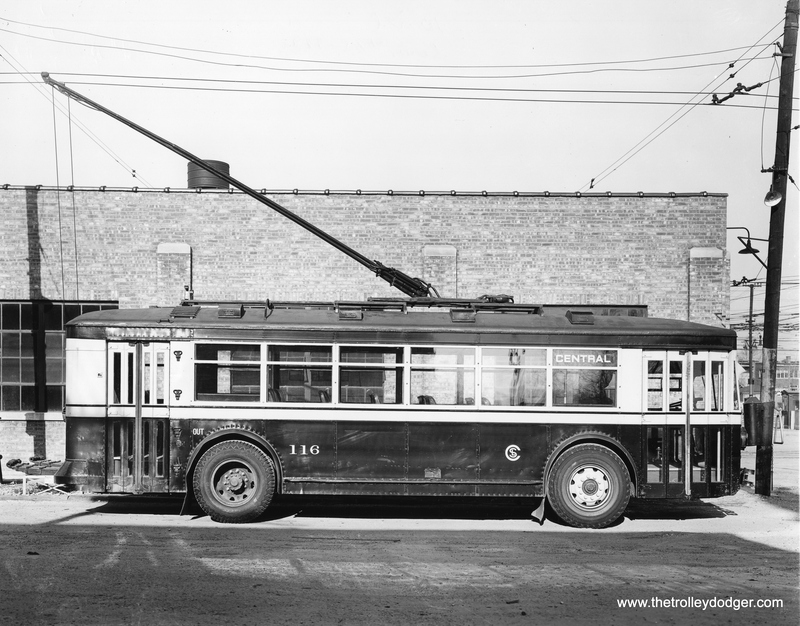 Whether you call them trolley buses, trolley coaches, or trackless trolleys, rubber-tired buses with overhead wires were used in Chicago from 1930 to 1973 and were very popular. 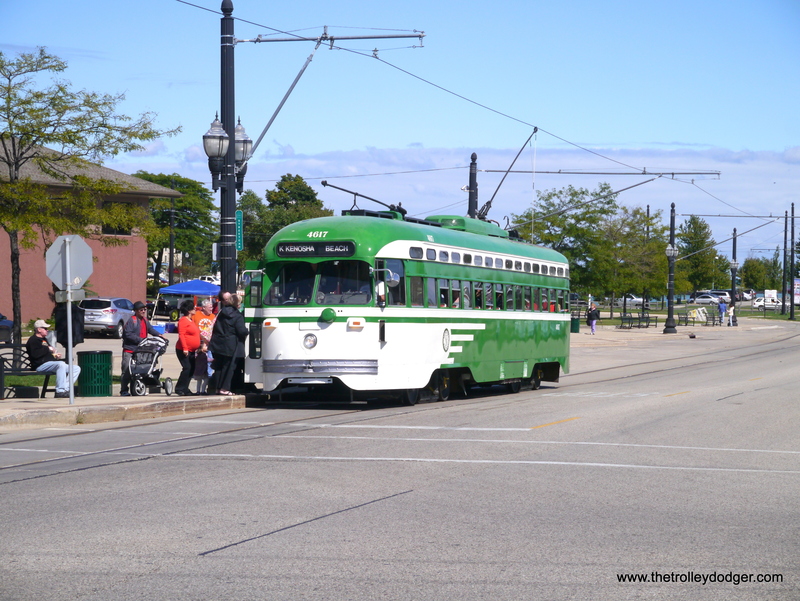 I have fond memories of riding them as a kid, since I lived near Grand, Fullerton, North Avenue and several other such northwest side routes. 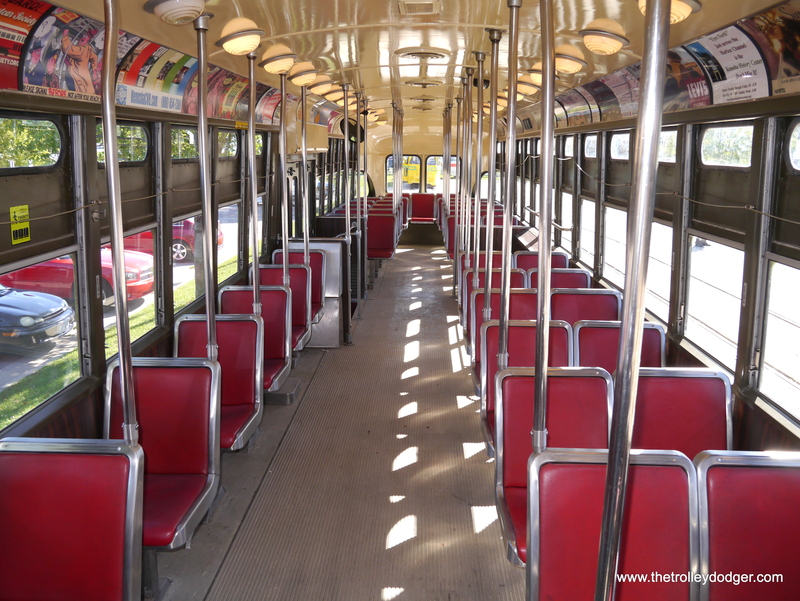 They remain in use in half a dozen North American cities to this day. 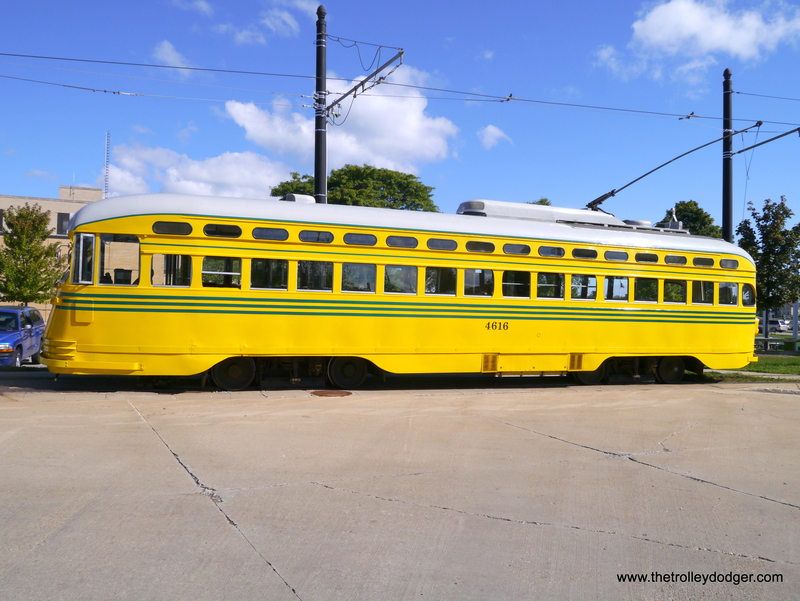 It is not widely known, but the Illinois Railway Museum has an operating trolley bus line and actually has six Chicago trolley buses in its collection, in addition to some from other cities. 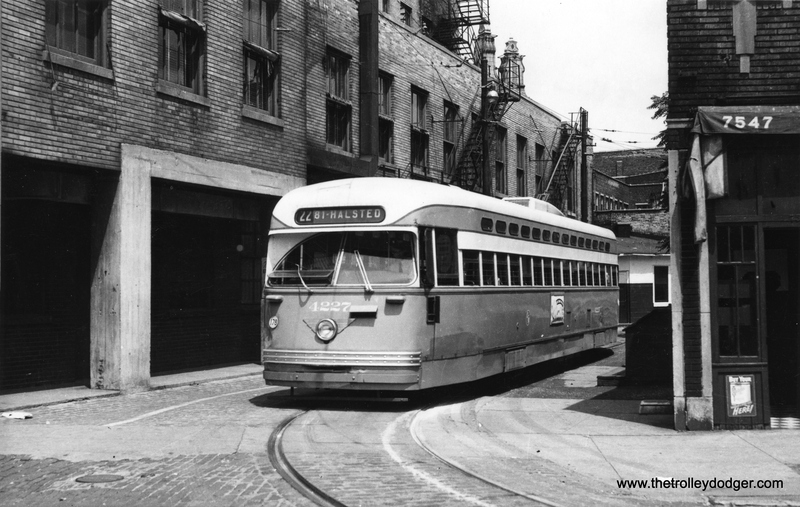 In our recent E-book Chicago’s PCC Streetcars: The Rest of the Story, available in our Online Store, we discuss how Chicago transitioned to an all-bus surface fleet. 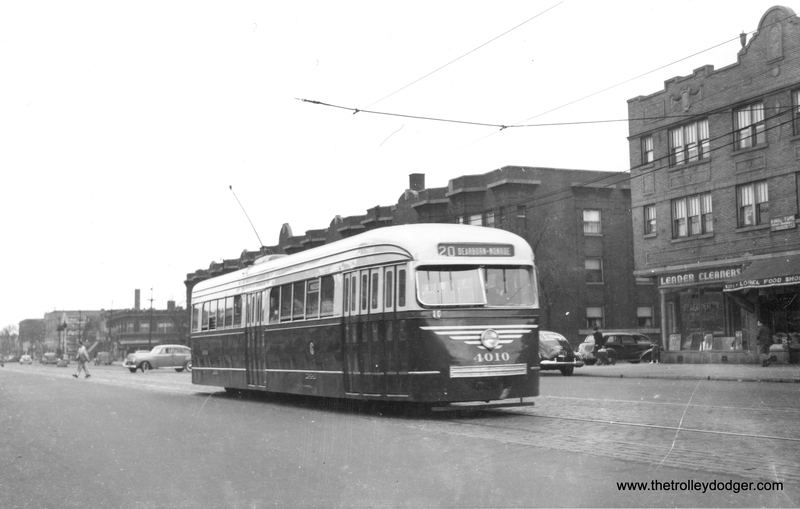 From 1930 to 1947, the Chicago Surface Lines believed in “Balanced Transit,” where streetcars were best for the heaviest routes, trolley buses for the medium sized ones, and gas buses for the lightest routes. 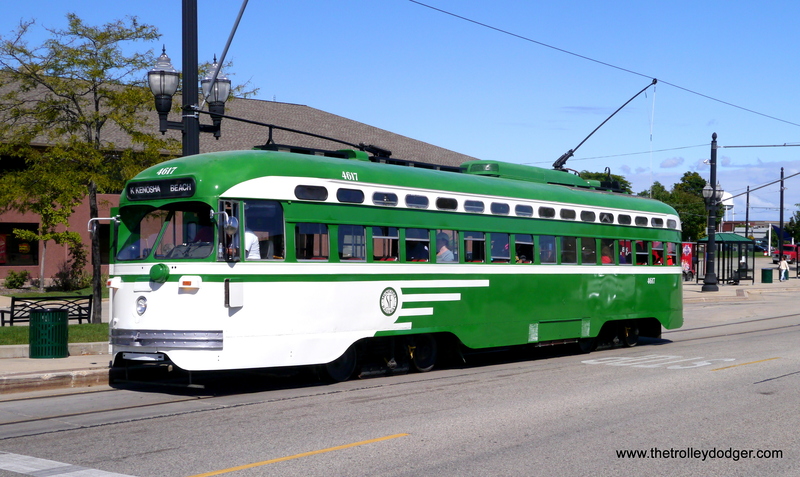 The 1937 “Green Book” study commissioned by the City of Chicago, following national trends, envisioned replacing about half of the streetcar system with buses. 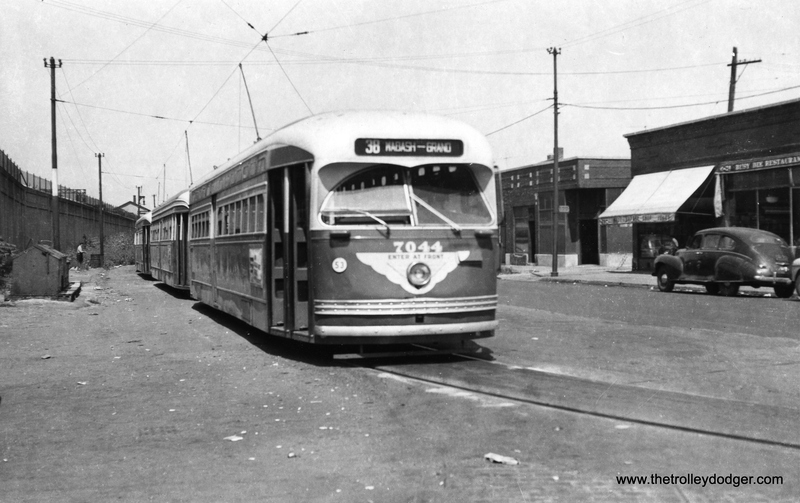 However, the report, mainly written by Philip Harrington, who became the first head of the Chicago Transit Board, governing body of the CTA, also said that in the future, it might be advantageous to replace all the streetcars with buses. 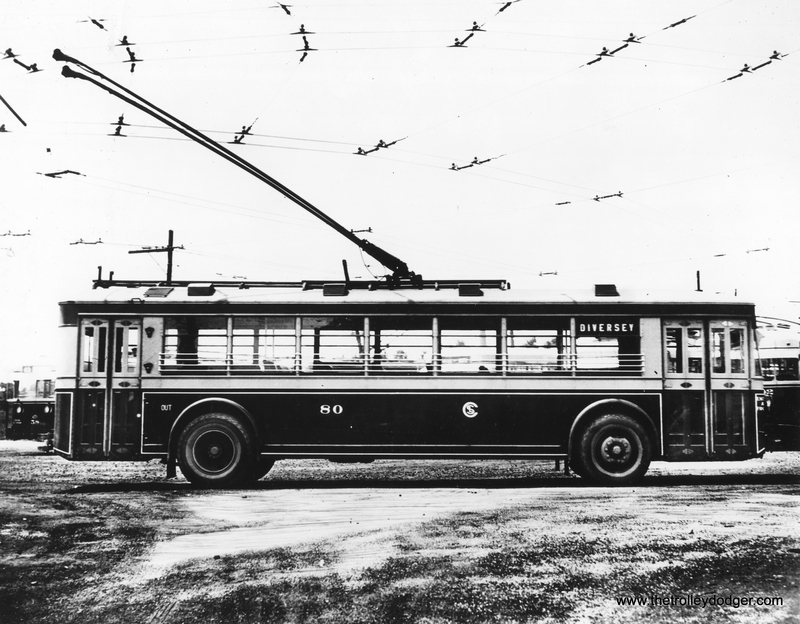 If not for World War II, Chicago might have undergone a more orderly transition to buses over a longer period of time. 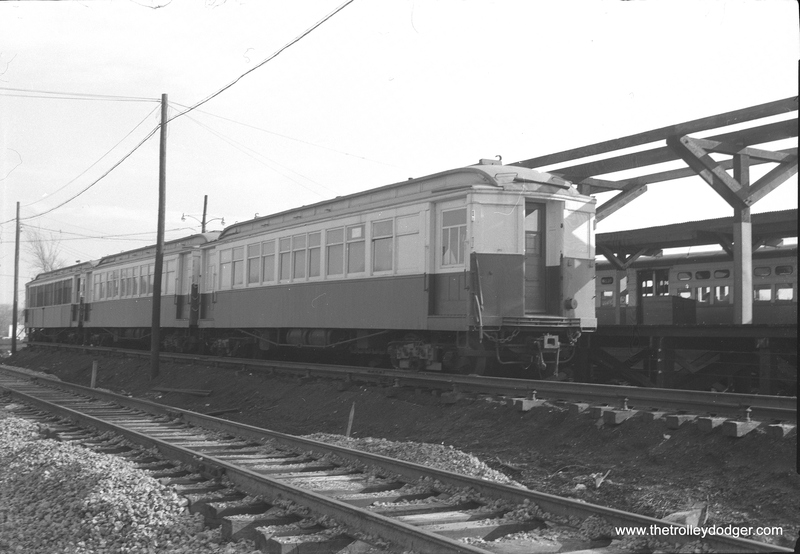 But the delays caused by wartime shortages and the Great Depression meant that much of CSL’s rolling stock was quite old by the end of the war. 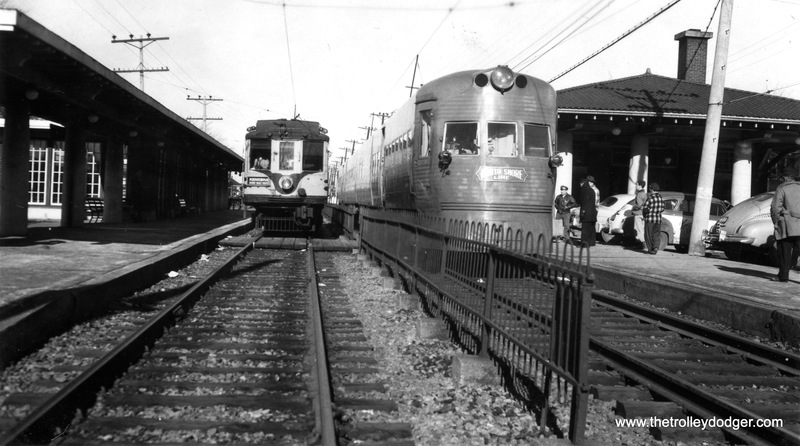 Although CTA did not take direct control until October 1, 1947, they felt they had been given a mandate to make transit improvements immediately. 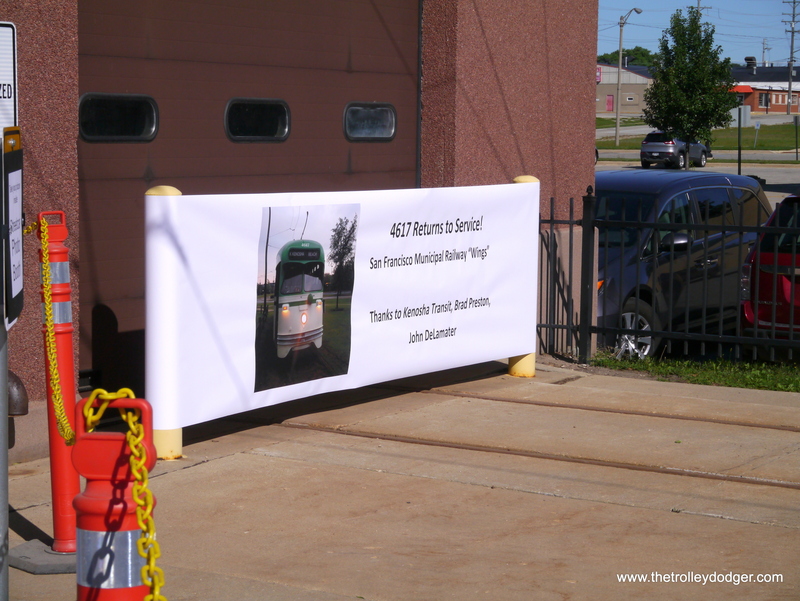 Therefore, they “stage managed” equipment orders and actually dictated on what routes the new equipment was used on. 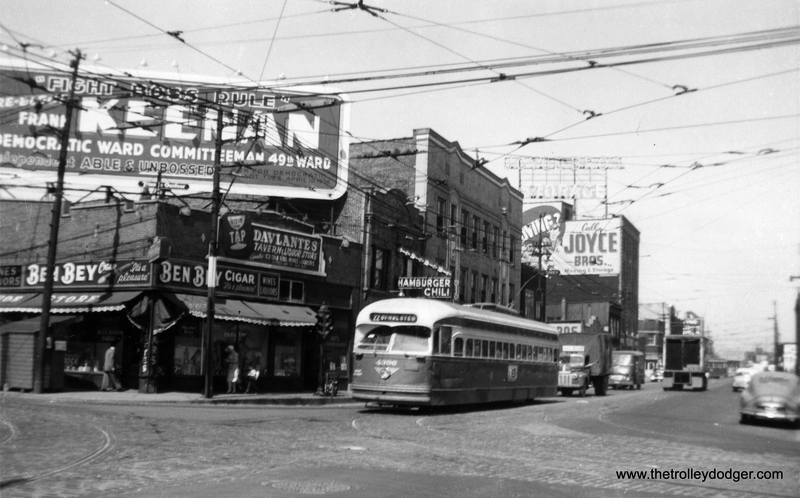 During this period, many CSL routes received extensions to areas of the city that had been developed since the last streetcar lines were built. 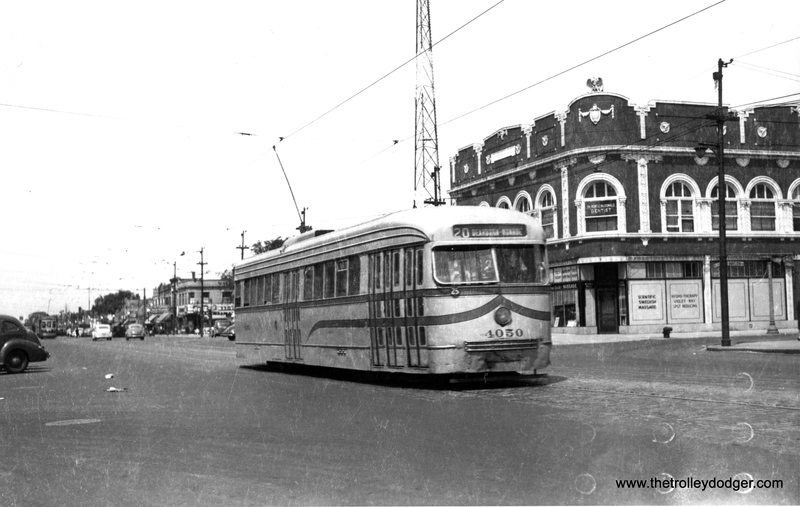 Express bus routes were also started. 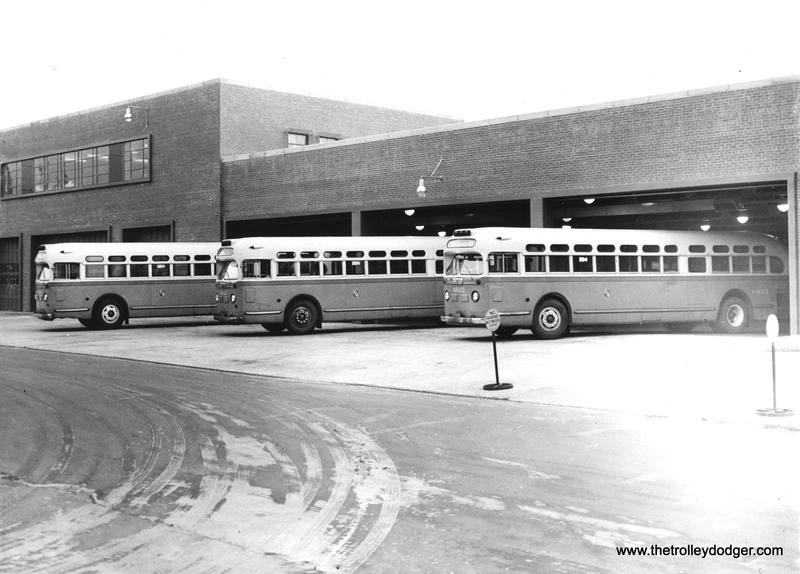 Transit unification in Chicago finally became complete when the CTA purchased the assets of the Chicago Motor Coach Company, effective October 1, 1952. 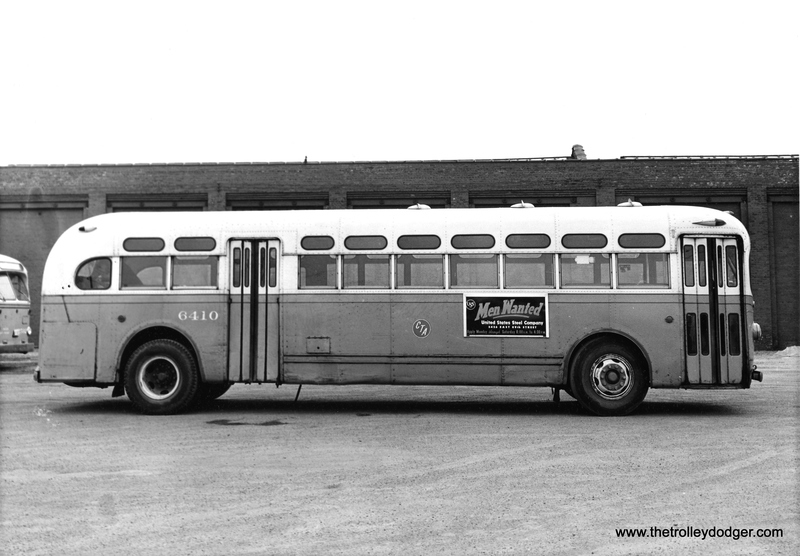 CMC was a privately owned bus operator whose routes mainly ran on Chicago’s boulevards and parks. 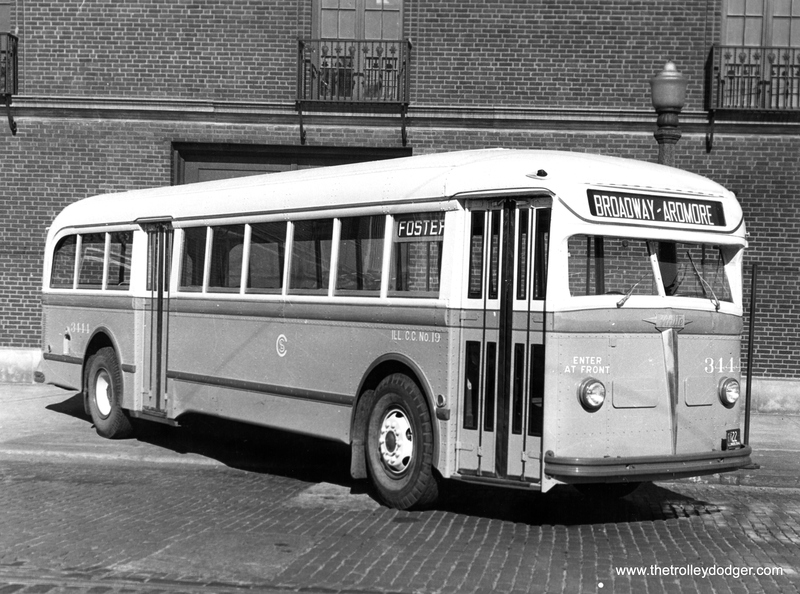 By 1952, they had a fleet of about 600 buses. 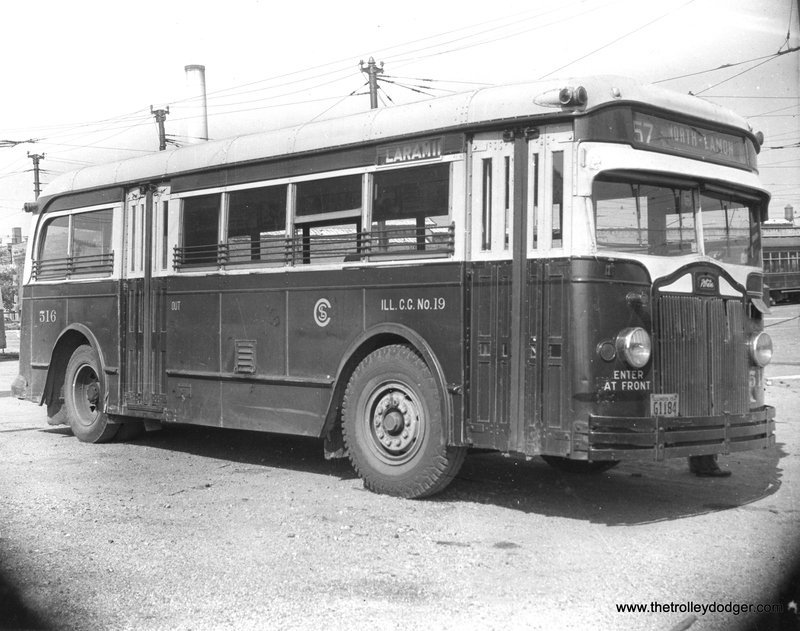 The Motor Coach was profitable, while CTA during this period was losing money. 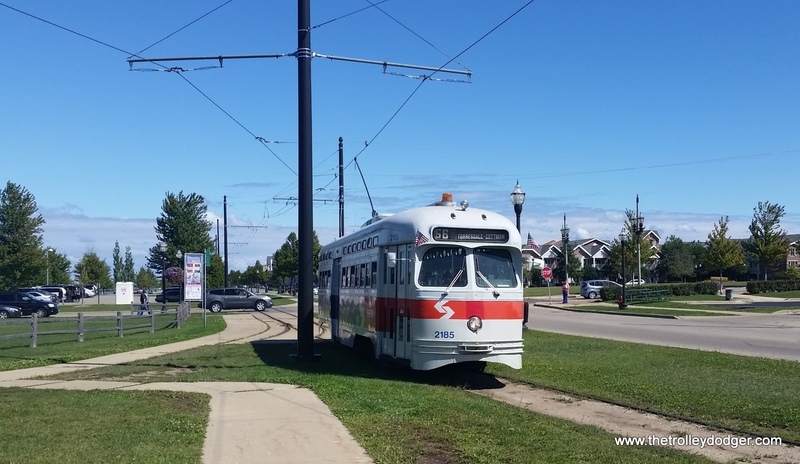 CTA felt that CMC was skimming the profitable “cream” off the city’s surface routes, and they wanted desperately to buy them out. As it happens, the CTA had to pay at least $1m more for Motor Coach than they had wanted to, since they were, after all, a profitable enterprise that was owned by a national company that did not really want to sell. 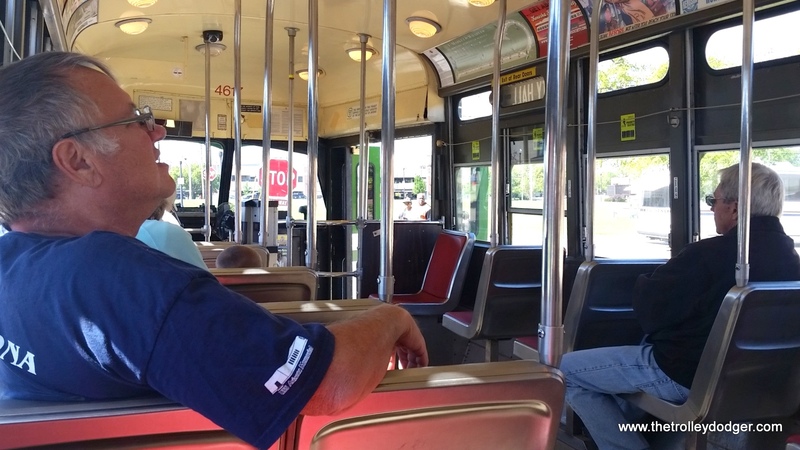 The CTA applied some “hardball” tactics in the run-up to the sale. 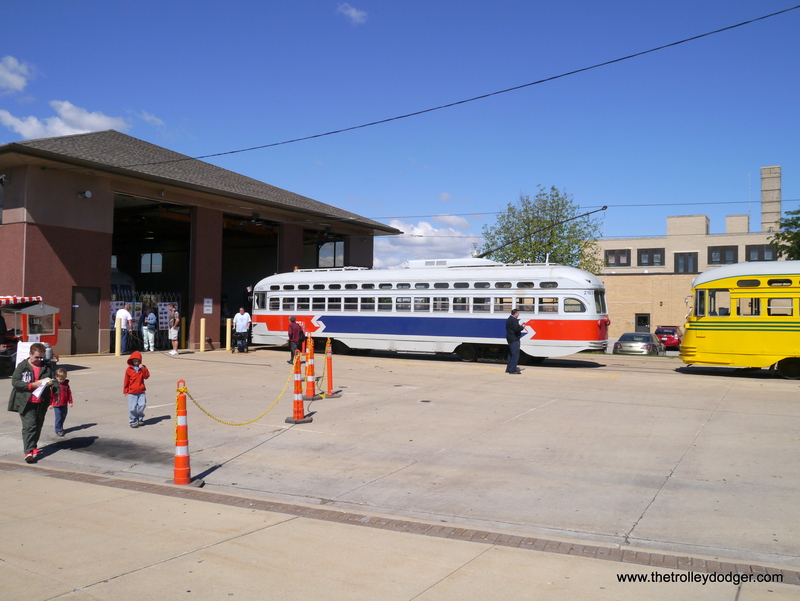 They tried to stop accepting transfers from CMC buses, and since there was a fare differential, began collecting the difference between the lower CMC fare and the higher CTA fares when riders did transfer. 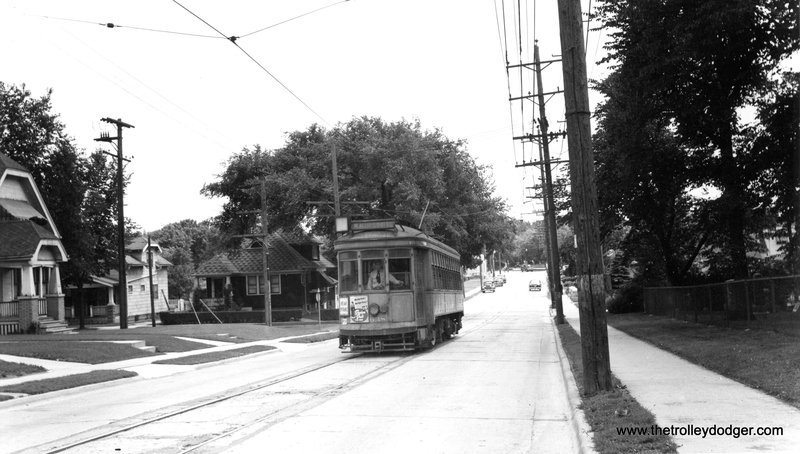 In addition, they began competing directly against CMC on the Austin Boulevard route. There was more of this to come, and CMC saw the handwriting on the wall and sold out. 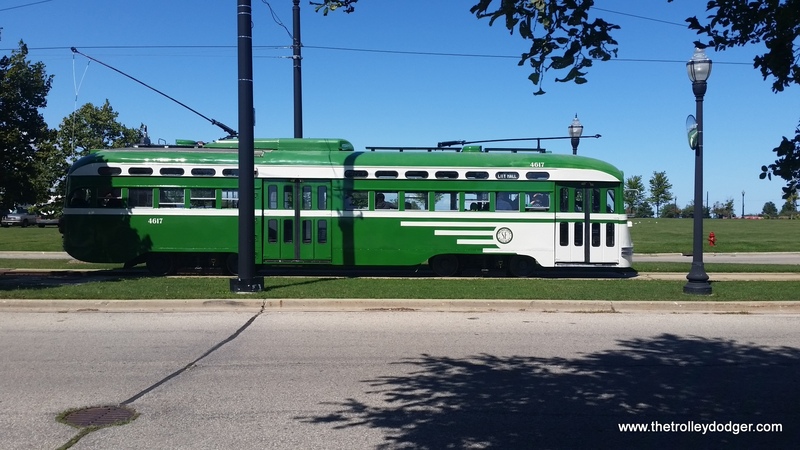 After all, they had never actually been operating under a franchise from the City of Chicago, while the CTA, the courts determined, had few constraints on what they could do. 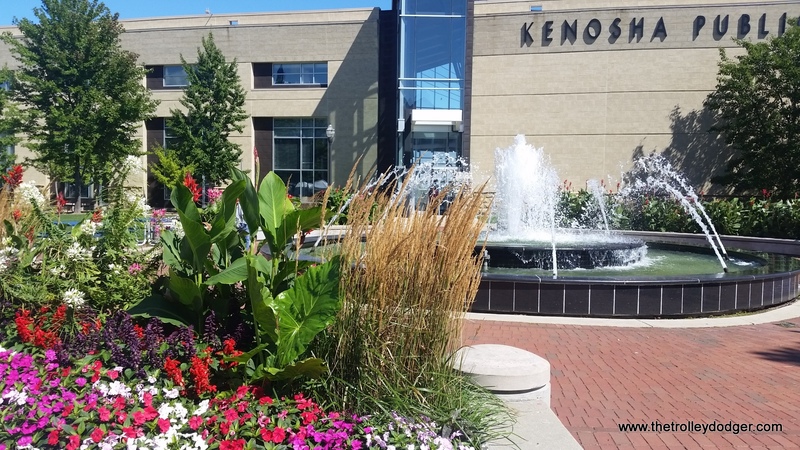 Mayor Martin H. Kennelly made public statements that opposed the sale, although there is some evidence that he was in favor of it privately. 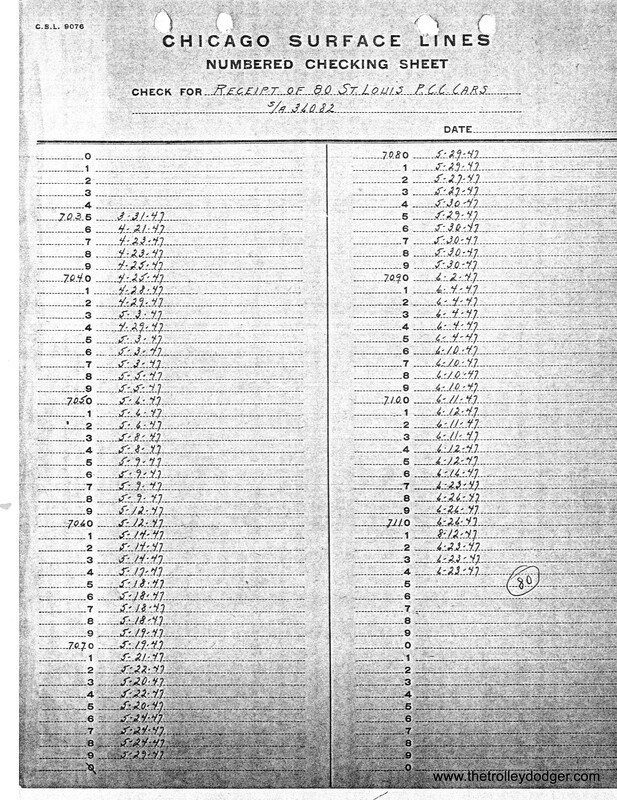 Immediately upon taking over Motor Coach, the CTA raised the fares on those routes so that they matched the CTA’s higher rate. 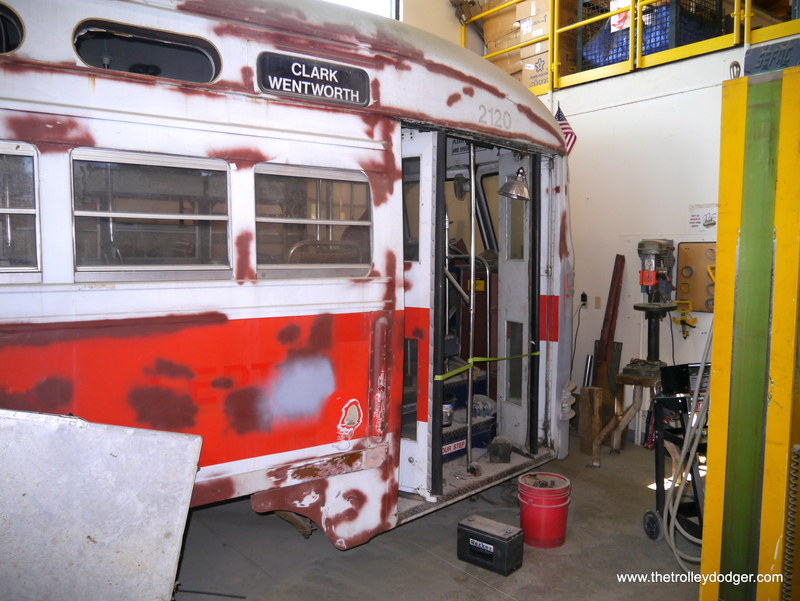 Perhaps not coincidentally, it was right at the time that the CTA announced their so-called “PCC Conversion Program,” whereby 570 of the 600 Postwar cars were eventually scrapped, and some of the parts recycled for use in new rapid transit cars. 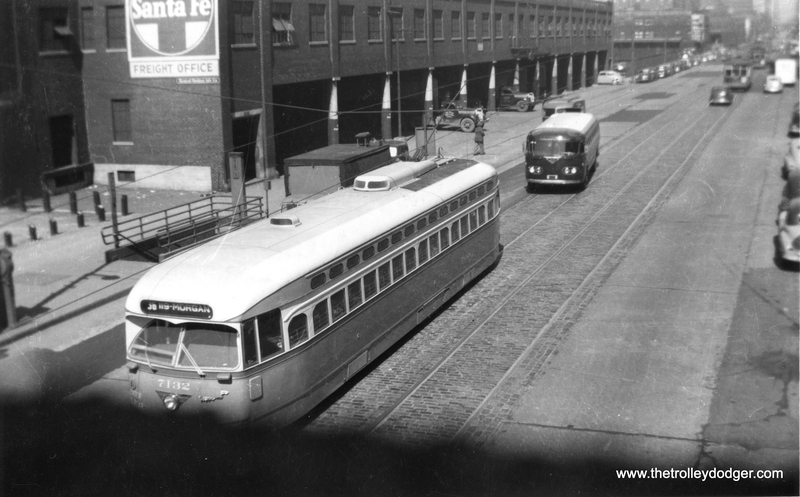 At this point, the CTA had achieved a virtual monopoly on surface transit in Chicago, and no longer had to try and compete with the Motor Coach Company. 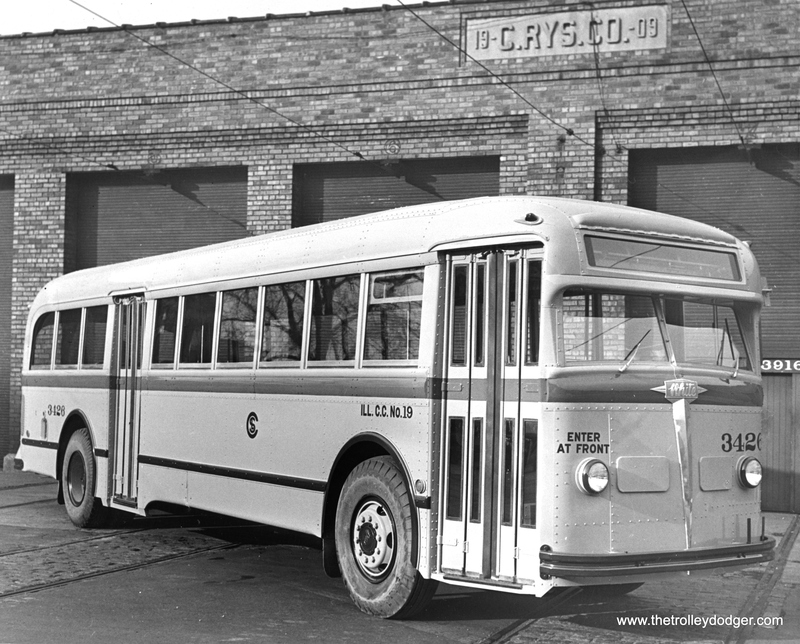 Interestingly, CTA did not purchase the Motor Coach name, which is why it is now in use by a private operator. 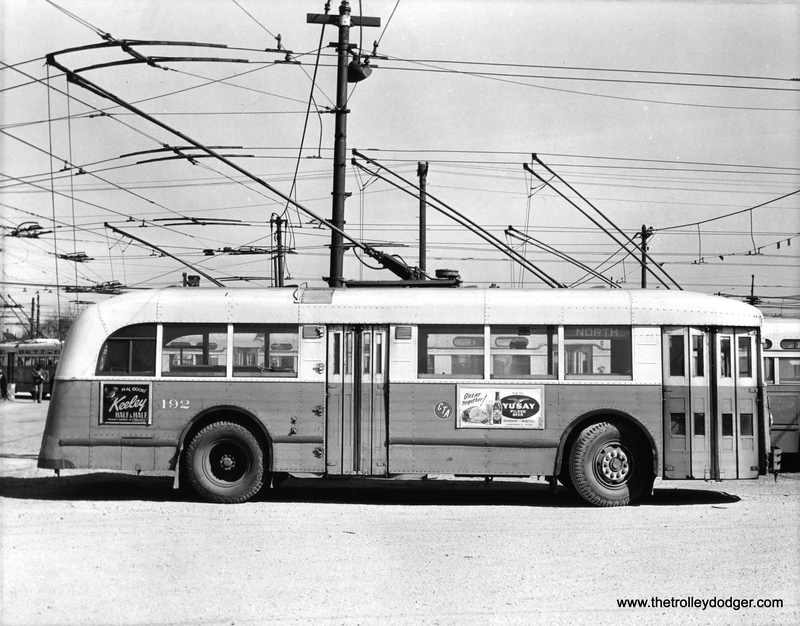 PS- For more Chicago trolley bus pictures, check out Tom’s Trolleybus Pix. 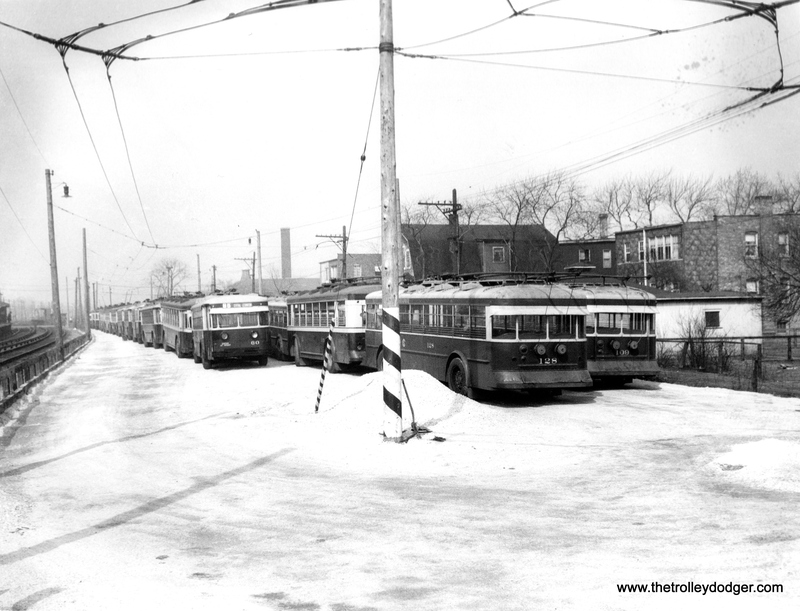 CSL trolley buses at a storage yard at Central and Lexington. 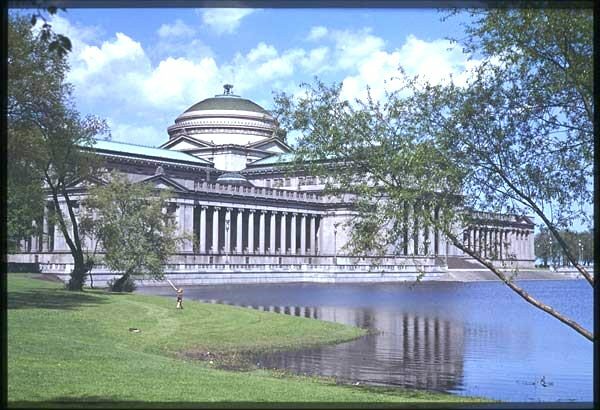 The Garfield Park “L” is at left. 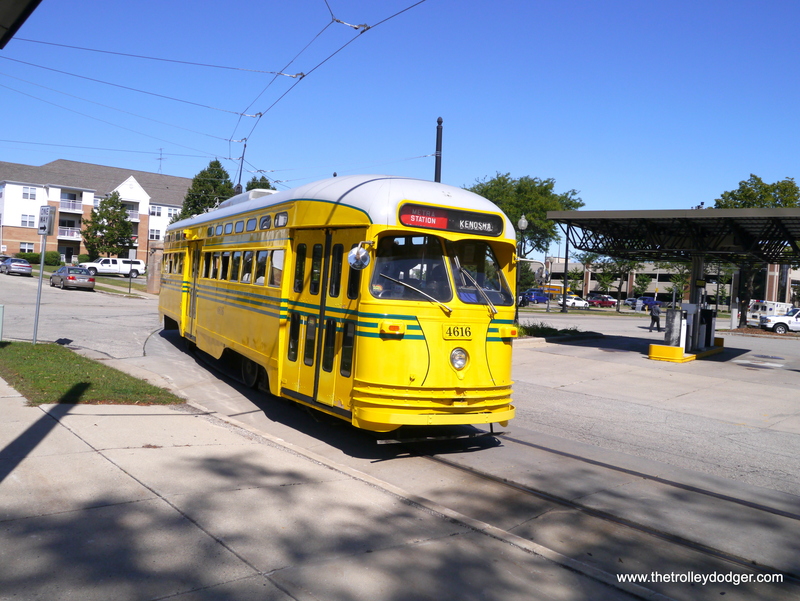 CSL 6511 and other TDH 4506’s in Garfield Park. 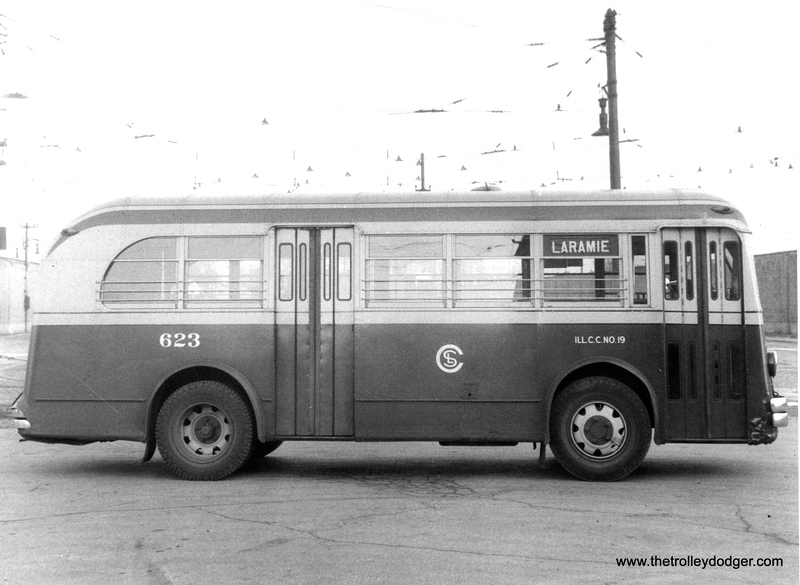 CSL 623 at the North and Cicero garage. CSL 3405 at Archer and Rockwell. 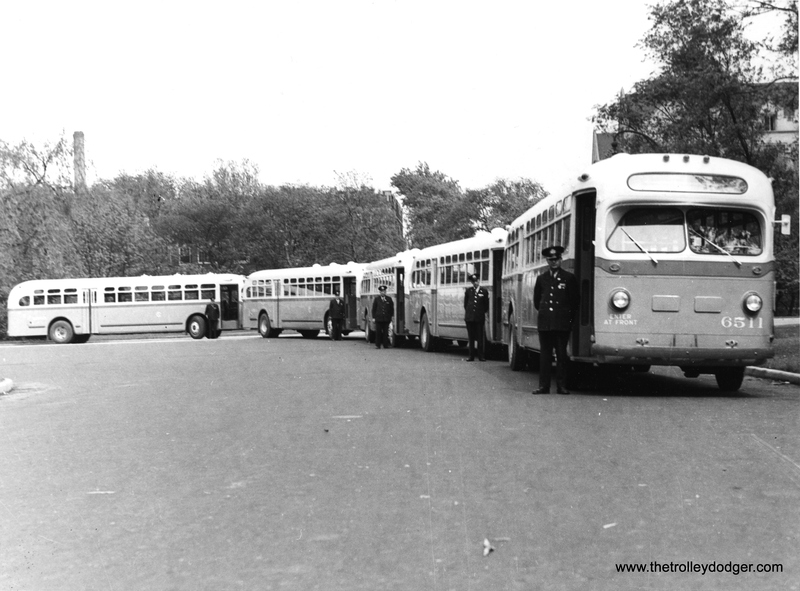 The largest group of coaches ordered by CSL from a single builder was 3400-series White 798 buses, 297 units at total. 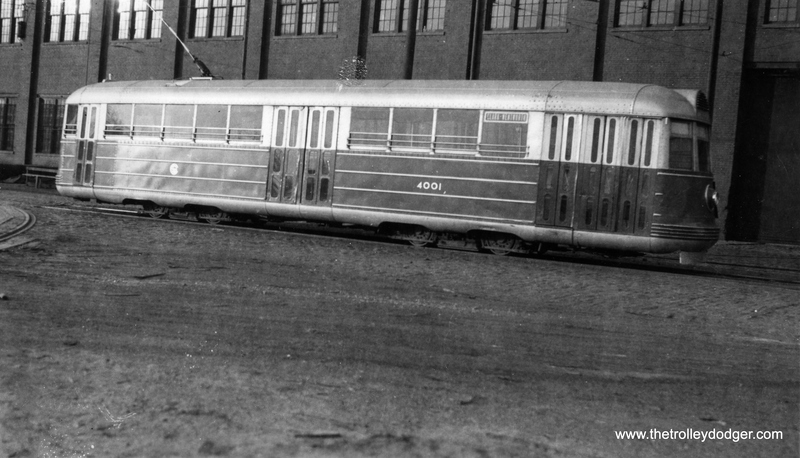 First 40 were delivered in 1944-45 (allocated to CSL by Office of Defence Transportation). 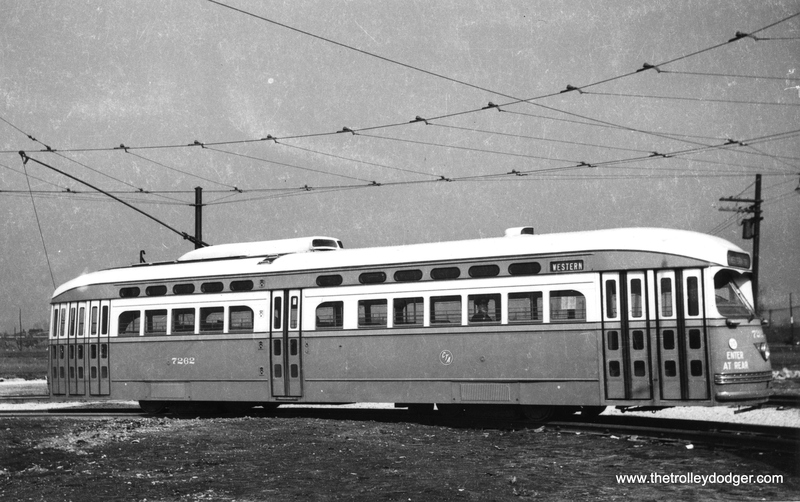 In 1946-1948 257 coaches of 3441-3697 series arrived, last 100 were ordered by Chicago Transit Authority and had some improvements, such as marker lights on the roof, brigher interiors with improved lighting. 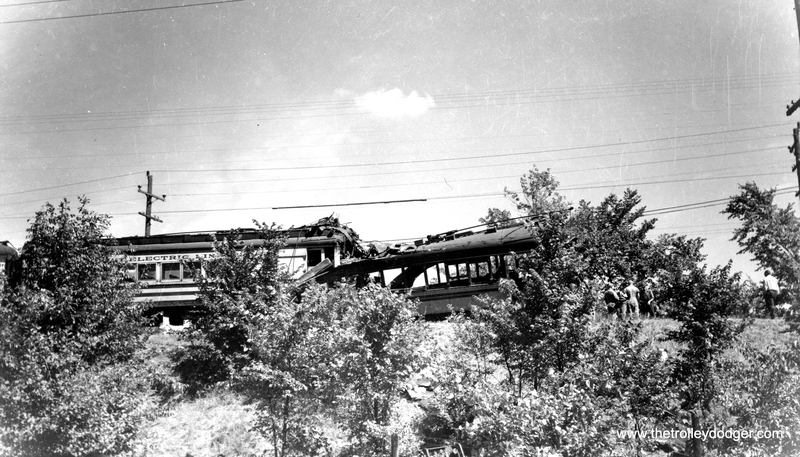 Coaches 3496-3697 were automatic transmission-equipped. 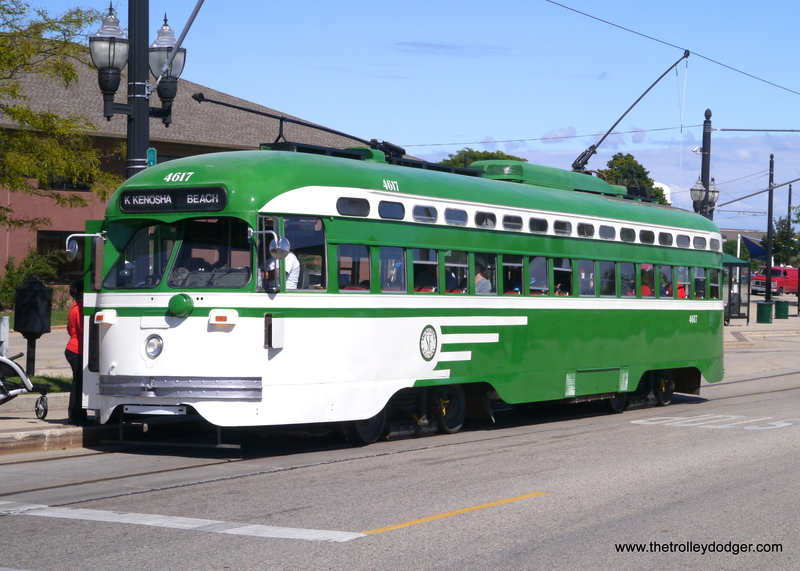 The post-war Whites arrived in then new Mercury green and Croydon cream livery and the fleet was centralized at Archer for turns on the new 62X Archer Express service, CSL first limited-stop bus line, which made its debut on October 21, 1946 between the Loop and Midway Airport. 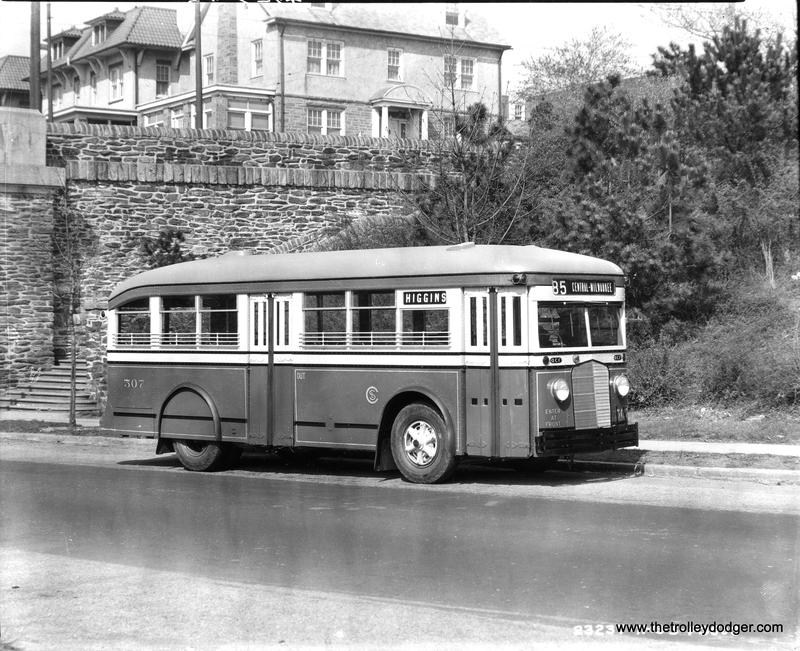 Trolley bus 395 on route 78 – Montrose. 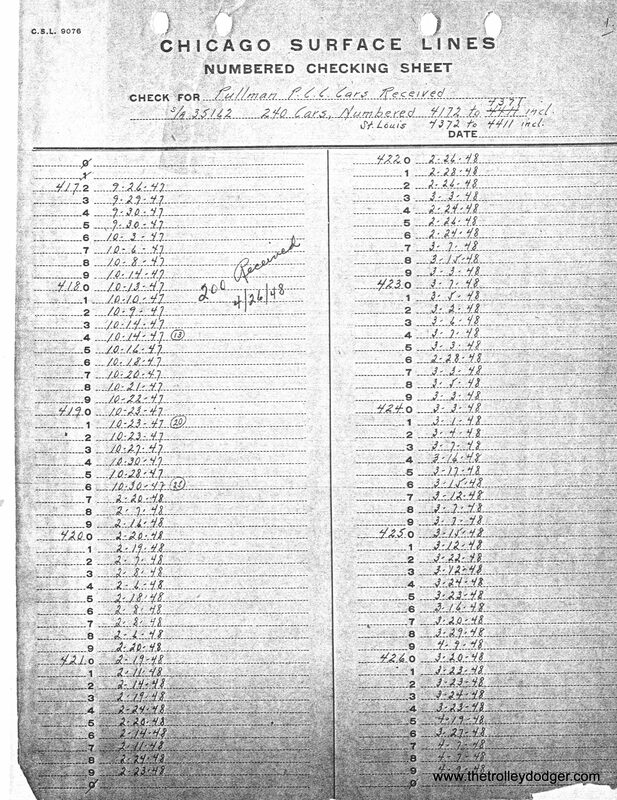 CSL 516, signed for route 57 – Laramie. 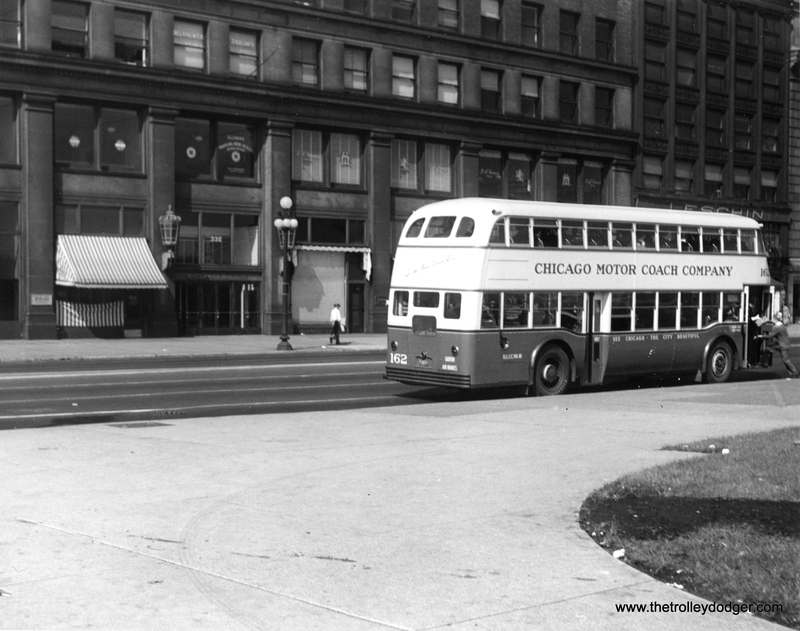 Chicago Motor Coach Company 63 on Michigan Avenue, in front of the Fine Arts building. 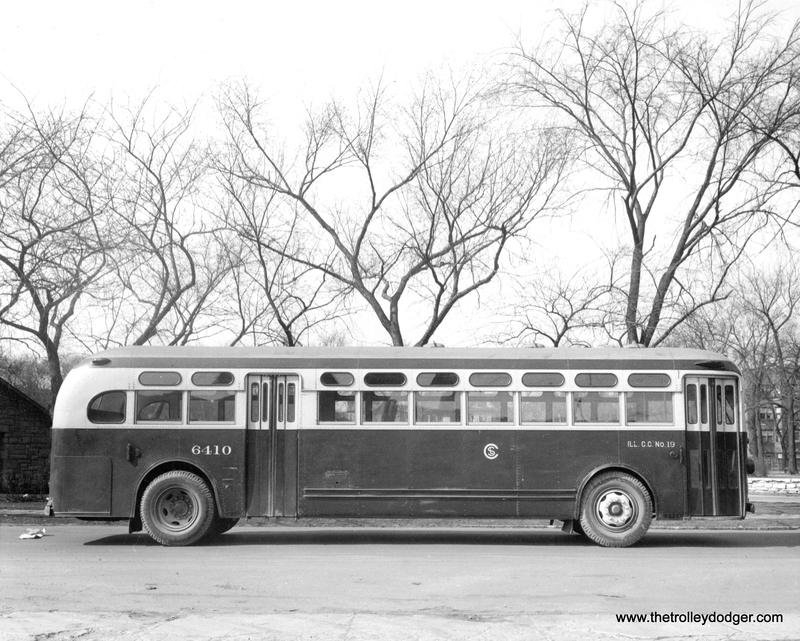 Chicago Motor Coach Company double decker bus 162. 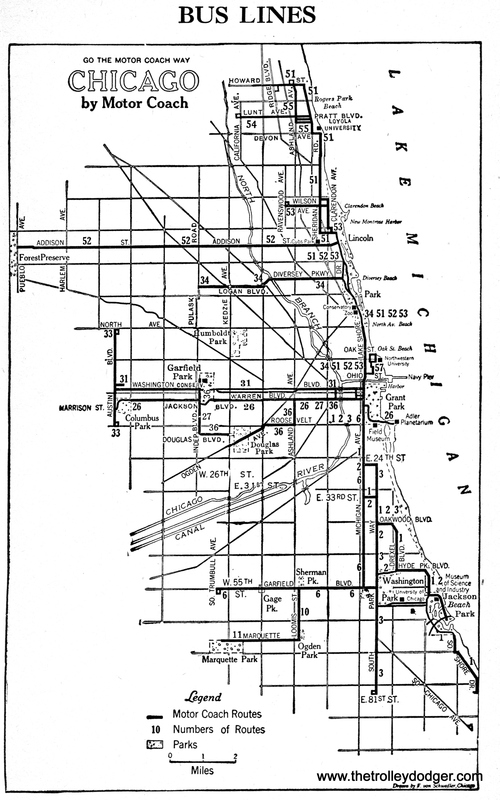 Chicago Motor Coach’s routes as of 1943.